Here is a little photo tour of one of my favorite local haunts. 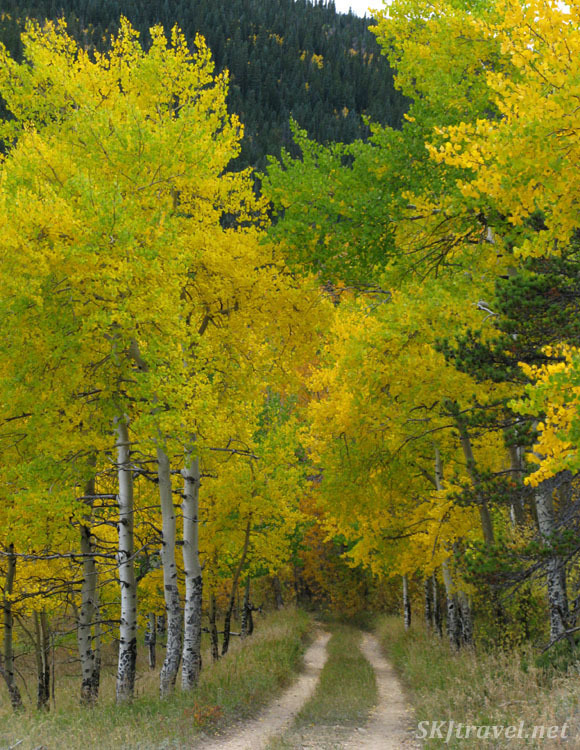 I live in the middle of what was once a large network of gold and silver mines in the Colorado Rocky Mountains. Every mountain town near me, including my own (Nederland), was founded as a mining community, centered either on a mine or a processing mill. There were large mines as well as individuals mining their own small claims. The last house I owned in Nederland, every year debris from the 1800s would surface in my driveway as rain and snow washed away dirt from the cut. I once learned how to date old tin cans and glass, so I could identify most of the artifacts in my driveway to the late 1800s and early 1900s. 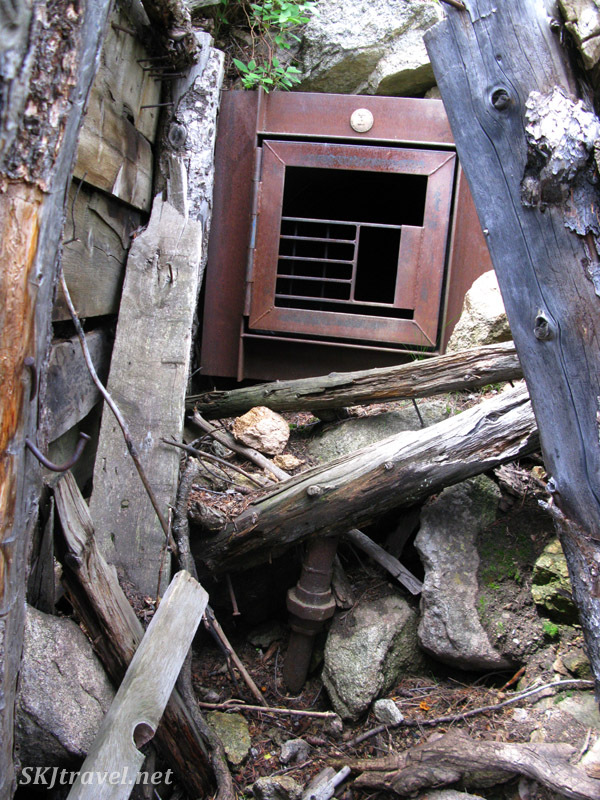 Old cabins and mills lie in melancholy dilapidation everywhere, deteriorating more each year. 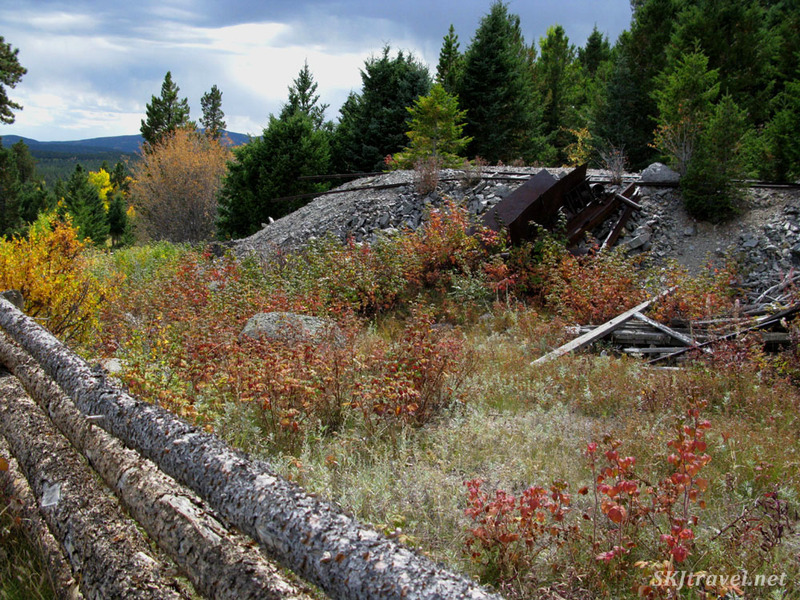 By now, most of the mine shafts in the area have been capped or covered with metal grates, but when I first moved to Nederland over 20 years ago, you could still walk into some of them. 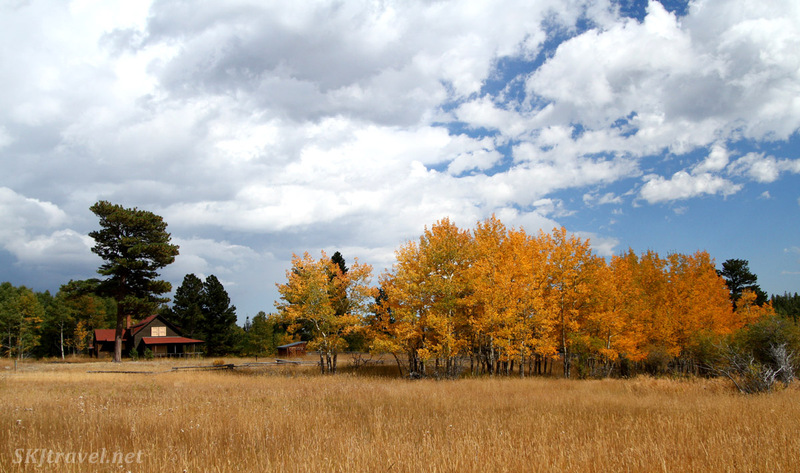 One mine very close to me is the Blue Bird silver mine, which now lies inside the Caribou Ranch Open Space, managed by the Boulder County Parks and Open Space. 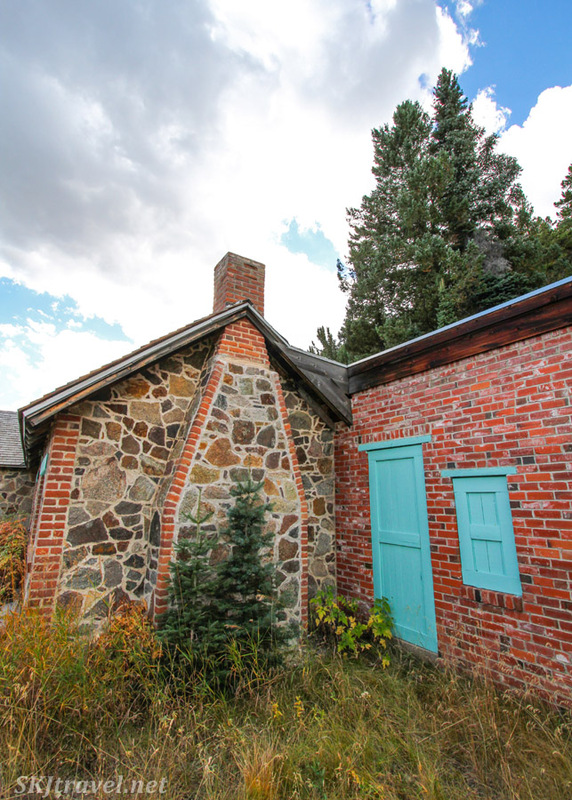 Happily, the Parks department took the effort to stabilize several of the buildings at the old mine and also some old ranch buildings in the valley. Walking to them is both very scenic and super-duper easy. Why so easy? Well, besides the fact they lie in a broad valley rather than over hill and dale, the trail also largely follows an old railroad grade. 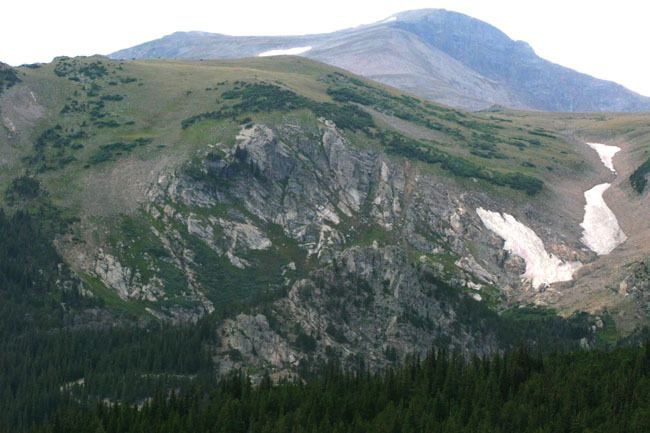 Back around the turn of the 20th century, Colorado enjoyed a reputation as the "Switzerland of America." Capitalizing on this, an extensive narrow-gauge railroad system was constructed to choo-choo tourists through our lovely mountains. It was an important improvement to the residents as well, providing a much easier and faster way to transport goods and supplies to and from mining towns than treacherous wagon roads through the mountains. 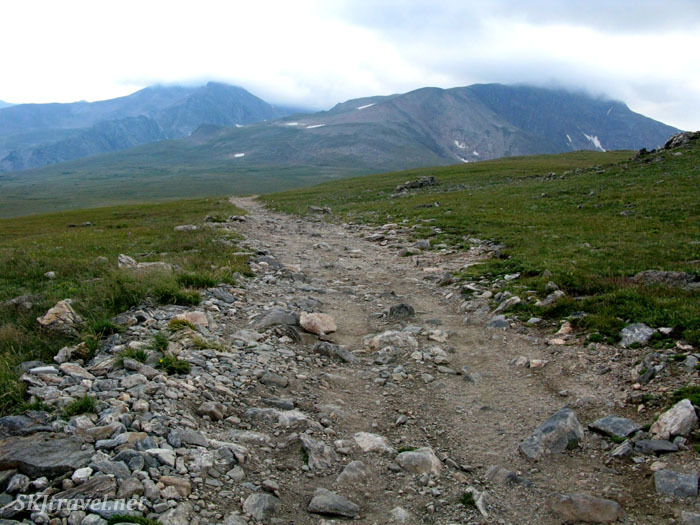 The route was known as the Switzerland Trail. Well, it still is called that, but the tracks have all been torn up and the grades are now either 4x4 roads or hiking / mountain biking / horse riding trails. 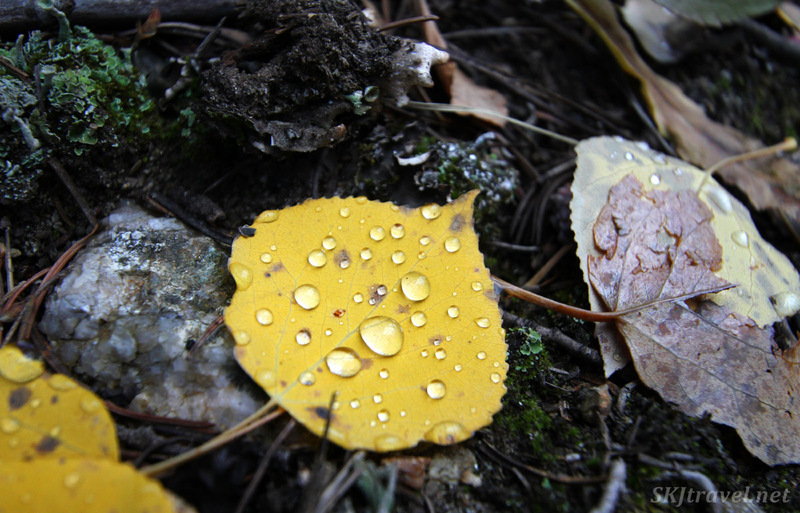 This year I found lots of aspen leaves on the ground sprinkled with dew. 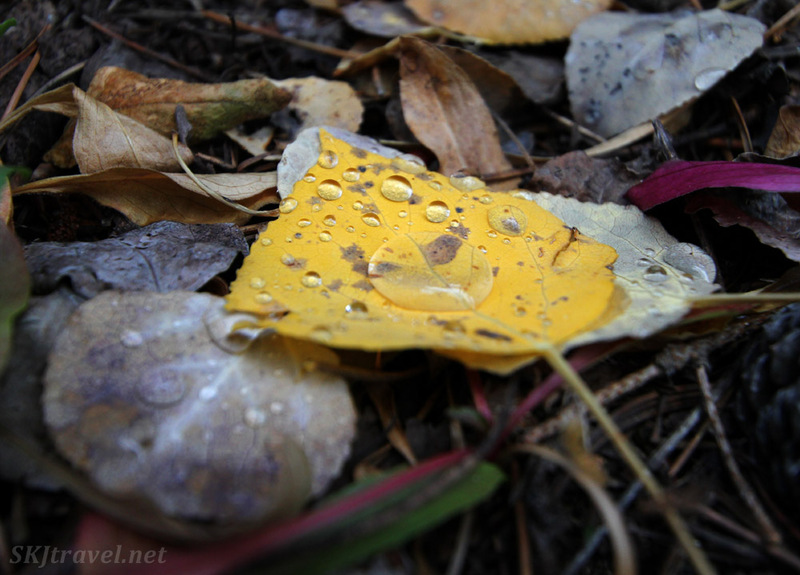 I'm really partial to leaves and flowers with water and dew droplets on them. 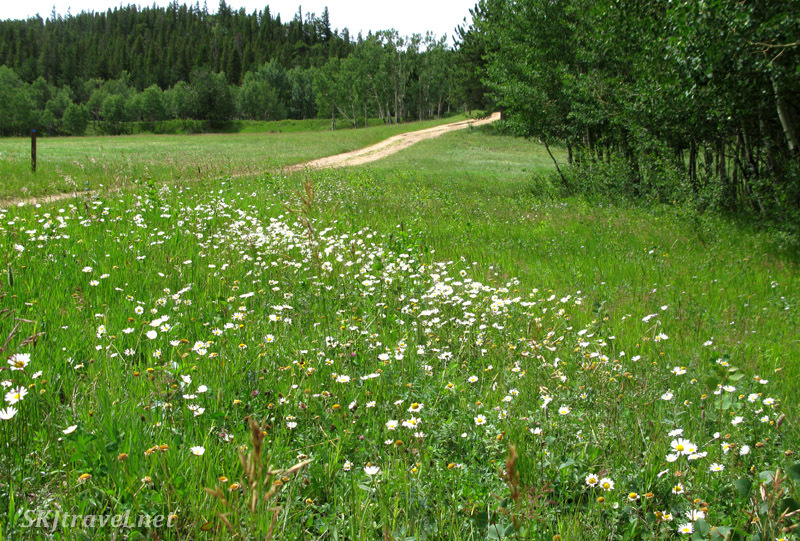 And here's one shot I got in early summer of the trail ... this section is rife with daisies in summer -- from afar, it looks like a field of snow, then magically resolves into hundreds of individual daisies. Not an awesome picture, but you get the basic idea. 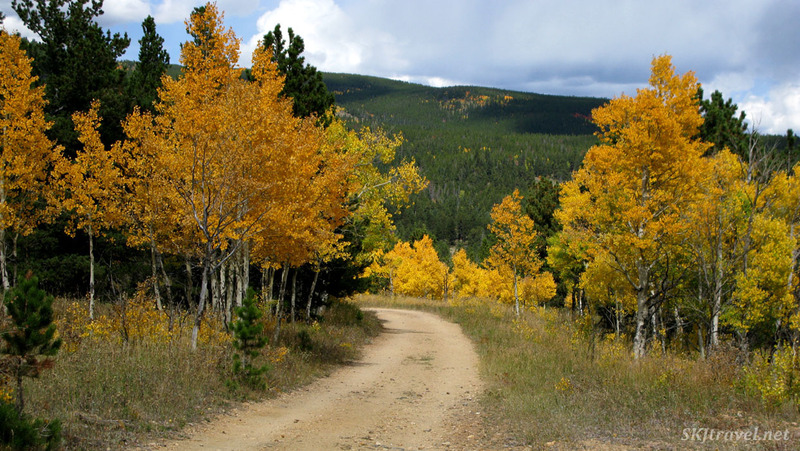 Along the way to the Blue Bird mine, you pass the wide valley (where the elk calve). In it is the historic DeLonde homestead. 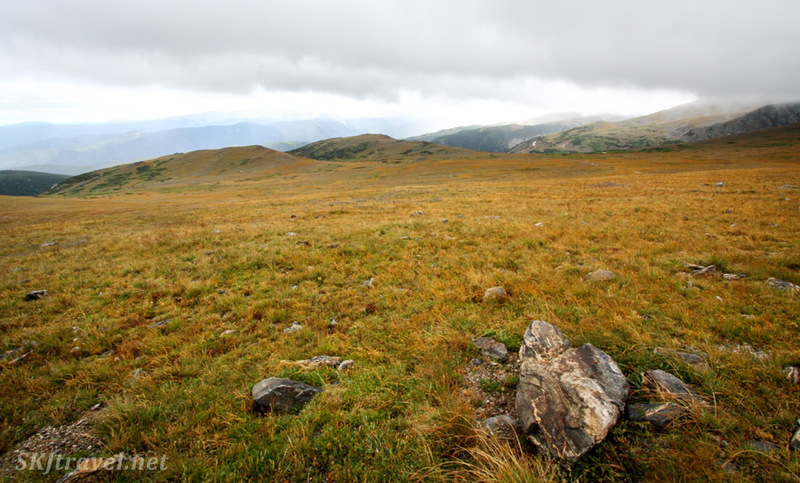 The DeLondes first moved here, as nearly everyone did, to be involved with mining, but eventually became ranchers, and they sold the land to another ranching family who raised Arabian horses. 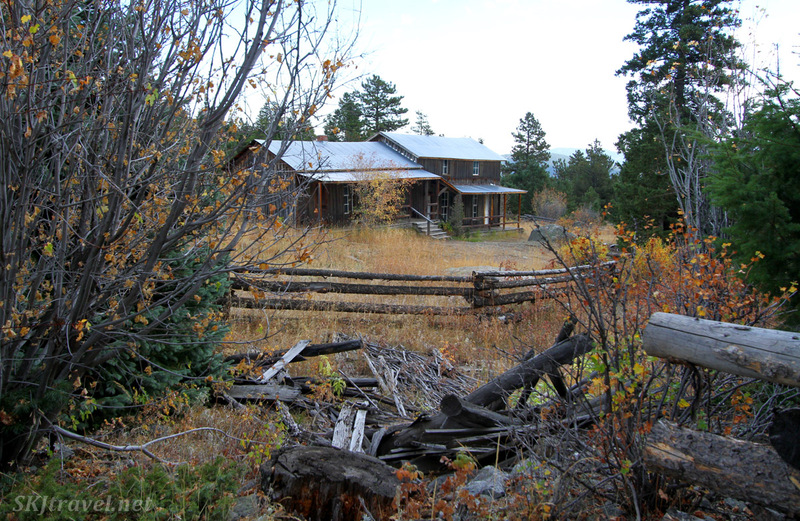 The next sale was to a Mr. Guercio who was in the record business, and beyond view, in an area restricted from the public, is the old Caribou Ranch recording studio where the likes of Elton John, Joe Walsh, Chicago, Steven Stills, Waylon Jennings and many, many others recorded albums -- even John Lennon came here to record a song with Elton John ... kind of a random tidbit about tiny little Nederland that we had so many famous people stay here and make an album in the middle of the Rocky Mountains. The first house I owned in Nederland was apparently partied in on occasion by Mr. Steven Stills. 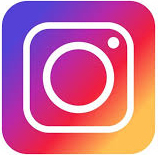 Check out this brief video about the recording studio. Part of this valley is filled with a wetland habitat which was "constructed" by some industrious beavers who have built dams which have formed a series of ponds. 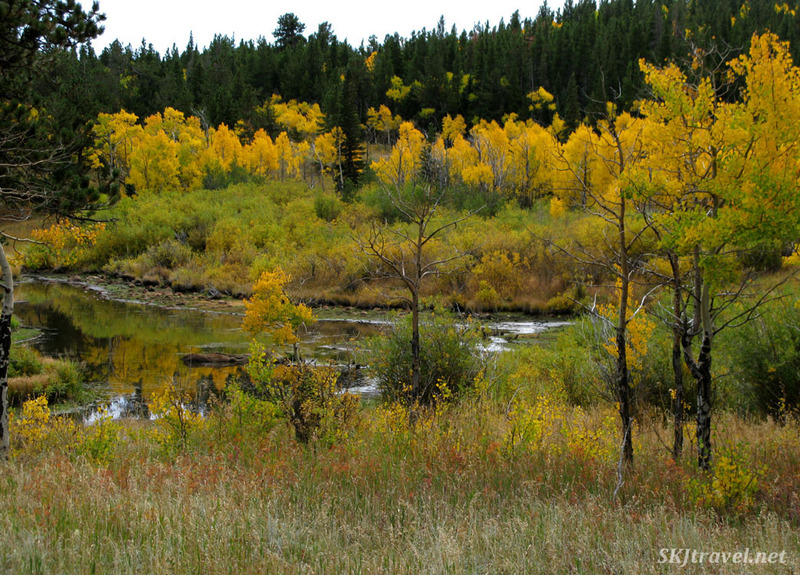 I have never seen a beaver around here even though there are many beaver ponds in this region. I am just dying to spot one in the flesh! And now we arrive at the old Blue Bird mine. 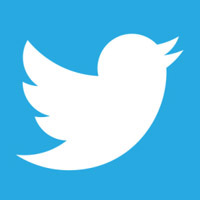 It wasn't christened as such for the bird or the fowl's melodious name (I like the word "bluebird"), rather for a type of blue mineral, azurite, found inside the earth along with the silver for which the mine was established. 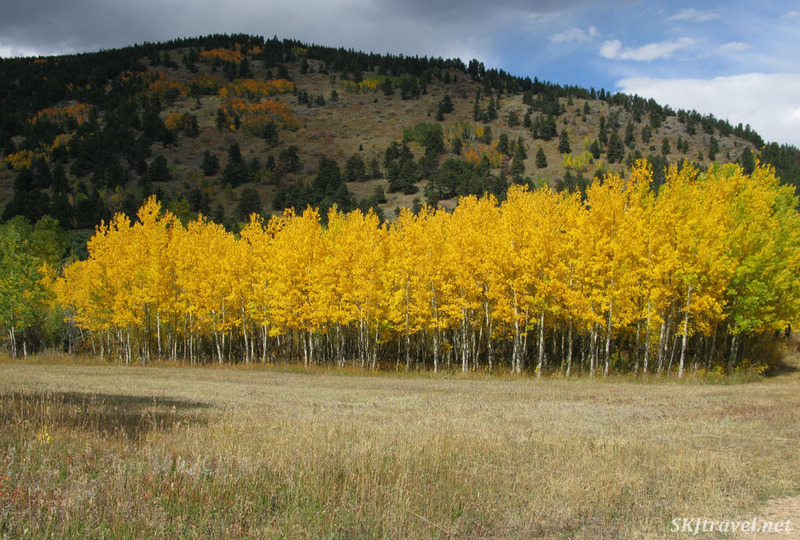 According to the Boulder County Open Space website, "Azurite was known to the Ancient Greeks as kuanos, which means 'deep blue,' and is the root of the English word cyan." Here are a few pics of the mine itself, though the entrance is blocked, you can feel the cold air coming from inside if you stand next to the grate, and the mining cart tracks still emerge and lead into a pile of tailings. 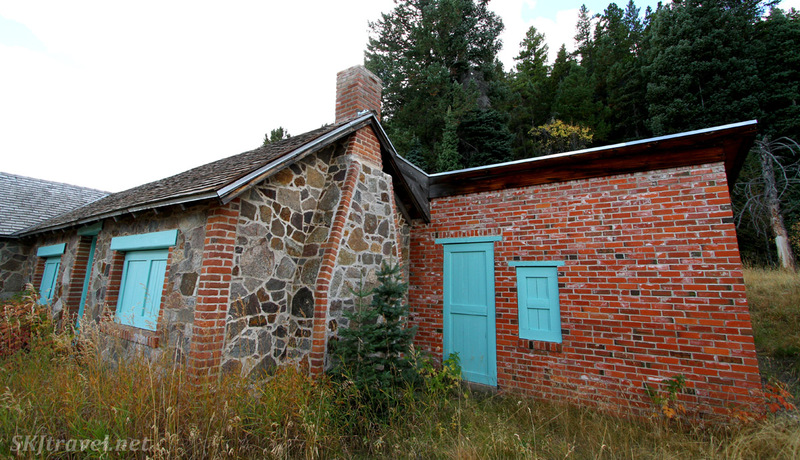 This building was originally the bunk house for the working miners. When the mine waned at the advent of a crash in silver prices, the Switzerland Trail railroad began bringing tourists to the area. 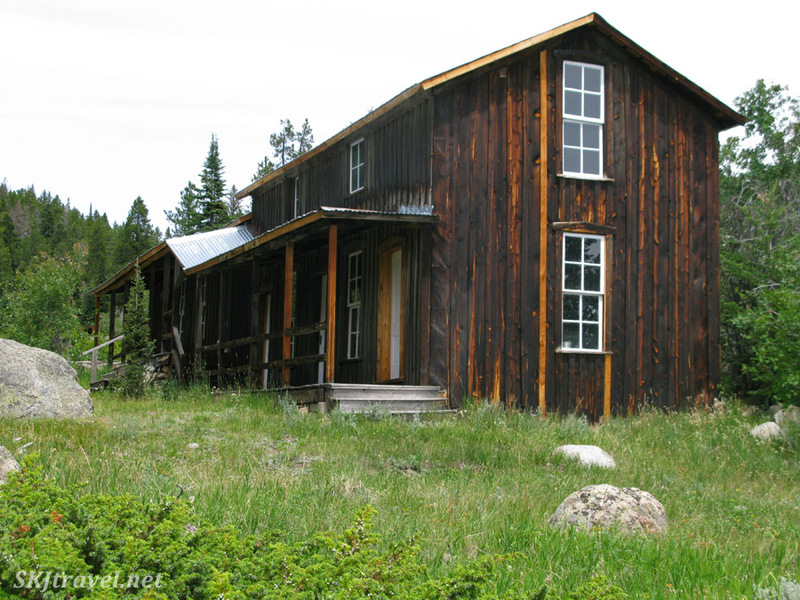 The Blue Bird mine became a whistle stop on the train route and the bunk house was converted to a boarding house for visitors over-nighting. 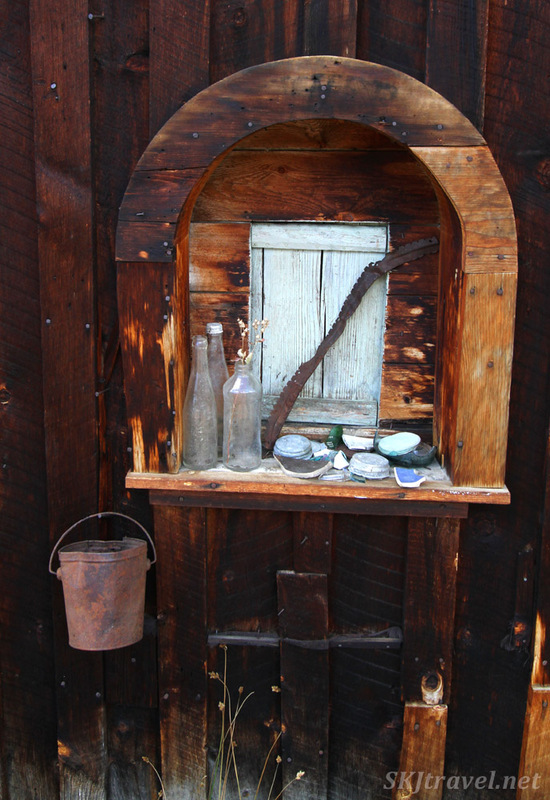 I love the assortment of artifacts people have found and assembled at what I believe is the old ticket window for the train. The 1965 remake of the movie, "Stagecoach" was filmed here and the bunkhouse was depicted as a stagecoach stop. So in addition to the musical artists who visited here, Bing Crosby and Slim Pickens also left their footprints. 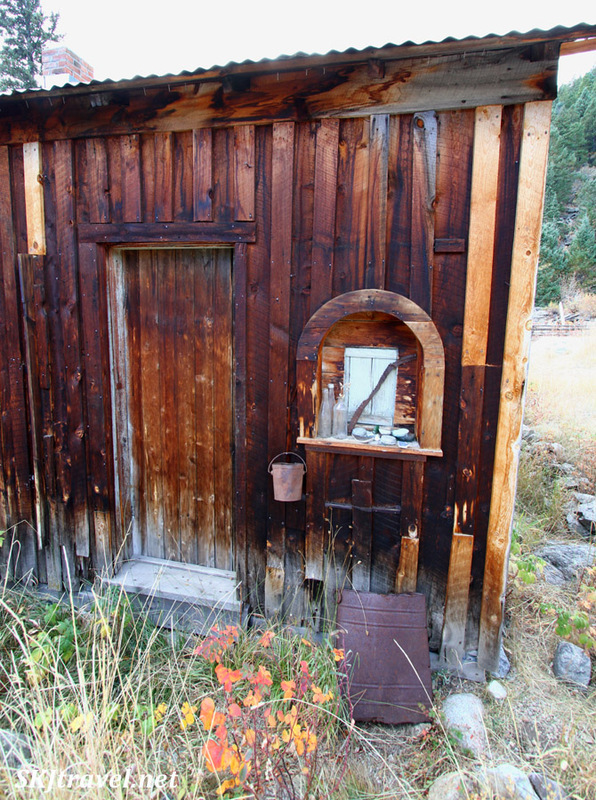 The chicken coop is still intact as well as some outhouses and sheds, all of which are wooden. 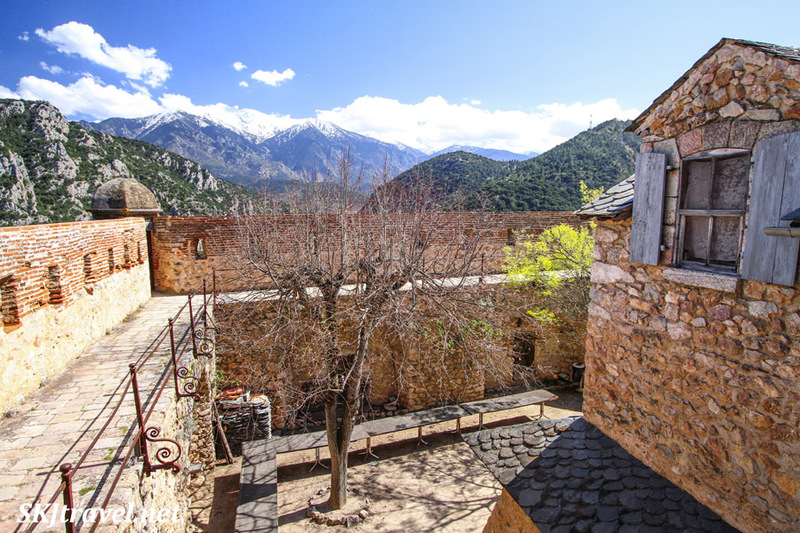 Most of these were built in the late 1800s, but the caretaker's abode built later was a solid structure of stone and brick. 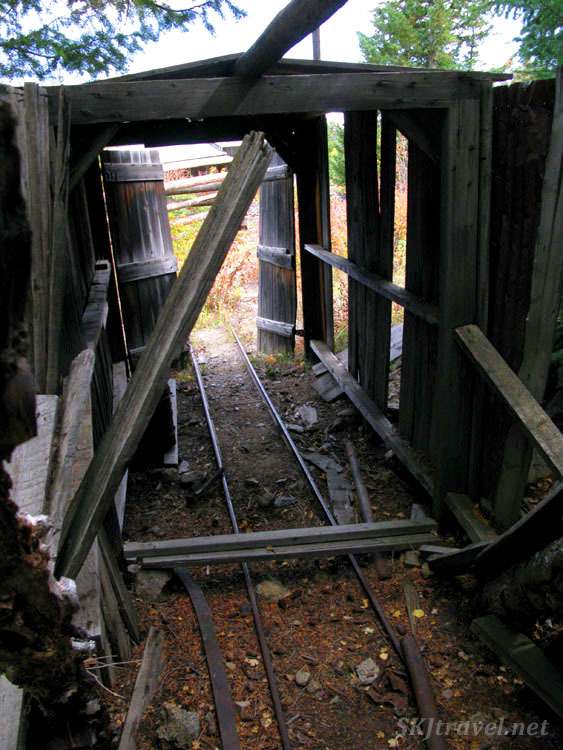 The mine ran on and off over nearly 100 years, closing forever in 1964. In an amazing coincidence, I met a man whose family was the last caretakers and he spent part of his childhood here at this house in the summers in the 1950s. He doesn't live in the area and I met him through a friend who lives on the East Coast whom I met in Prague. Random, small world! I don't have a photo of it, but in front of the house is a large cement pit for a pool which was eventually used just to hold trout. 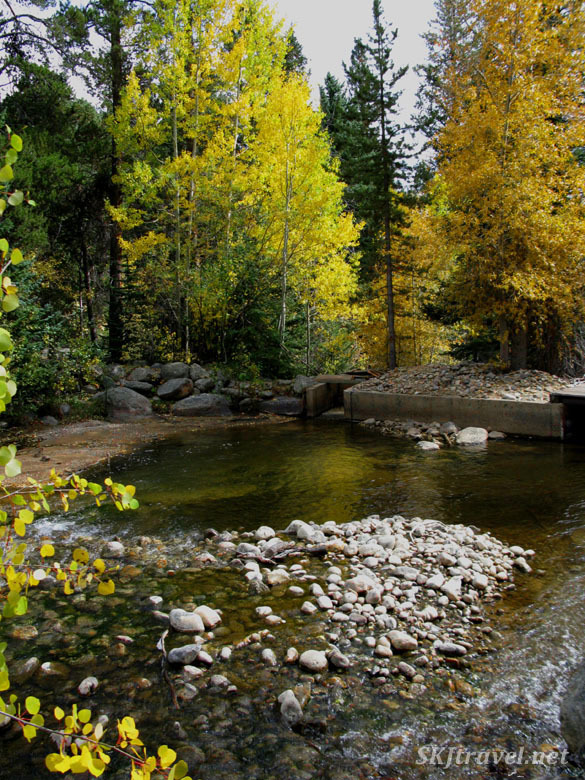 Just behind the bunk house runs the North Boulder Creek, and the hiking trail that leads from the Blue Bird mine to the DeLonde homestead parallels the creek for awhile. 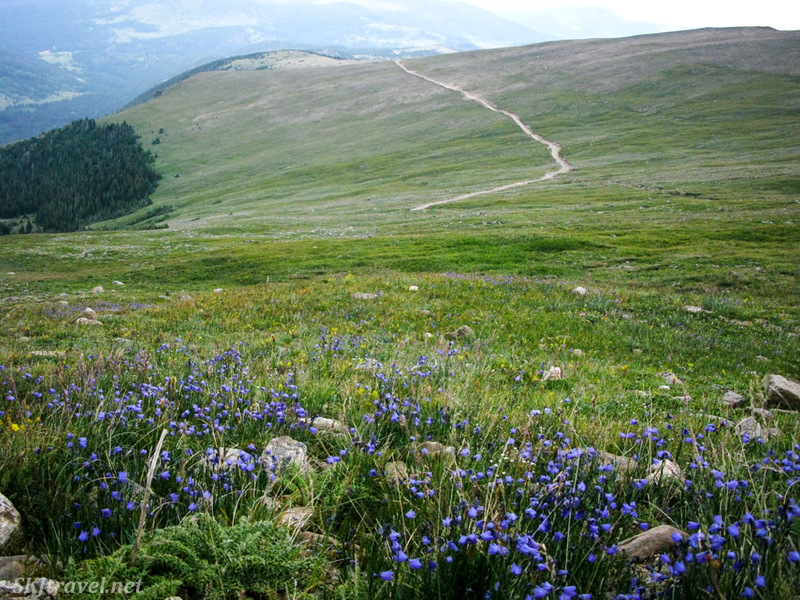 So this is just a delightful and easy hiking loop that I recommend to all who visit me here in Nederland ... you have beautiful landscape with dynamic seasons, a creek, a valley, mountains; and you have many historical components that gave our little nook of the world its multi-faceted vitality. A little end-note ... every year Nederland hosts our town's heritage weekend, called "Miner's Days." When I first moved here it included a parade and everything, and most of the athletic competitors were aging local miners. Now, there's no parade, only the athletic competitions, but what's cool is that even though the old "real" miners have dropped out of the competitions or passed on, there are a lot of young competitors. This year (2015) there were up to 10 entries in the events and also a women's competition -- they did all the same events as the men. The competitions are all activities that miners of old did every day ... such as mucking, where you shovel dirt or rocks into a mining cart as fast as you can until it's full then push it down some tracks and empty it; spike driving, where you pound railroad spikes into a wooden trestle with a sledgehammer to secure a track; hand drilling, where you use a hammer to drive metal spikes into solid granite rock as deep as you can in 5 minutes ... this is how holes were hollowed out in the rock to put dynamite in to blast the mine tunnels and also build the railroads. We're a very small town but take pride in our founding heritage. 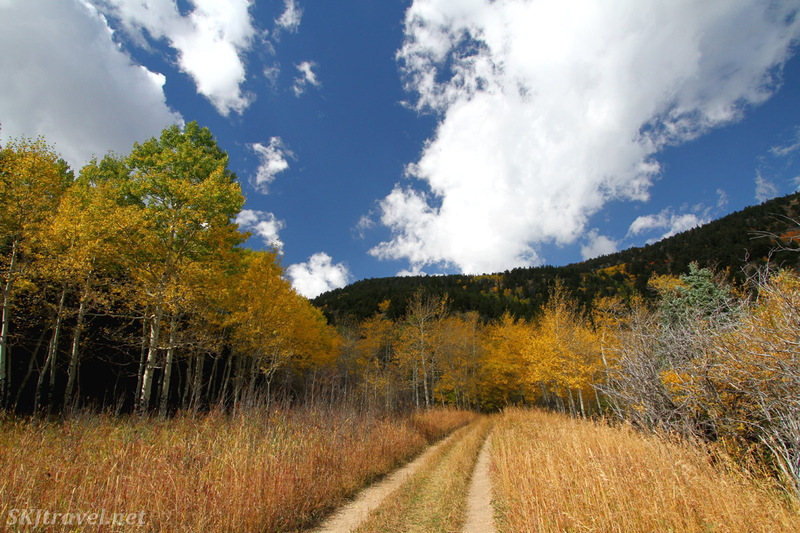 Want to visit Nederland and the Switzerland Trail? You can come stay with me! 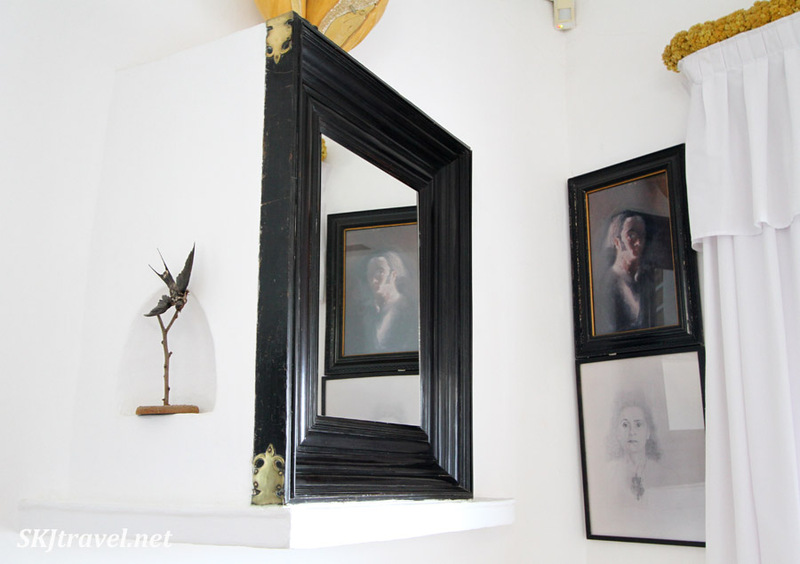 I rent a small studio at my house to vacationers and would love to have you visit me. 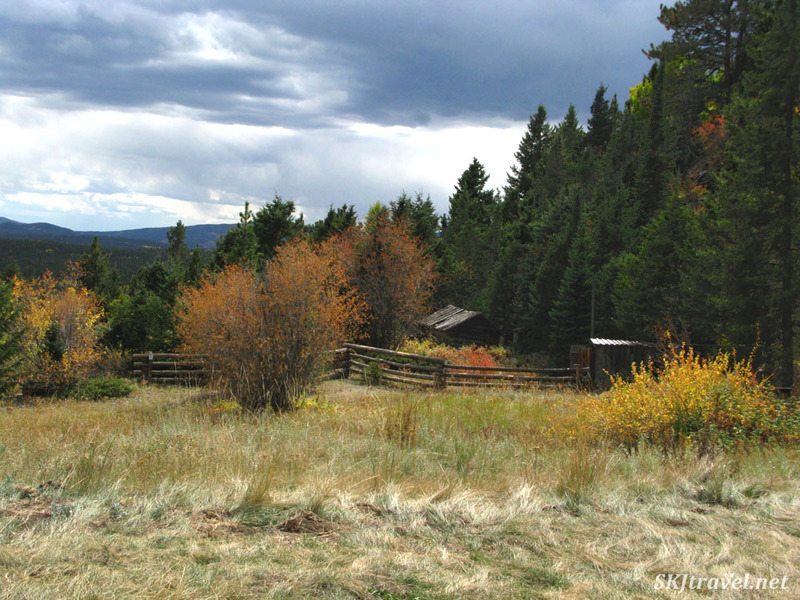 See my listing at: https://www.airbnb.com/rooms/59868 for "Cozy and Quiet in Nederland." 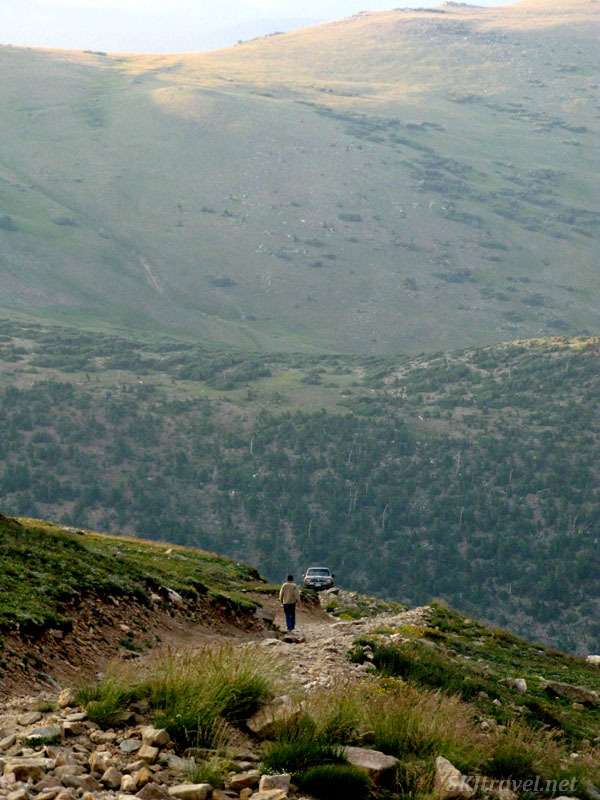 Another of our favorite 3-hour tours from my home in Nederland, Colorado, is the 4x4 route over Kingston Peak pass. 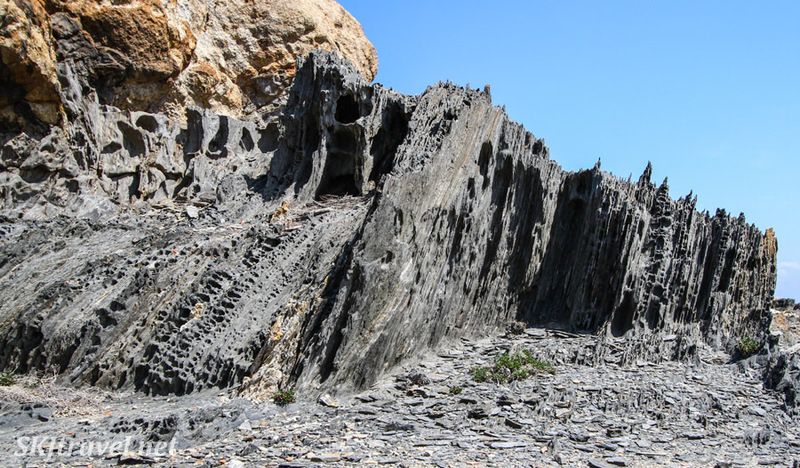 This one is a bit of a doozy in places -- definitely the most difficult terrain we have yet explored. Well, save one stretch of trail we did years ago in Jenny Creek that took us about 45 minutes to move about 3 feet forward. 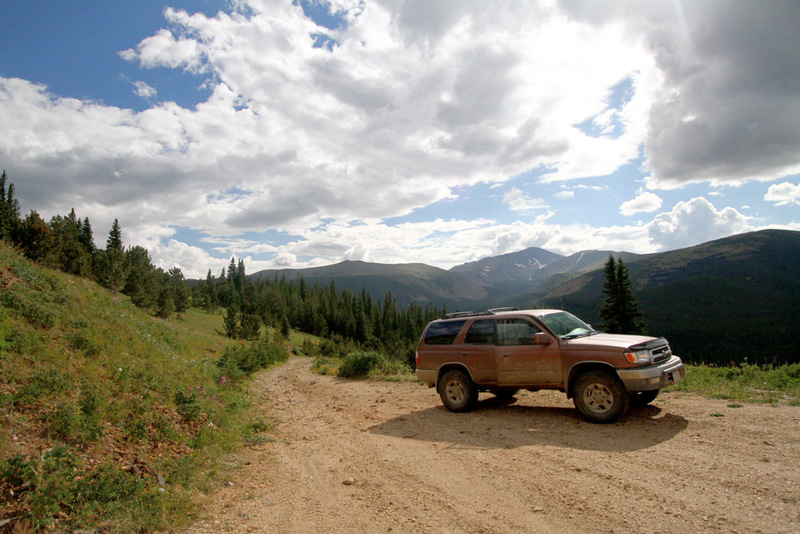 Our 4-Runner, Trusty Trudy, was precariously balanced on only two wheels -- one front wheel and one back. As we inched forward, literally inch by inch with me spotting continually and Erik getting out to survey and strategize every few inches, I also had to hang off the outside of the opened driver's-side door with all my weight to ensure Trudy didn't tip over on her passenger side. It was clear from various forms of evidence that previous travelers had spent a long time trying to get past this spot, as well. 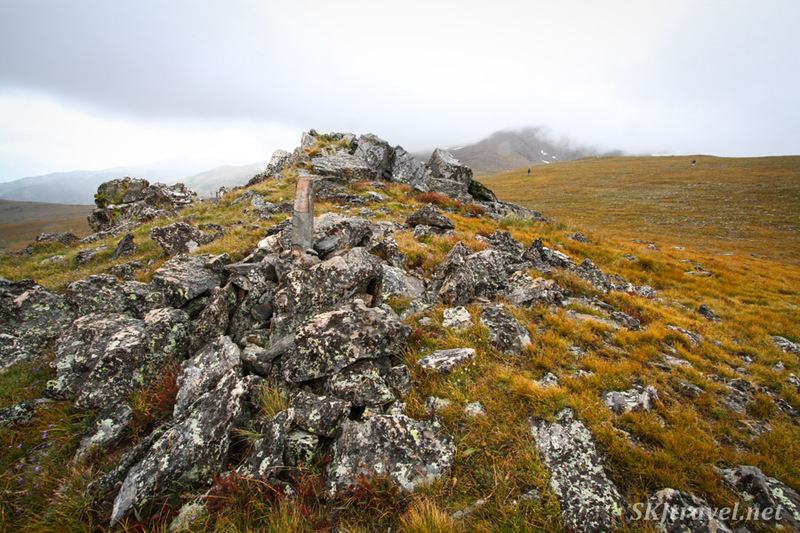 The first time we attempted Kingston Peak with Trudy, we were turned back by one egregiously large boulder on a steep skree slope. Later that summer we made a second attempt and met with success. This year we have a new ("new" 1999) 4-Runner named Chewbacca. Chewy is a beast on this terrain with higher clearance than Trudy and a mean grunt in low gear. We love him. We started trying to get to Kingston Peak early in the summer. Every two weeks we went out, as the snow melted we got higher and higher each time. It was I think our fifth outing when the snow had finally melted enough for us to summit. We just chugged right over that boulder that had given Trudy such a headache. 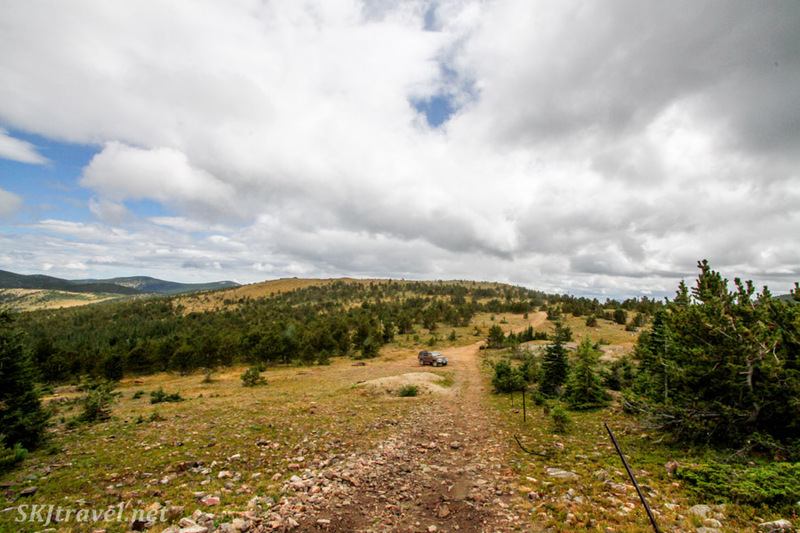 We then went over the route a second time in late August when we took a friend out to show him what our backyard had to offer in 4x4 trails. 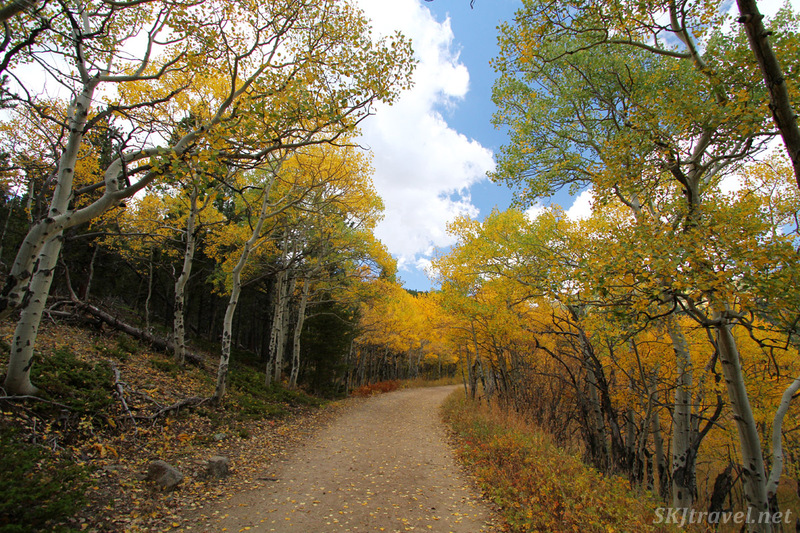 As you may have read in the Gamble Gulch post, most of these trails originated as old mining roads ... people were crossing them in wagons. 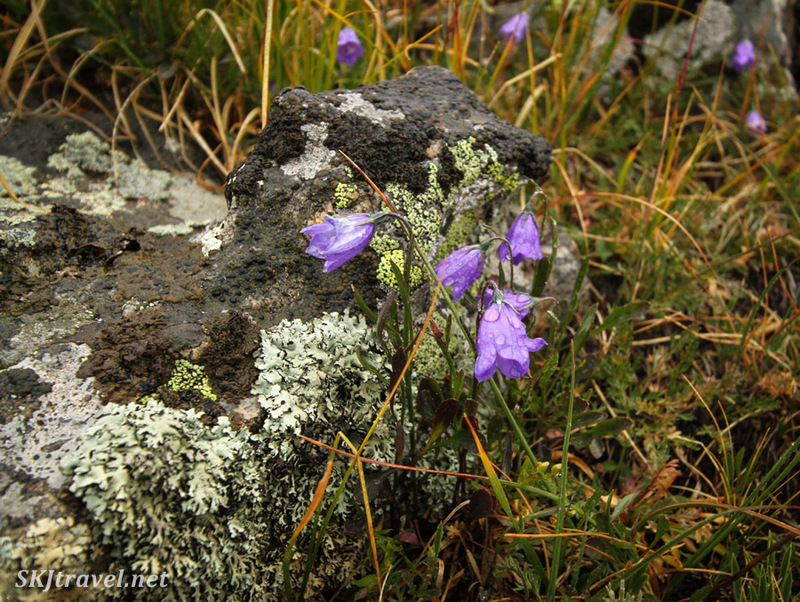 So by now we have crossed this terrain in early, mid- and late summer. So I present to you a little photo tour through the seasons. 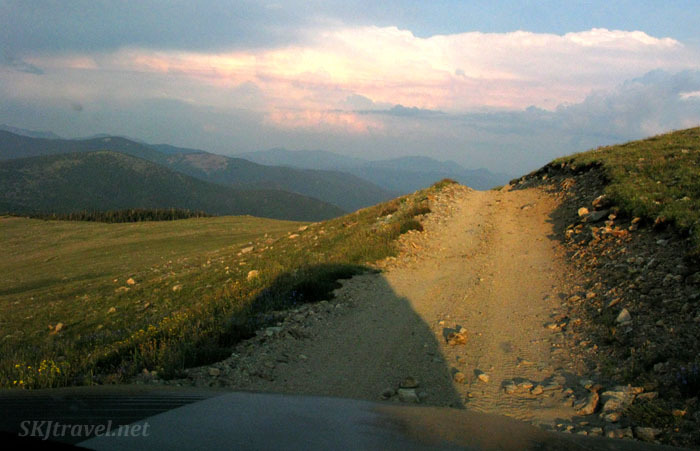 If you are thinking of trying this route yourself -- from Mammoth Gulch Road over Kingston Peak to Fall River Road -- know that I'm not understating the requirement of a high-clearance vehicle with low-4 gearing. 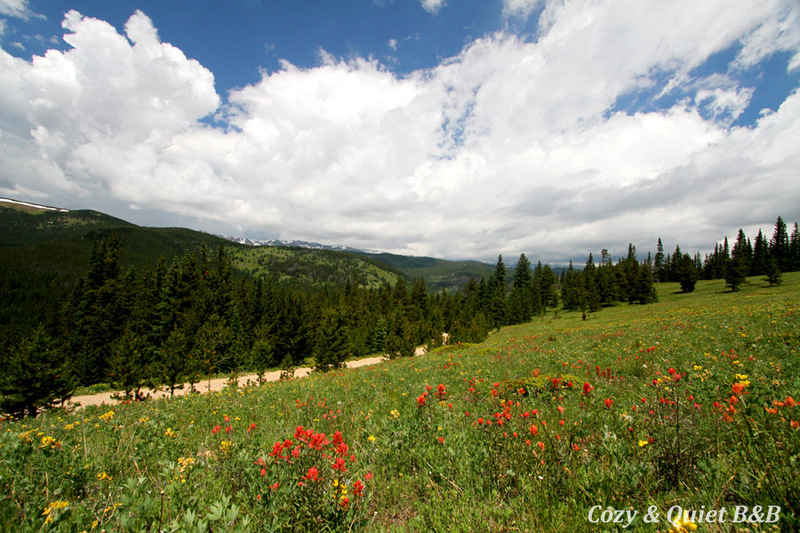 The wildflowers along the lower part of this route (upper Mammoth Gulch) are spectacular. 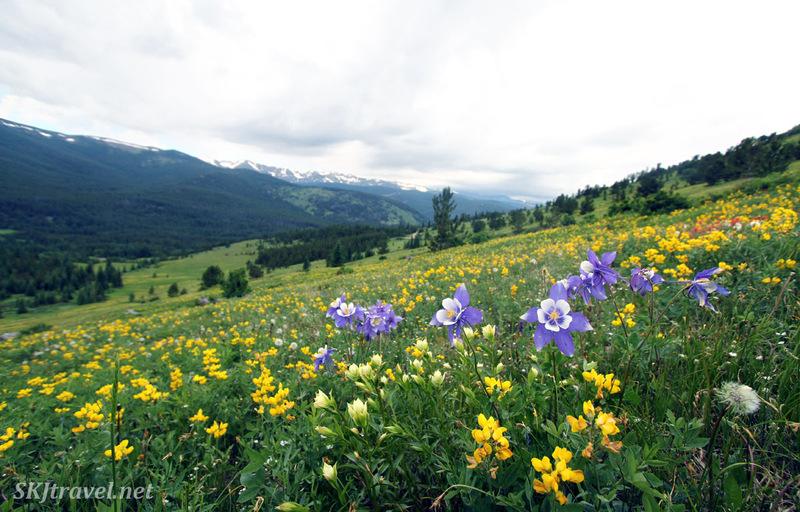 The season begins with a sea of yellow pea in bloom dotted with clumps of our state flower, the blue columbine. 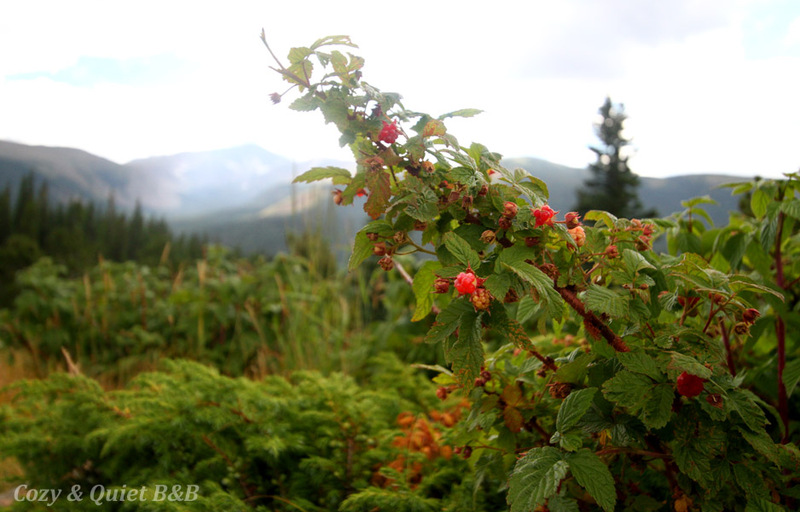 We love collecting wild raspberries from this area. I'll keep it a little secret precisely where we go ... there are many side roads. :) The character below is our new guy, Chewbacca. Our first attempt with Trudy ... you can see her hood just peeking up over the horizon of the trail and Erik walking back toward her after we left her temporarily to see if there were any other show-stopping obstacles ahead. Our second attempt with Trudy ... success and the reward of copious wild bluebell flowers, also called harebells, which I absolutely love. As you can see, we were traveling at our usual time of late in the day. 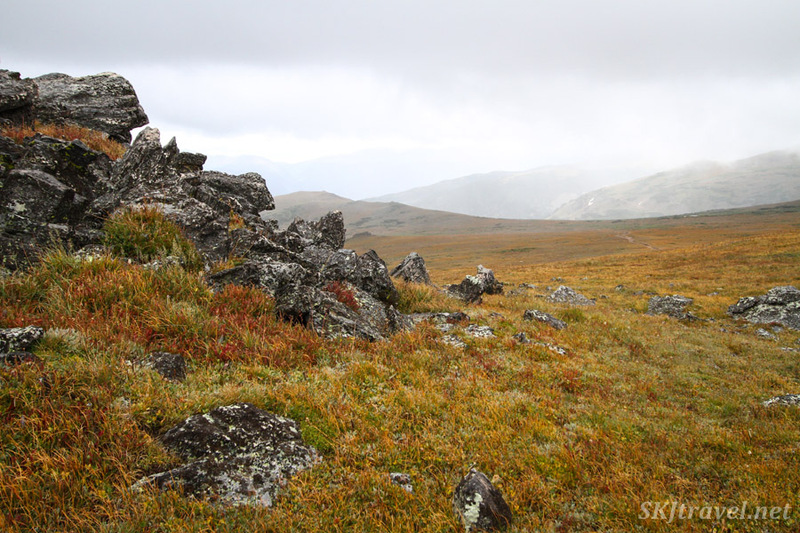 This year when we made our first crossing, I was very excited because it was a rare blue sky above the mountain peaks and we could clearly see the layers and layers of mountains heading back into the heart of the Rocky Mountains. I had brought my camera and as I clicked the shutter with glee for my first pic, my smile turned a little upside down when I realized there was no memory card in the camera! I had left it in my computer from downloading some other pics. So the beauty of that day is just in my private memory. The next time we crossed it with our friend in late August, we had pretty much the polar opposite sky ... low and heavy with fog and rain. But it lent the route an air of secrecy and mystery. 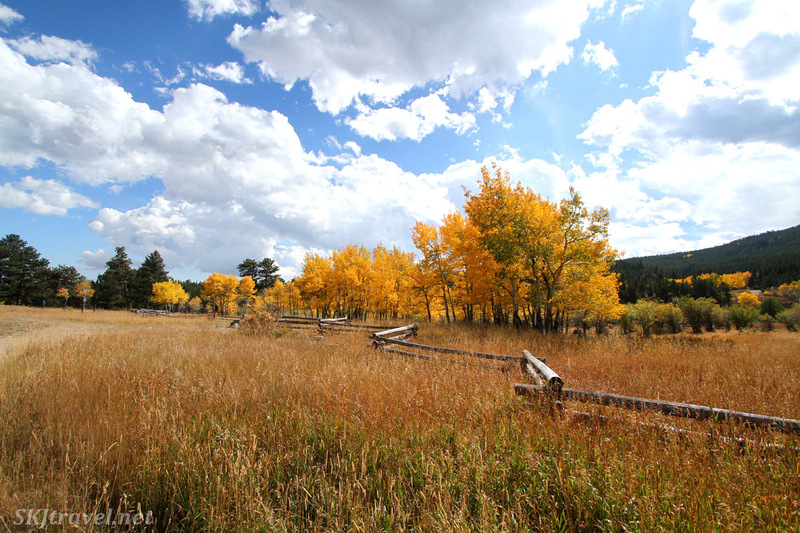 By now the green grass was largely turning to gold and red. Chewy seems like such a sizable truck until you get a little perspective of his place in the mountain landscape. 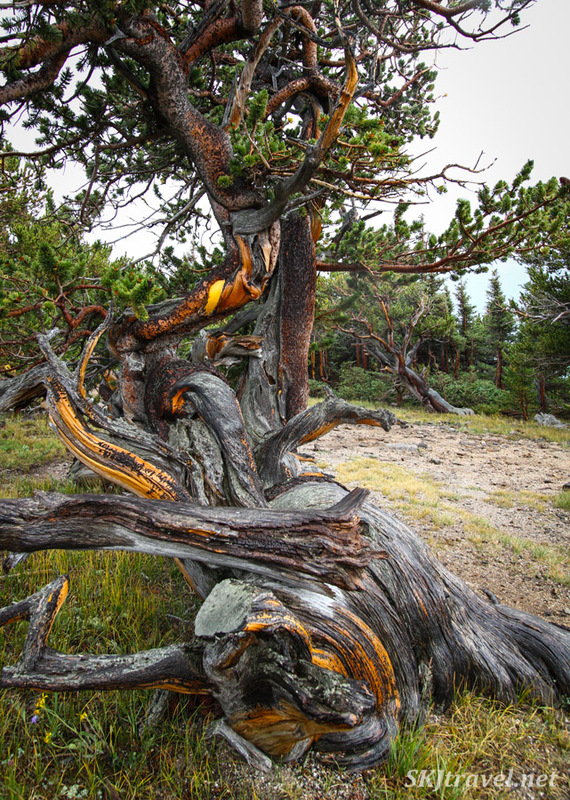 Once you start descending the other side down toward Fall River Road, you are treated to a Seussian forest of wind-sculpted trees. 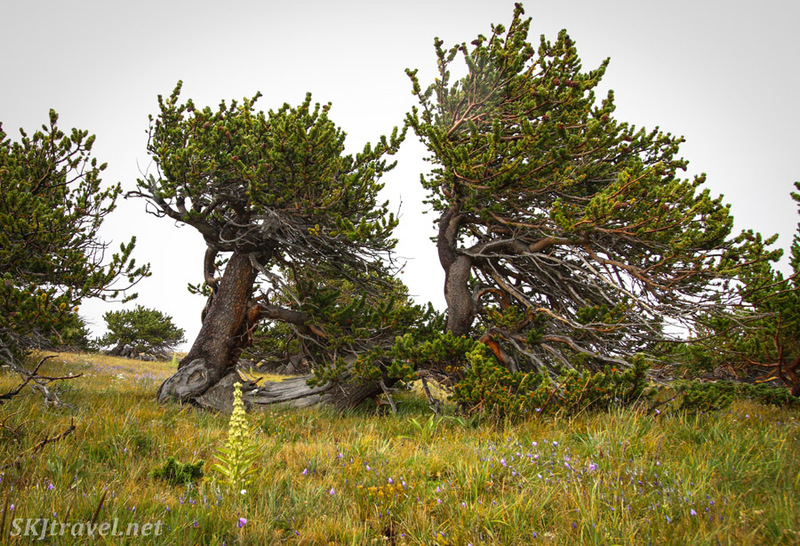 Can you guess which direction the wind blows? :) Some day I would spend more time exploring this little forest that marks the beginning of treeline. 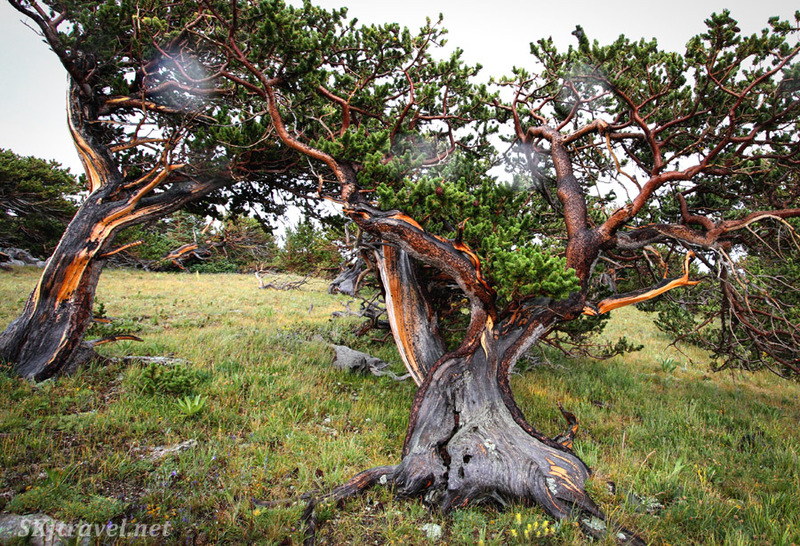 Such fantastical shapes and colors in the trunks. The doors of summer are closing already this year. But I imagine, as we've become quite fond of this route, that we will be back soon. And maybe my memory will allow the inclusion of a memory card inside my camera! 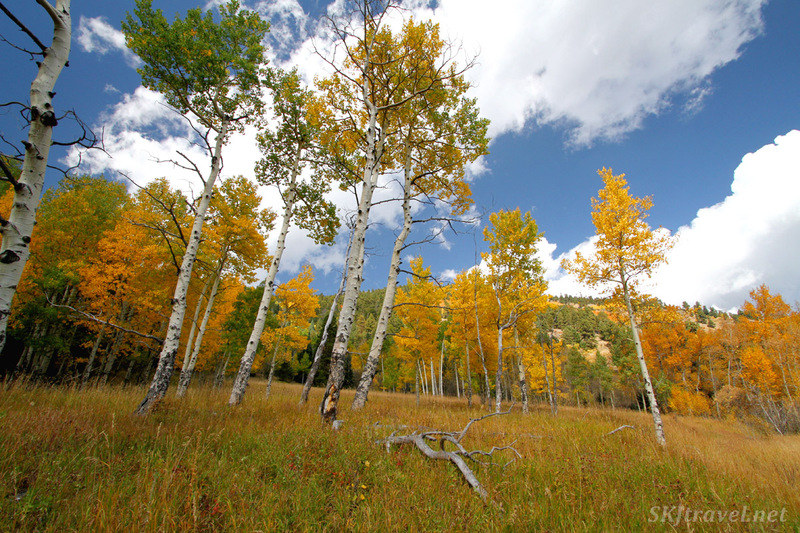 Check out the excellent photography of my friend, Garett Gabriel, much of it taken in Colorado in the Nederland area. 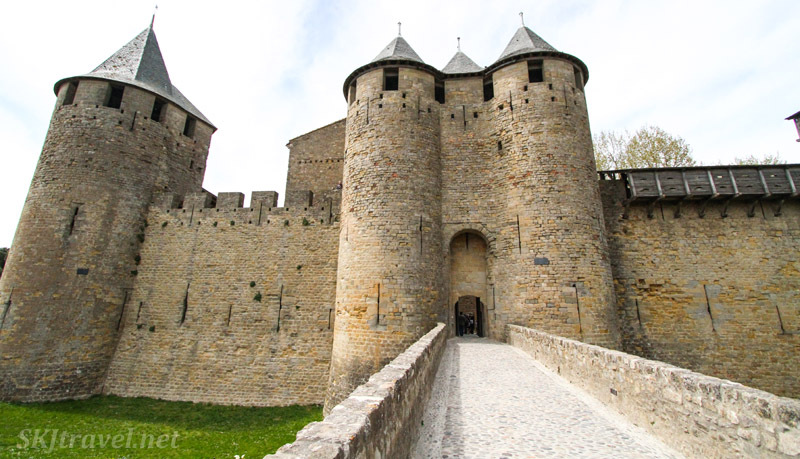 While we stayed in Andorra, we breached the border a few times (as it is so quickly and easily accessed at either end of the country) to see some sights in the surrounding countries of France and Spain. 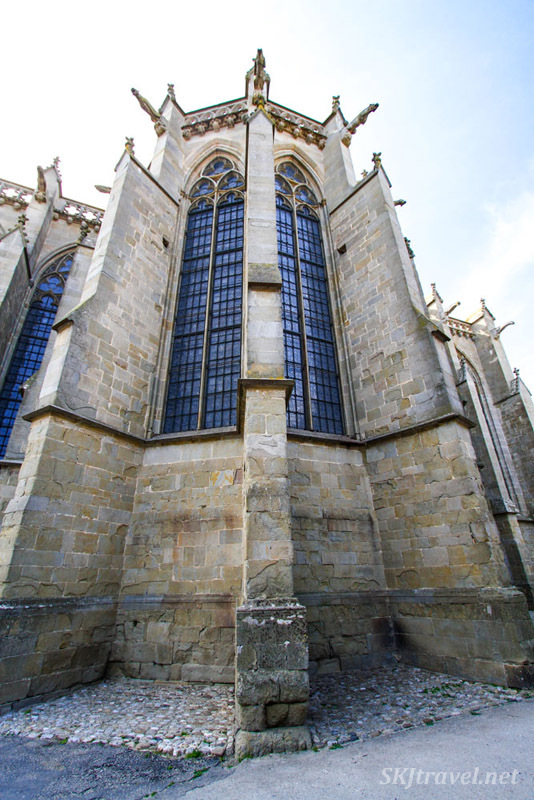 I'm making this post about day trips to France with pretty much one single motivation ... which is simply to share some of my photos from these sights, as I was having so much fun with my wide angle lens (10-22 mm). It's more fun to share the fun -- haha -- than to keep it locked in my own little computer. Plus, maybe it will inspire you further to visit this delightful corner of the world. So, without further ado or much accompanying text ... 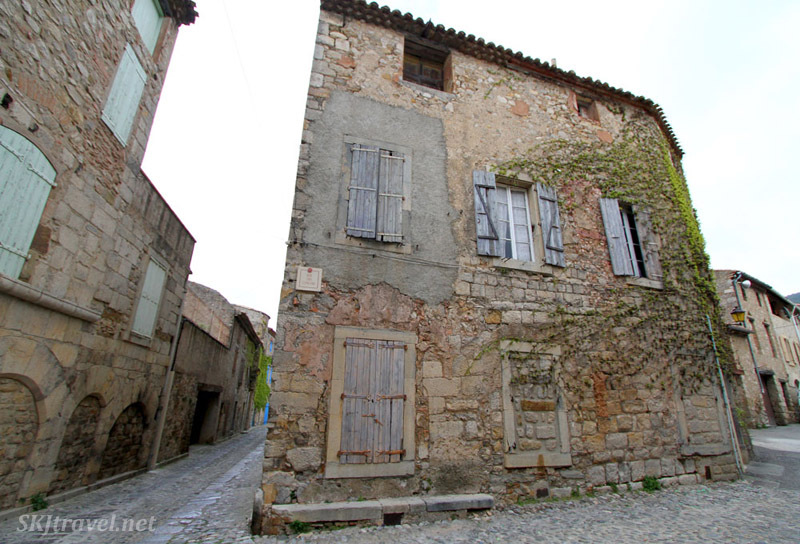 I give you a slice of the French Pyrenees and the Languedoc region. 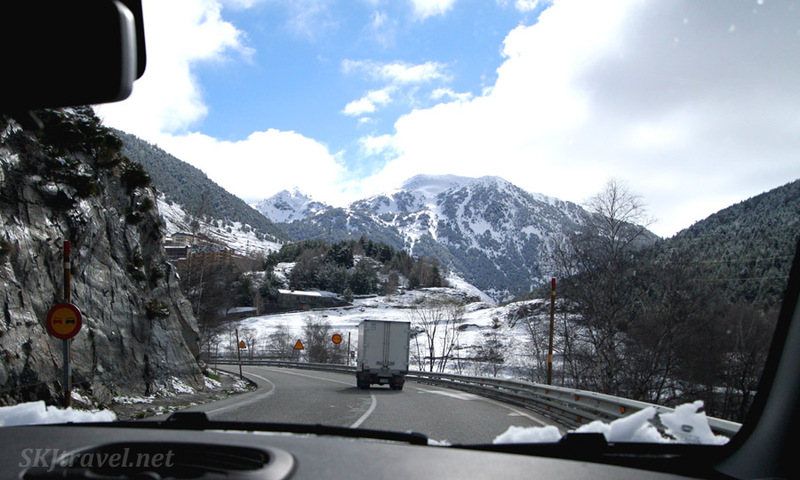 There are two routes to reach Andorra through France. One is to come from the north and one is to come from the coast (east). 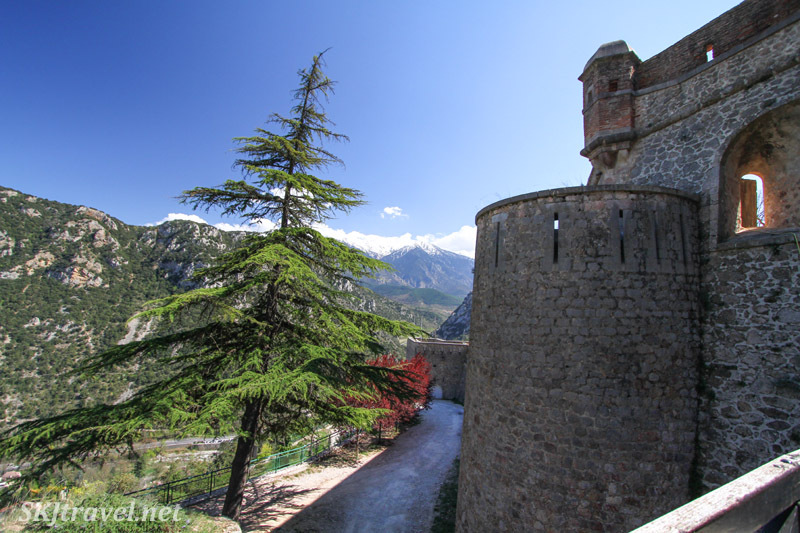 The small historic town of Villefranche-de-Conflent lies right along the route coming from Spain's Costa Brava, and we happened upon it by luck. Well, OK, we happened upon it because we couldn't help it ... it's right there on the road. 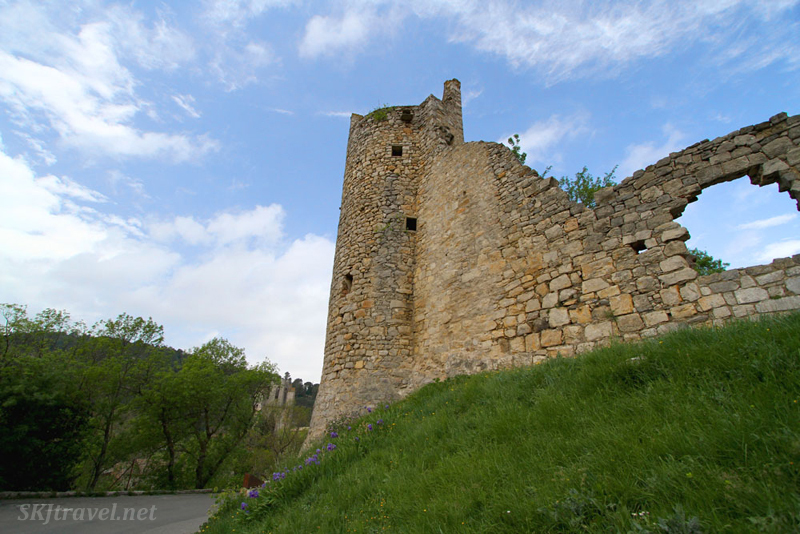 When we saw the city walls on the river and fortress up on the hill, and a parking lot right there along the road, our car simply drove itself directly into the lot. How could it not? Rental cars, if you didn't know, have quite an insatiable curiosity in their nature. Some trips I do more research for ahead of time than others, and for this particular one, I left our itinerary largely up to the curiosity of the vehicle. 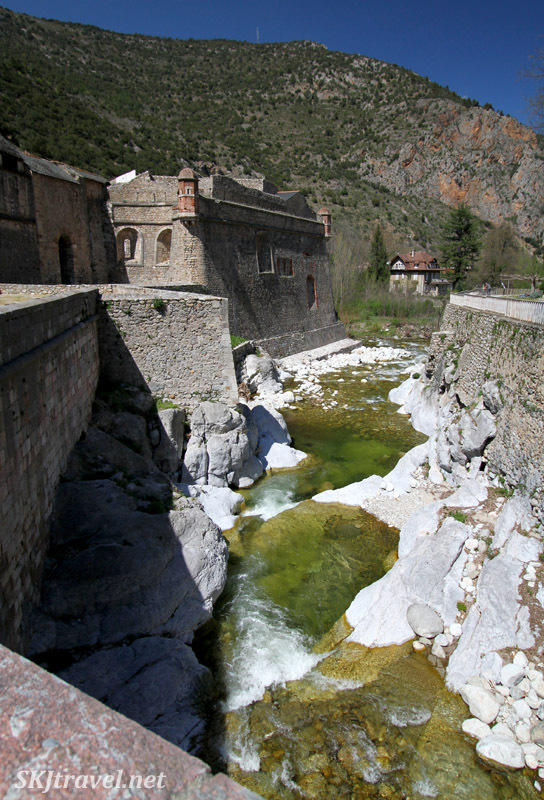 So ... we found ourselves in Villefranche de Conflent at the meeting of two rivers in a valley in the gorgeous snow-capped French Pyrenees Mountains. 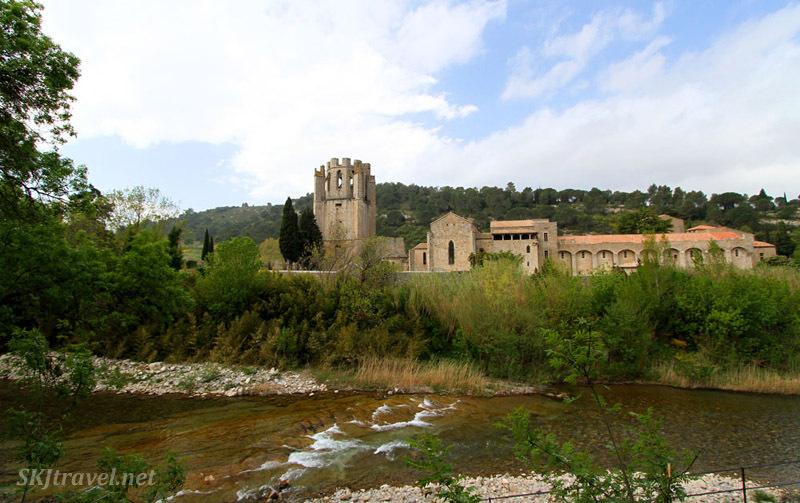 This region is culturally and historically part of Catalonia, even though I typically think of that as a Spanish region. 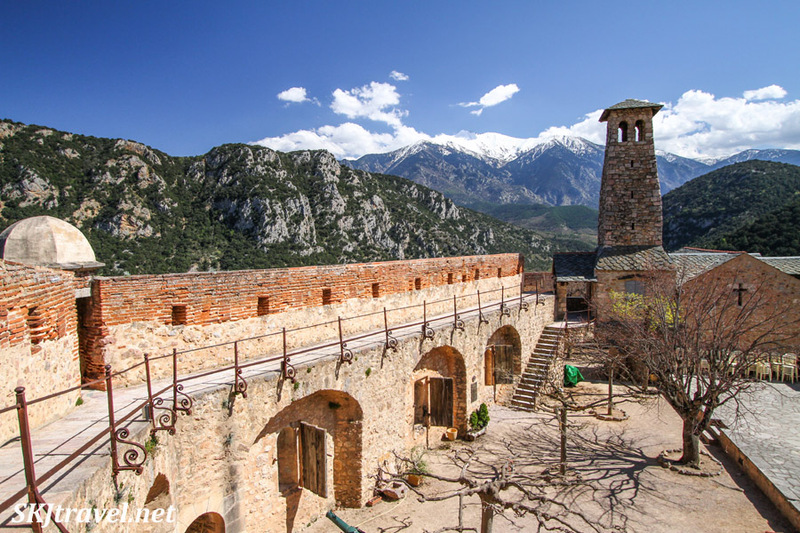 Catalan was the language spoken in Villefranche de Conflent. 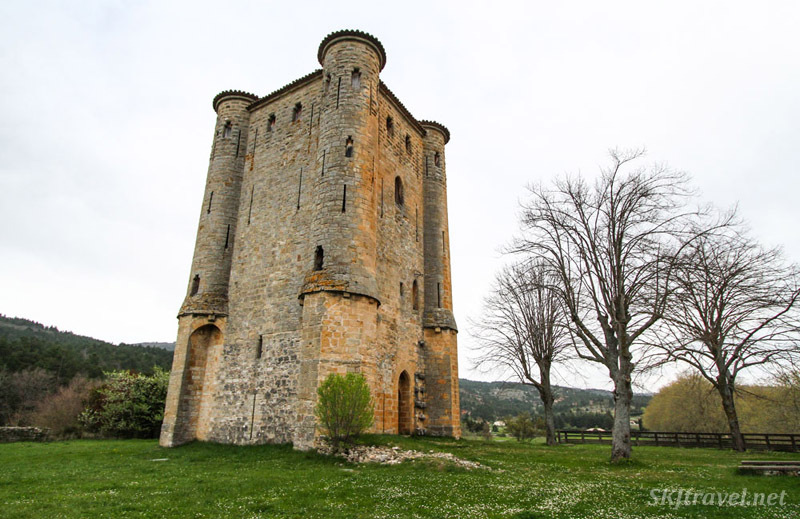 Because of it's geographical misfortune or fortune, I'm not sure which you would consider it, the town was often fought over between the neighbors -- France and Spain. And so it evolved a stout defensive wall around it and a military fortress on the hillside above it, Fort Liberia. Now a small population keeps the town alive mostly for tourists. 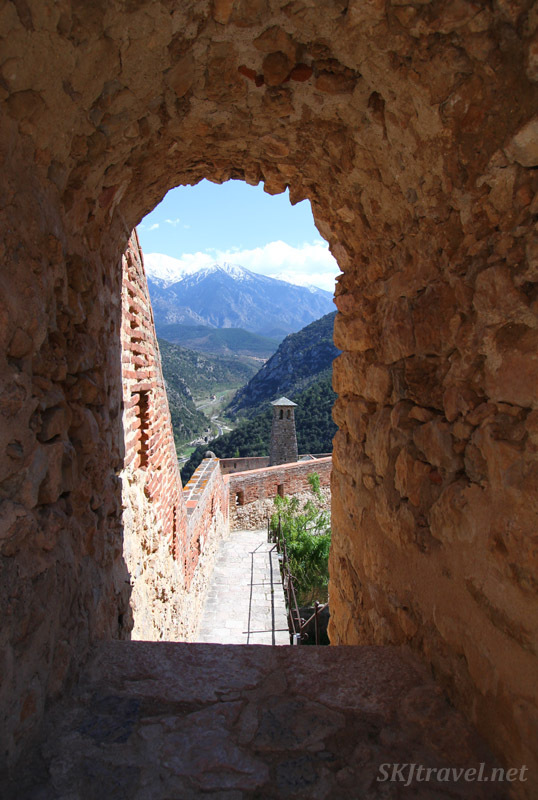 But alive, indeed -- cafes and souvenirs shops, a train station and of course the fortress. 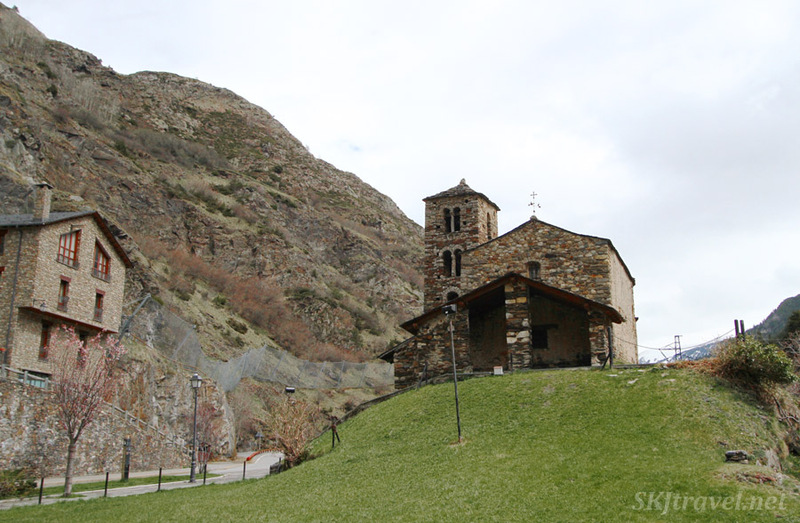 It's roughly a 2-hour drive from here to Canillo, where our home-base was in Andorra. 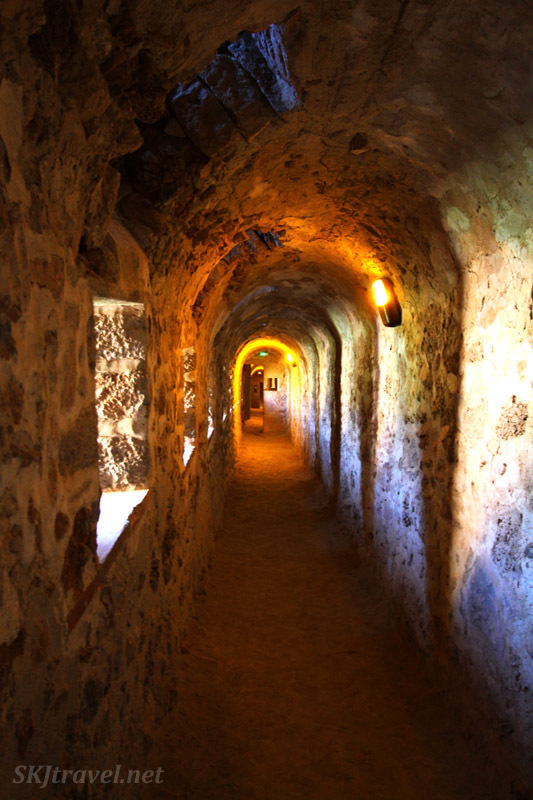 So there are 740 stairs from the valley to the interior of the fort -- these are inside of the mountain in a tunnel, so soldiers were protected while huffing it up and down. As we were walking down those stairs, we passed a couple of workmen who had the misfortune of needing to do some repairs in the middle of the tunnel, so they were struggling *up* the stairs carrying a bunch of equipment with them. 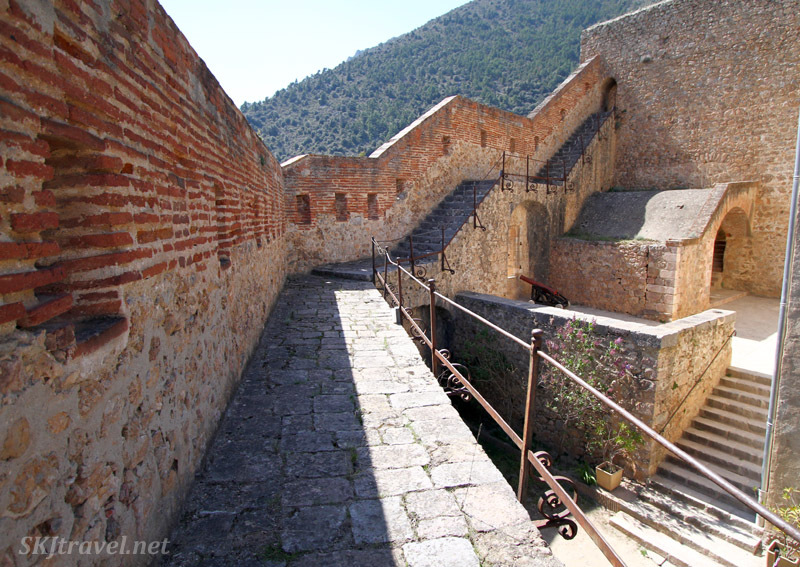 I imagined the soldiers of old having to run up and down these stairs carrying heavy shields and swords and a body weighed down with armor ... if it were me, I'd have given up probably somewhere around step #82. 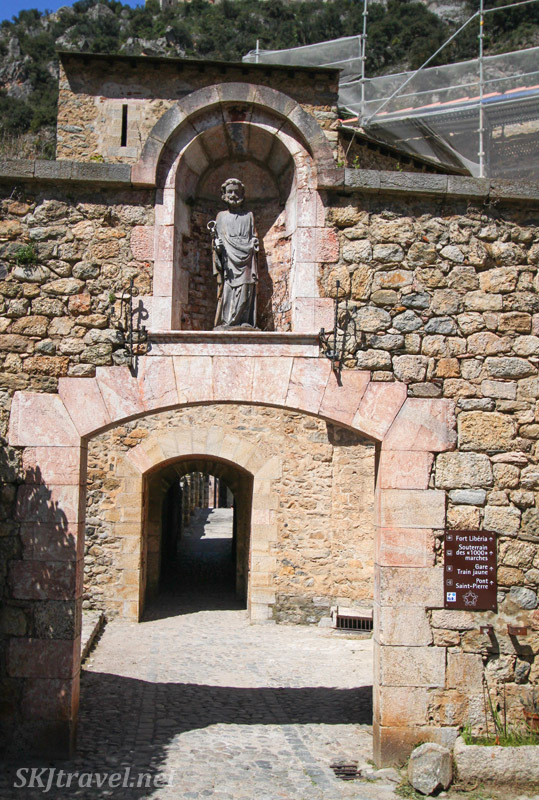 In addition to the tunnel with 740 stairs, there were other hallways and passages and mazes of rooms inside the mountain itself; so in addition to the outer courtyards and walls and watchtowers, there is a whole other world underneath, like a cave. This was one place where I appreciated all the ropes and signs with arrows directing a one-way self-guided tour through the fortress, as we surely would have missed some things otherwise. 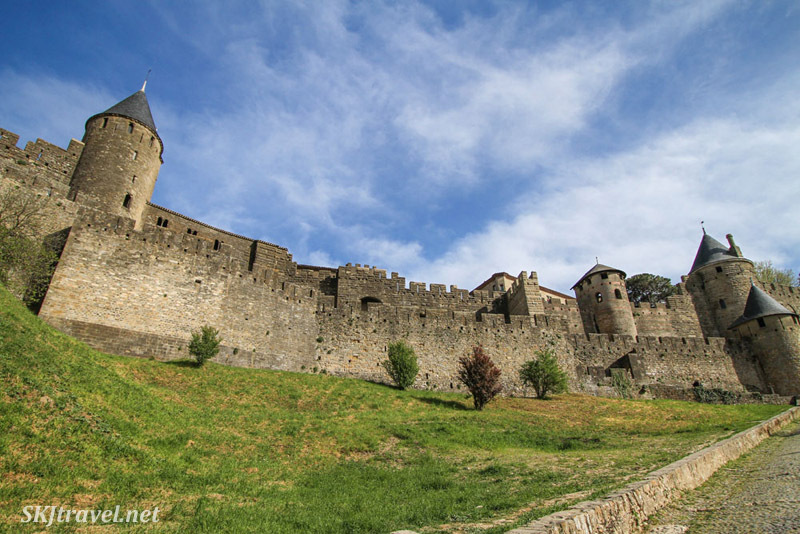 The one big side-trip I had fully planned out from Andorra was a 2-day dip north into the Languedoc region of France to see the famous medieval walled city of Carcassonne, a UNESCO World Heritage site. 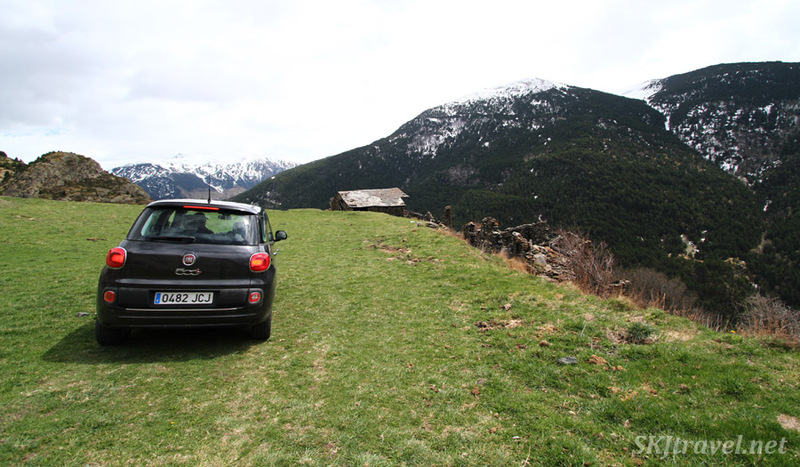 We left Andorra in the morning and had a cracking fine drive along the rural roads through the French Pyrenees ... beautiful and provincial, with spring dawning on the meadows and farming fields. Fortunately we didn't encounter another vehicle for miles and miles because there were stretches in which we would have had a hard time passing one another. Kind of reminded us of driving in the Cotswalds when we had to drive in reverse sometimes to facilitate a successful path-crossing with another vehicle. It was hard to be certain sometimes on these French roads that we were on an actual road rather than a bike path. I love how big the world feels when you don't encounter other cars along your asphalt journey. 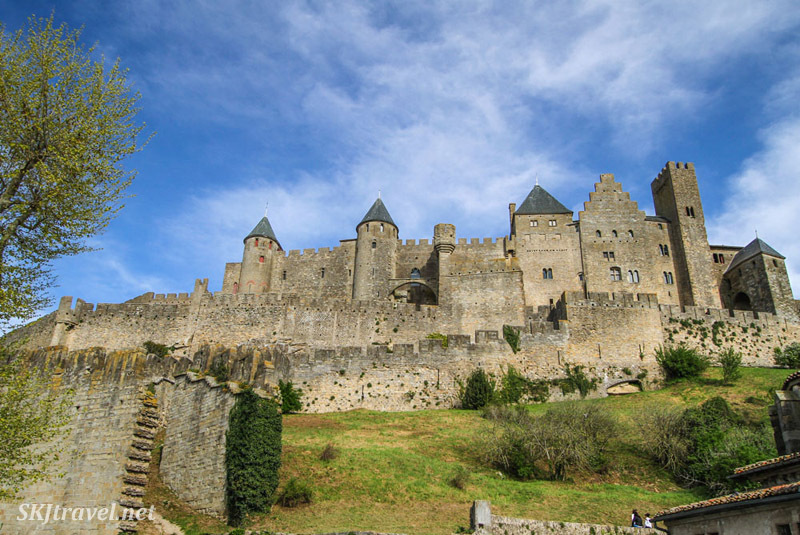 We spent the afternoon inside the fortified medieval town of Carcassonne, which has been impressively restored to provide the experience of an ancient European walled city. The only part you have to pay money to see is the actual fortress part. 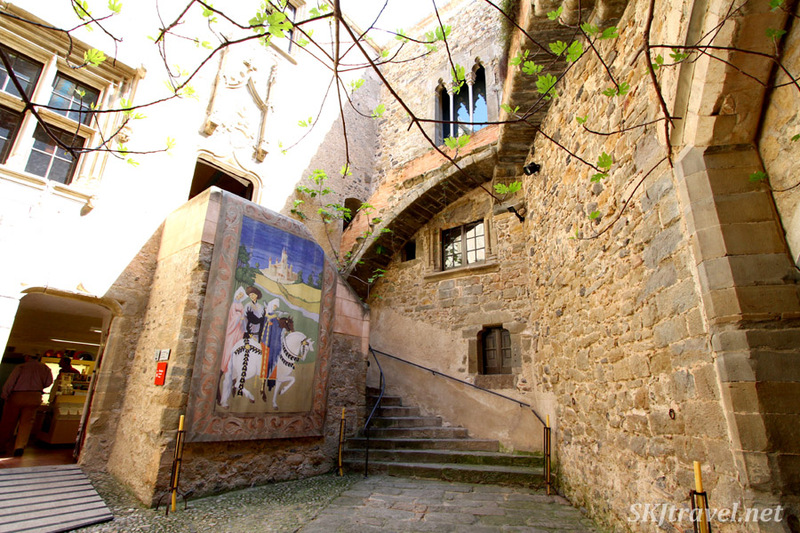 You can stroll the quaint cobblestone streets inside the walls all you want, otherwise. The restaurants are pricey, being such a tourist zone, but I had a delicious lunch of duck, which frankly, was totally worth the price to me. The "beer," however, was not. haha. The French aren't really known for a beer-making prowess. But their breads and pastries and duck are divine. A water holdy thingy ... guess I don't remember the associated placard. :) I just thought it was kinda pretty there on the red floor. 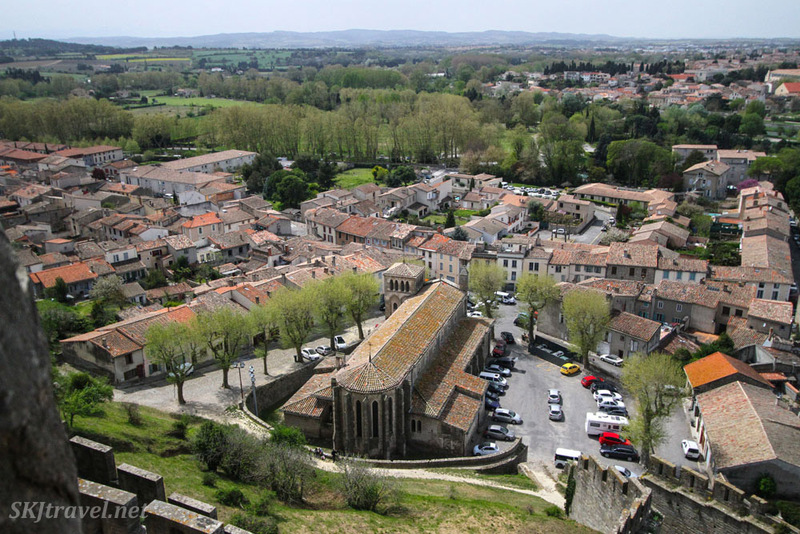 In order below: a view from the top of the wall around Carcassonne; a street inside the walls; Erik's attempt to outfit me with a viking helmet at a souvenir shop (unsuccessful). And here's a big difference we discovered between France and Spain (with Andorra being more aligned with Spain) -- the French eat supper much earlier! 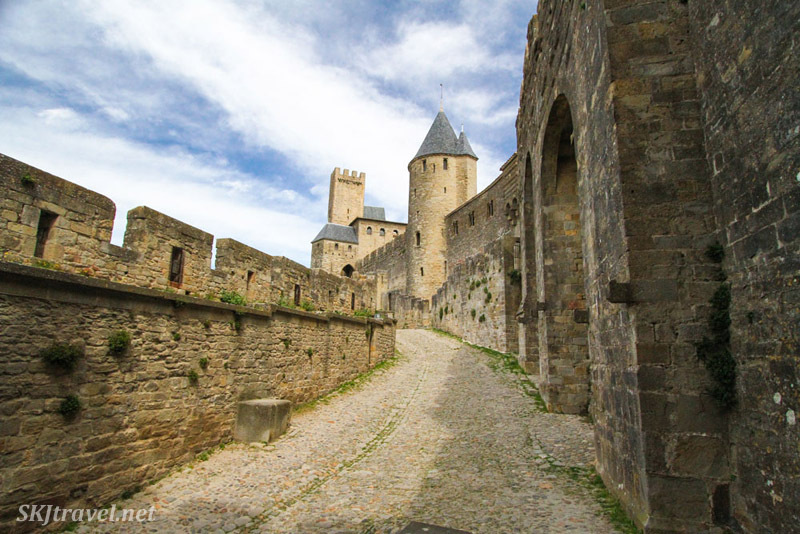 We killed time in the modern part of Carcassonne until the old walled city was lit up at night (I'd seen pics of it and wanted to check it out ... didn't get my own pics, though, needed a tripod). How did we kill said time? Surely you can guess. (waiting for you to guess) Answer: in a pub! An Irish pub, as it happened, where a soccer match had the locals out in droves but we found a little nook in which to drink one of our favorite tap beers: Kilkenny. (this beer was also our treasure find in an Irish pub in Reykjavik, of all places, the night we saw the northern lights!) We decided to scout for supper about 9:00pm, having been conditioned to Spanish/Catalonian eating schedules, and nearly went hungry. We managed to find a pizza joint just locking its doors, and they let us in to order. 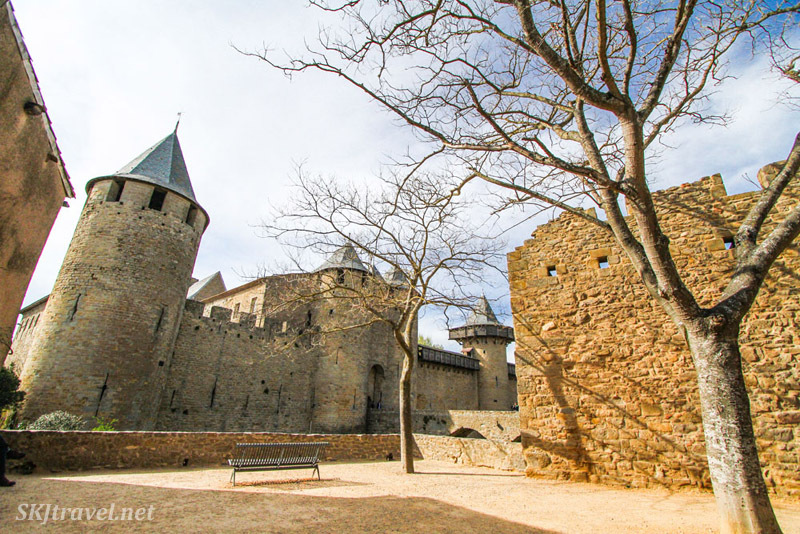 So we stayed the night in Carcassonne (supporting my fellow airbnb hosts by booking with one of them) and the next day we took our leisurely time driving back to Andorra with several pit-stops. 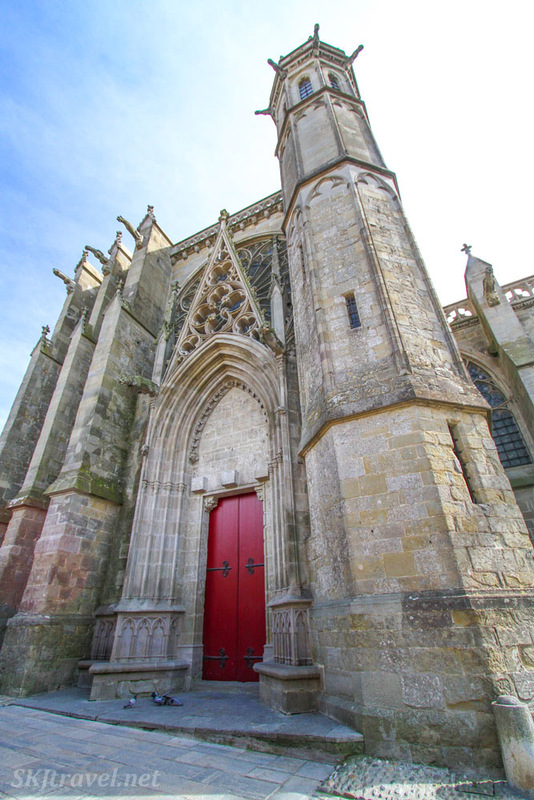 First, the Abbey of St. Hilaire. A small affair with some interesting points the ticket man was kind enough to point out. 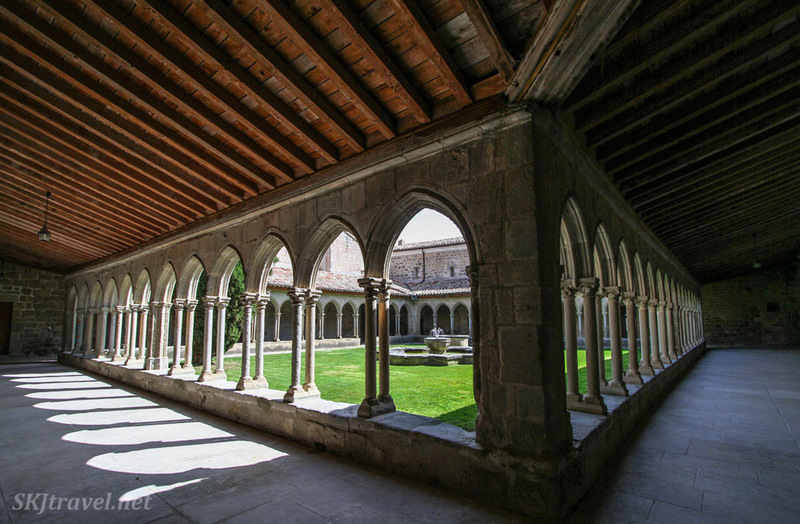 The first pic below is one of my favorites from the trip ... not that it's an award-winning photo, but I just tried that same shot in several different abbeys, as they all have those cloister courtyards, and this one came out the best, and again what I love is how much fits into the wide angle (10 mm). 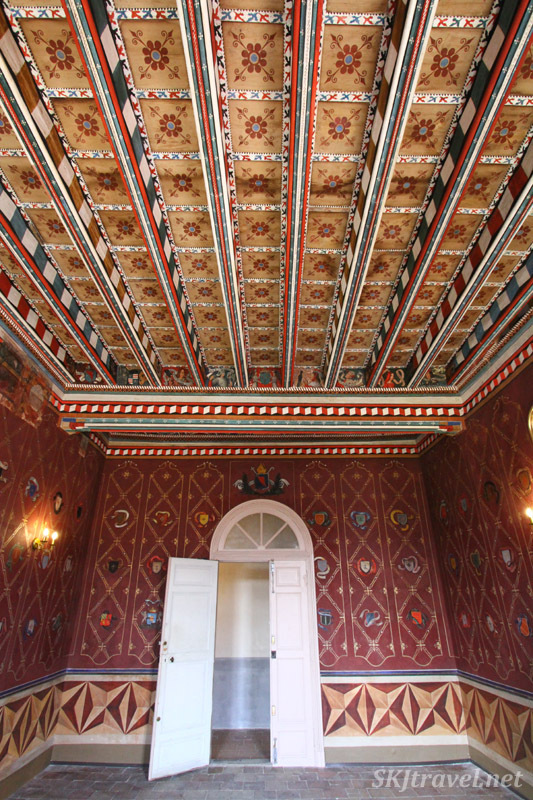 This room below has one of the funny tidbits ... on the ceiling those rafters are painted with scores of little scenes, and some of them were not of a particularly ... ummm ... virtuous nature. I'm such a fan of setting up self-timer shots (like above), and after my birthday trip to Iran last year where we encountered mirror-laden architecture everywhere we went, I'm also a fan of the mirror selfie. Erik indulged me here. 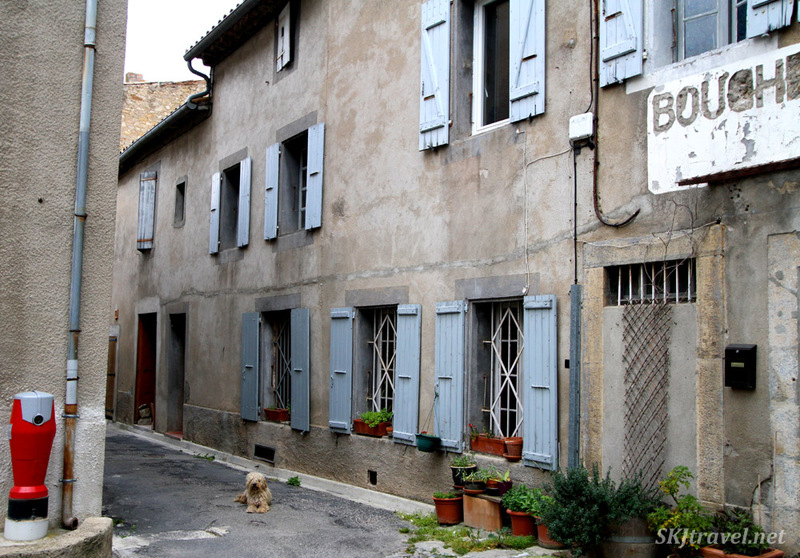 Next, I'd read about a village that was reputed to be one of the prettiest in this part of France -- Lagrasse. Mostly we just wandered around. It was a little weird, as the place was practically deserted. It felt strange walking the empty streets. 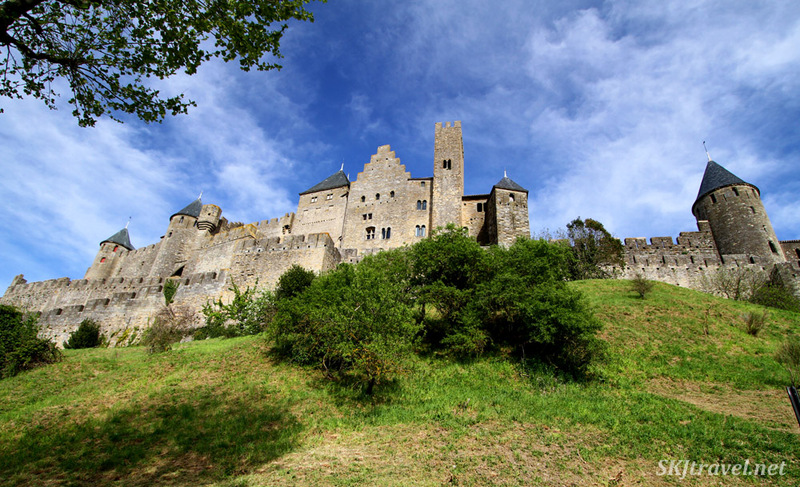 I guess particularly after being in Carcassonne, which aggravated my claustrophobia with so many tourists. This happens to us sometimes -- finding ourselves walking through places that seem like they shouldn't be so empty, like something is amiss, and we always break into song with "... welcome to the hotel California ..."
And lastly on this day, though it was wearing late, our curious vehicle drove us into another parking lot ... a small dirt lot on the side of the road. We walked up the path to check out what might lie behind the stone wall. Embarrassingly, I can't tell you what it's called. I appear not to have saved the brochure from there. We went through it pretty quickly in the dimming light -- just a couple of small buildings. 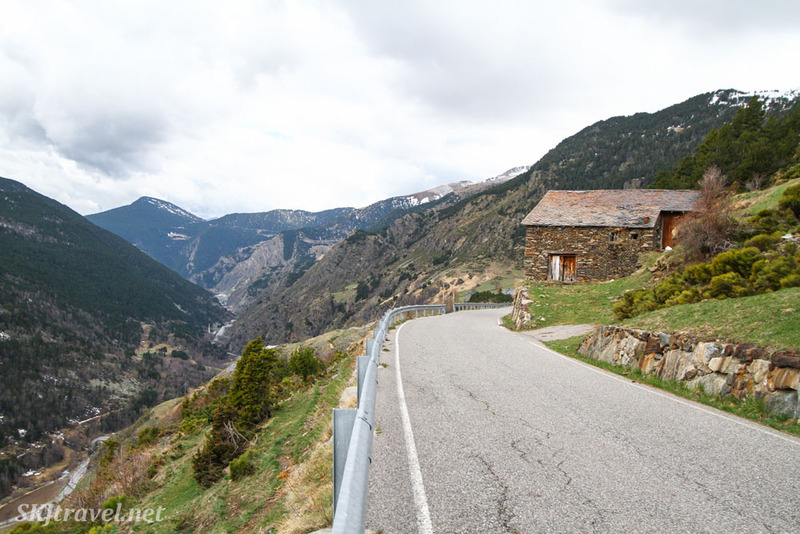 And it's a good thing we did breeze through that last sight, as we soon ended up in a torrential downpour of rain while continuing our drive back to Andorra. To accurately describe the volume of water dumping down on us, I need to consult my dictionary for a word that means more torrential than "torrential." 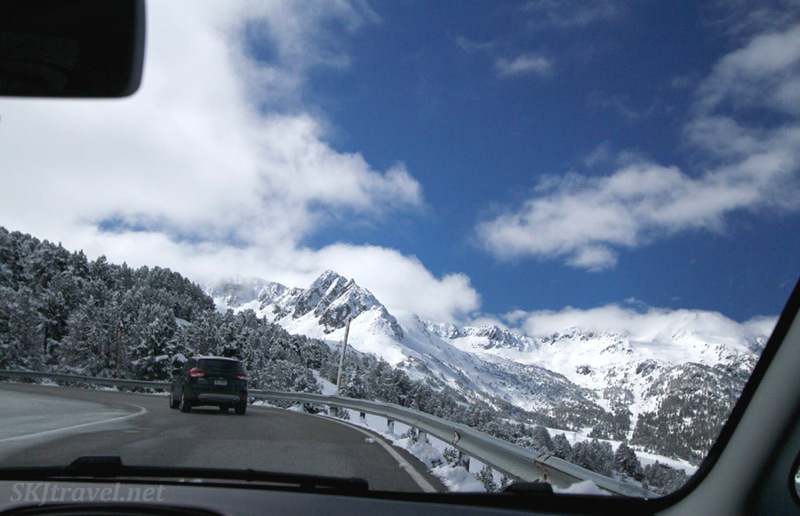 By the time we reached the border of Andorra, it was a full-blown snow storm. 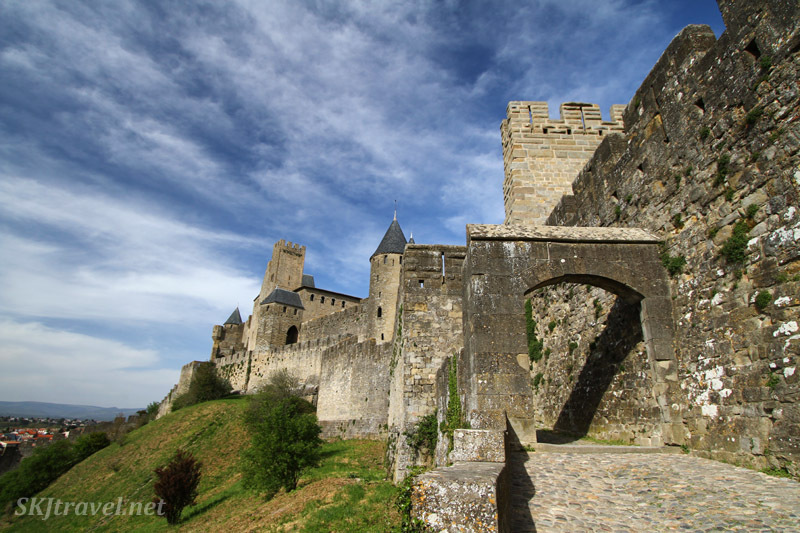 We had come from warm, pleasant, flowering Carcassonne gradually up into the Pyrenees to a cold blizzard ... so it was slow going for the last portion of our side trip. But a delightful outing full of wondrous sights. 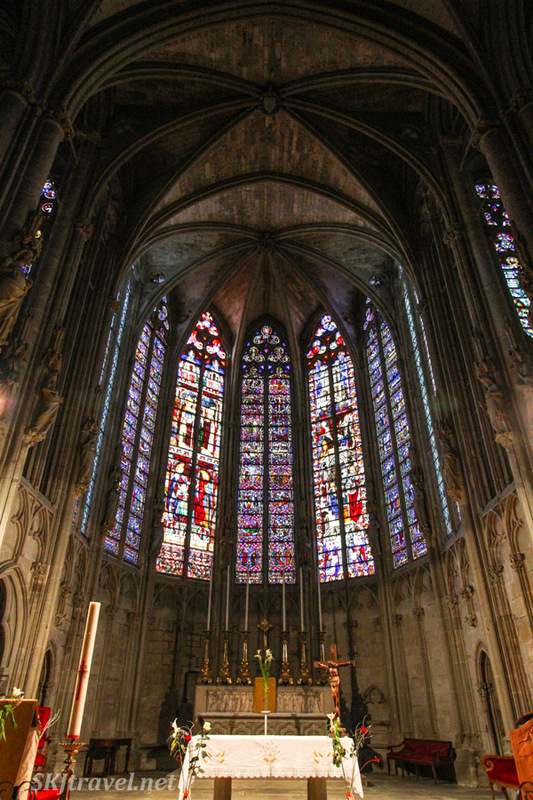 Do I sound like a guidebook or a coffee-table picture book?? Well, that's OK. I'm just tellin' the truth. 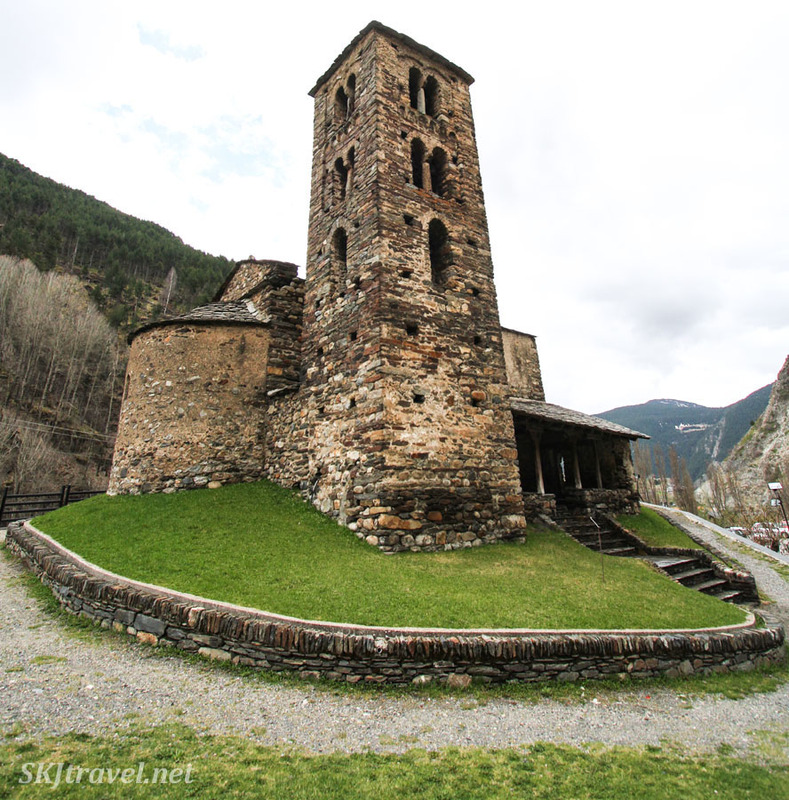 I didn’t know anything about Andorra, first established in the 9th century and established as its own principality in 1278, until I decided to visit it. 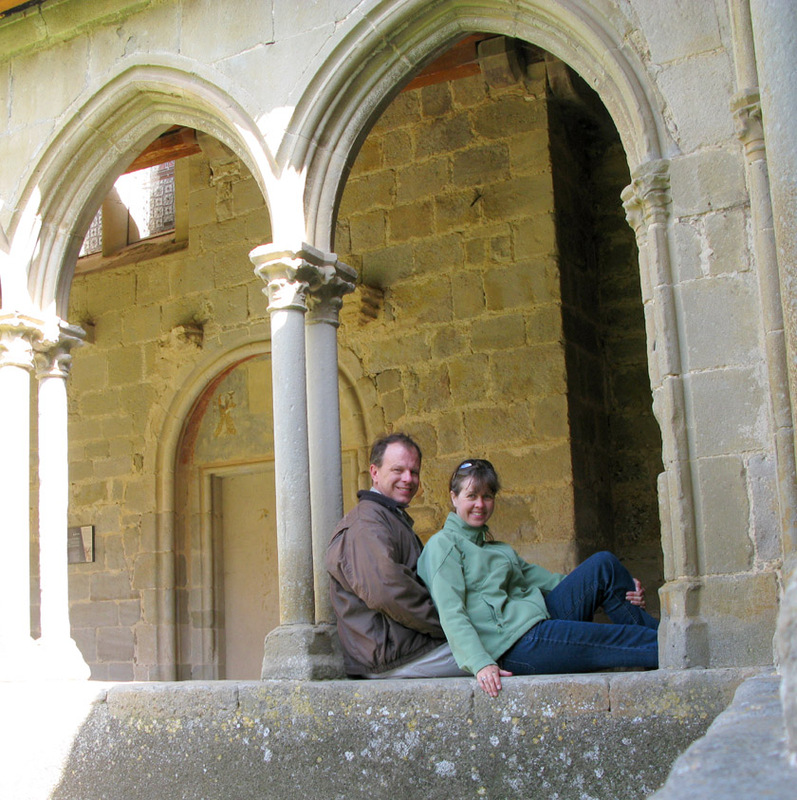 It looked awful purty in the pictures, perched in the Pyrenees Mountains between Spain and France. 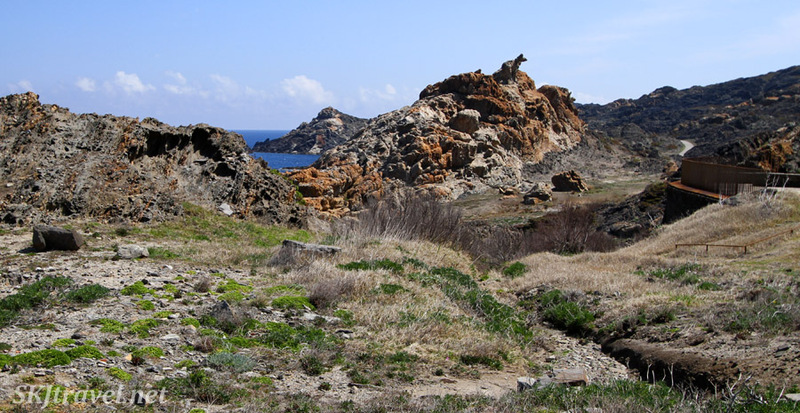 It’s one of the micro-countries of Europe, has a population of about 80,000 in an area of about 180 square miles. All of it is mountainous; the primary revenue for the country is a healthy ski industry (and hiking/trekking in summer) and its duty-free shopping. With a total country population of 80k, you can imagine no city is terribly large (the capital is 24k), but you can find some pretty mind-blowing liquor stores and novelty shops just along the roadside for the purchasing pleasure of skiers and other random tourists like ourselves. Visiting at the time of year we did, April, was kind of a bust for activities, because there wasn’t enough snow left for snow sports but there was still too much left to do any hiking. But the cool thing about this time of year was how quickly you could move between snowy fields on the mountains and pink and white spring-flowering trees in the valleys. Expecting it to be a scenic country, I had imagined we would do a fair amount of “Sunday driving” just to look around, but being so mountainous, turns out there aren’t really very many roads. So that didn’t take us very long to explore around. 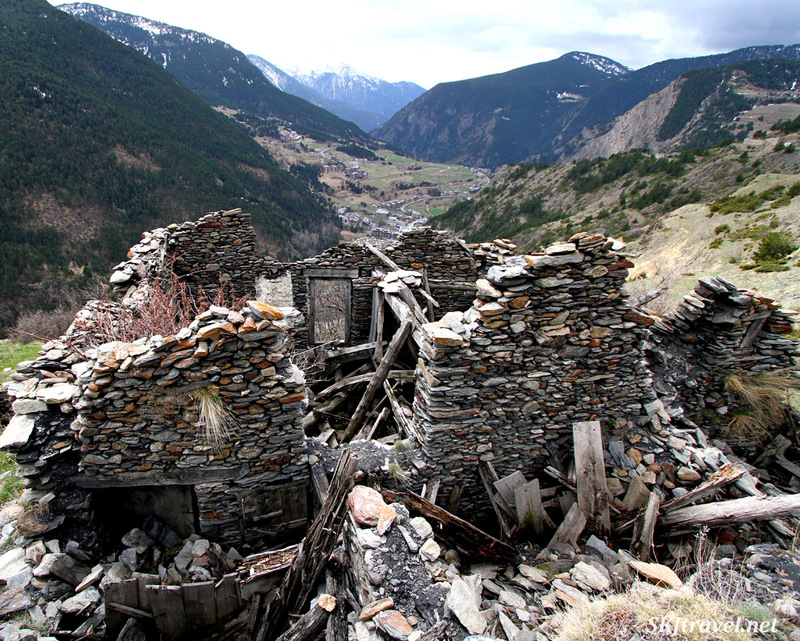 We ran across several picturesque abandoned stone houses and farmsteads. 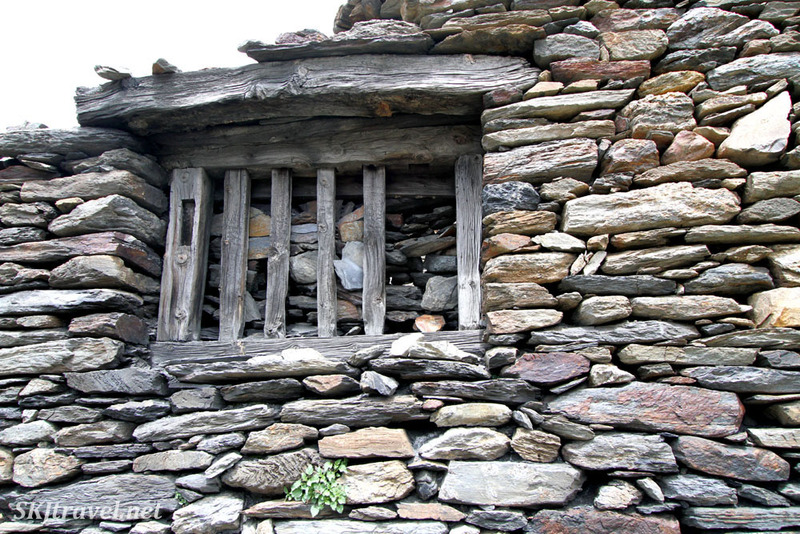 (You'll notice stone is the primary building material both in city buildings and farmsteads.) The main road through the country, since there is, after all, only one, can be quite clogged with traffic particularly around the cities, but once you turn off onto the side roads into the smaller villages, you have the road to yourself … so much so that we would just stop dead in the center of the road to get out and take pictures if something caught our eye. 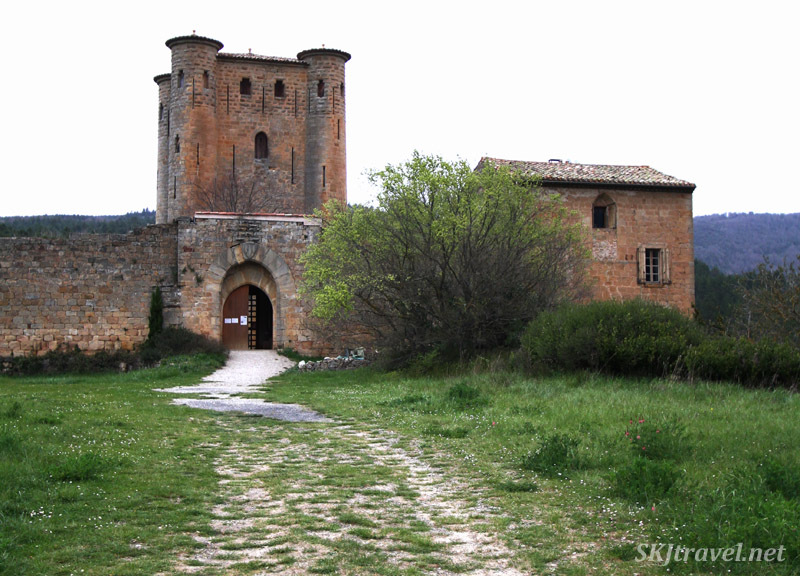 One time, though, we saw a little ruin on a hillside and drove on a slightly rocky dirt road and parked in a grassy field to explore it. 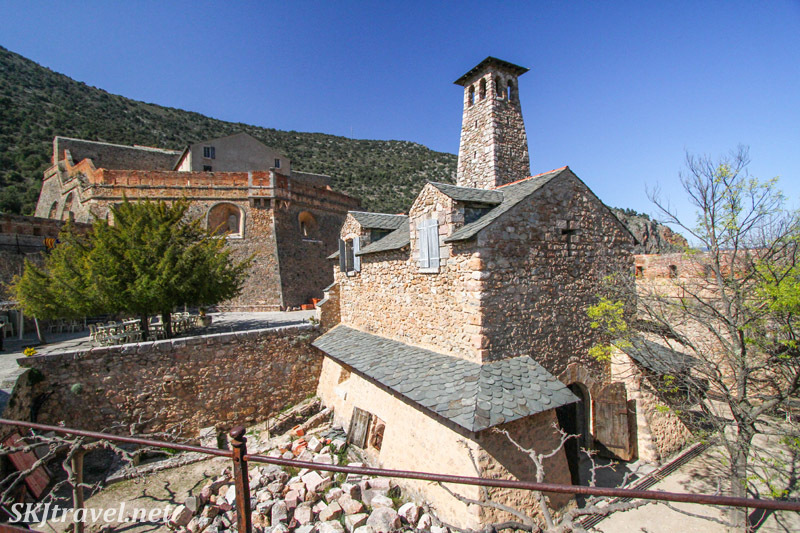 It was a nice little ruin, and photos of it give you kind of a basic summary of Andorra … mountains and steep valleys with cities in the valleys and abandoned farmsteads on the slopes. 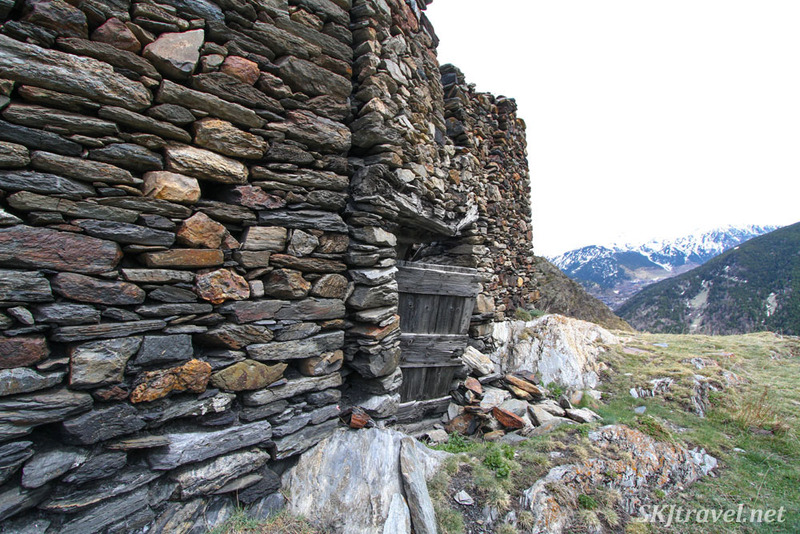 Andorra doesn't have the grand ruins typical throughout most of Europe, such as the one we would soon find in Spain (stay tuned), or the copious castles abandoned in Irish farm pastures, etc. 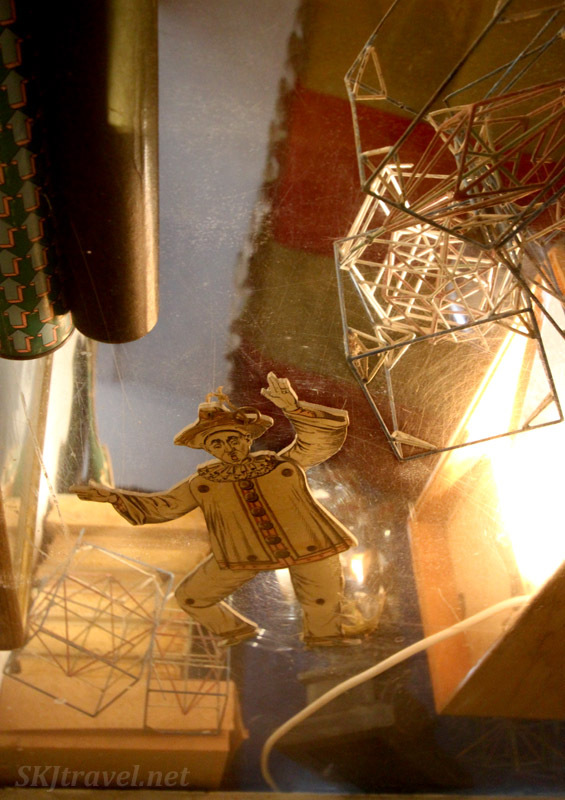 But there's something playful and imaginative in exploring any kind of abandoned past. Can you guess what happened next, after that exceedingly mild adventure? 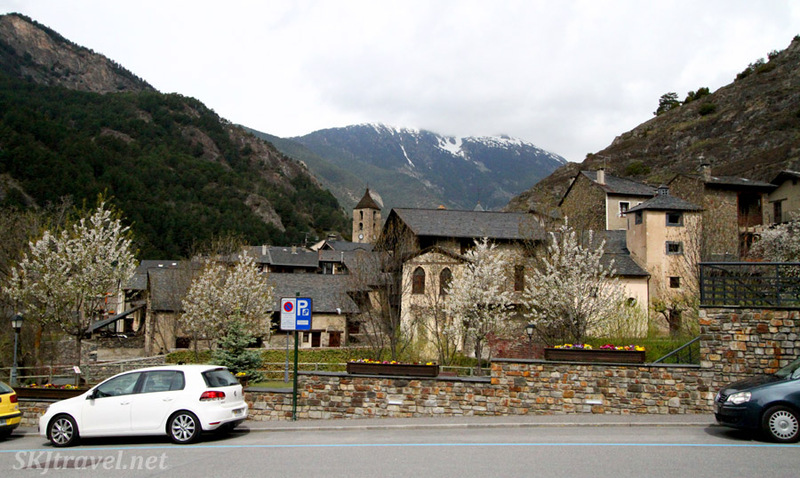 Fortunately, being the small country that it is, we were not too far from a full-service gas station so that we were able to drop off the car in the nearest town and walk around killing time for several hours in Canillo while they fixed our flat tire. Such a civilized affair compared to all the times we had to change flat tires in the middle of the roads in South Africa! I would have felt more nervous about leaving our car keys with a gas station cashier who didn’t speak any English -- and we don’t speak any Catalan (the national language) -- who couldn’t really say when the mechanic dude might be back and therefore when the tire might be fixed, but such a small country inspires a fair amount of faith in the locals. 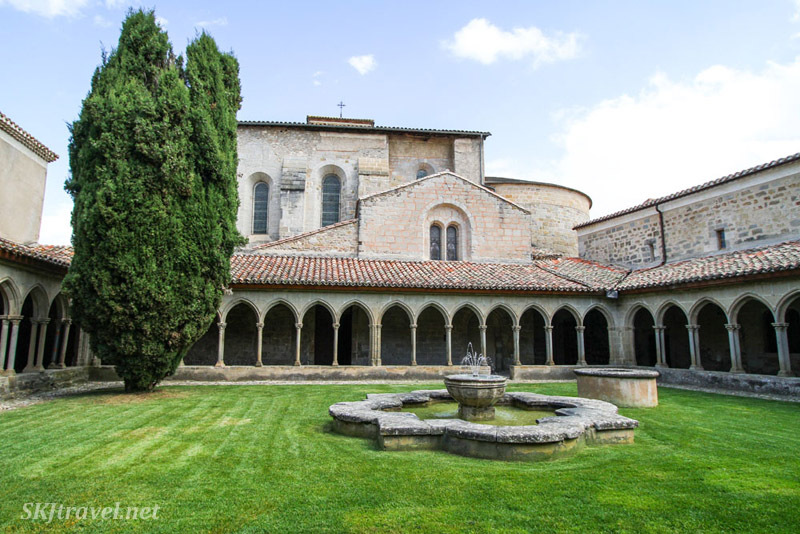 With a rough estimate of completion 3 hours hence, as we understood it anyway, we walked away and killed some time inside a pub (surprise) and then inside the very random Museu de la Moto -- a Motorcycle Museum, which was incongruously situated beside this 11th-century Romanesque church. Just past the lower left corner of the photo above is a little hatch leading to an underground museum full of motorcycles. This had caught Erik’s eye immediately upon entering the country. So here was the perfect opportunity to check it out. I’m typically up for anything, so while I can’t say I experienced the same excited anticipation to see a motorcycle museum as Erik clearly did, (even though I ride them, if you didn’t know … I have a sport bike and a dirt bike), and even though it was like the dinkiest museum ever in terms of square footage, I found it very interesting (and there were over 100 bikes packed in!) and was glad we visited it. The old ones are, of course, the most interesting. I would even go so far as to say that some of them were full-on fascinating. 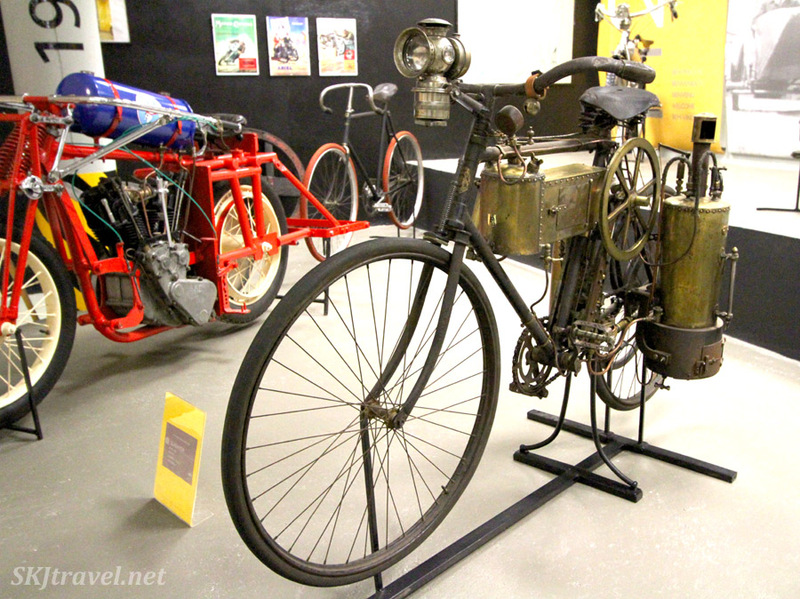 Take, for example, this gem here below, which is steam-powered! You built a little fire in the cylinder on the right and the steam traveled through various tubes to power a piston. So I guess you had to carry a sack of coal on your back if you were to go very far! 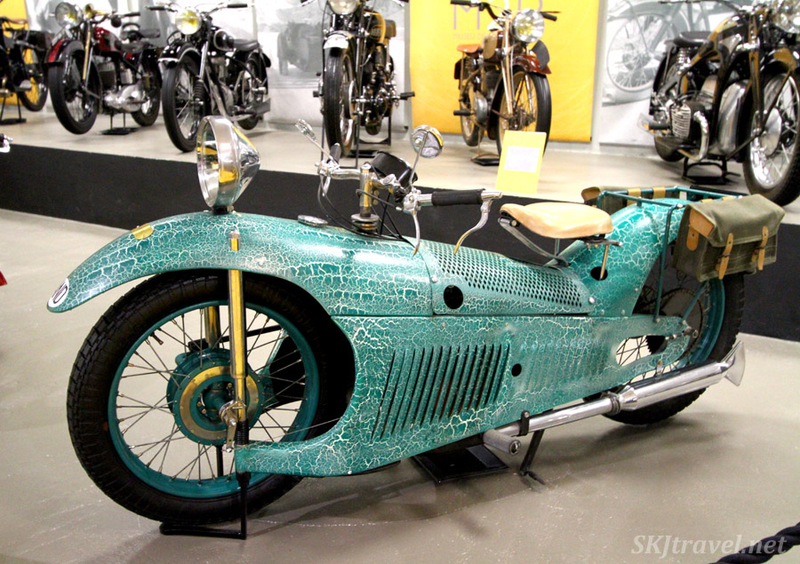 I would love to ride this thing around town. haha ... the looks I would get! While most citizens may not have needed to travel very far and roads may not have been too important to them; the one class of folks who did need to travel far were the parliament members. So until nearly half way through the 20th century, they rode to the capital on horseback. And here is a cool thing, that maybe my country and some others could benefit from this arrangement … after riding to the capital, they stayed overnight during session in the actual parliament building, known as Casa de la Vall. They ate dinner together in the kitchen first before going into chambers. So they were congenial and conversant with one another, unlike the elected officials of my country. When you are forced to hang out with people, you are forced to know them a little and understand them a bit, and a lot more gets accomplished with this type of empathy. That being said, there were not very many of them who had to tolerate each others’ company. 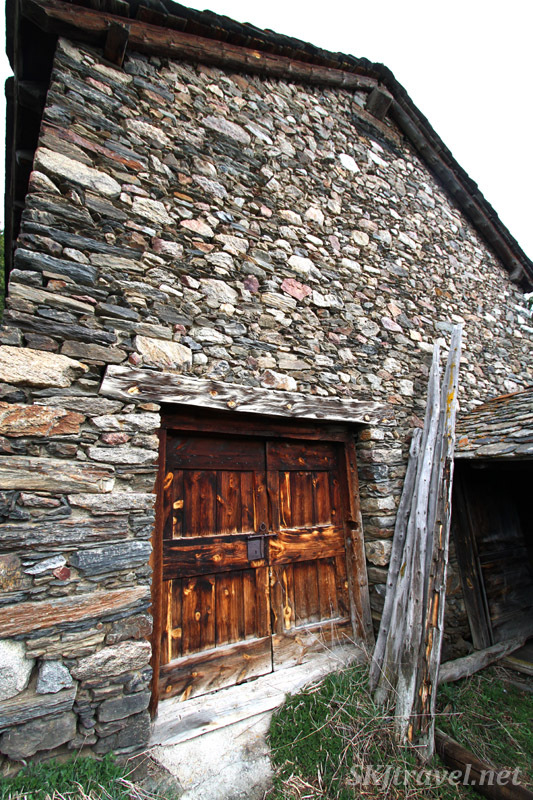 It’s a pity that they don’t allow photographs to be taken in any of their museums in Andorra. 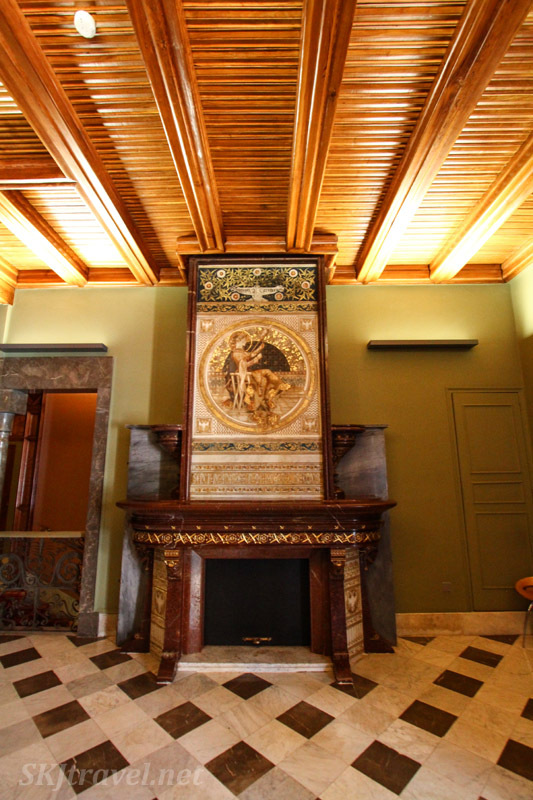 But here is one of the session chamber from the official website about the former parliament building (www.casadelavall.ad/en/inside-the-house). They built a new parliament building only a few years ago … it’s square and drab, just across the courtyard, and still really small. 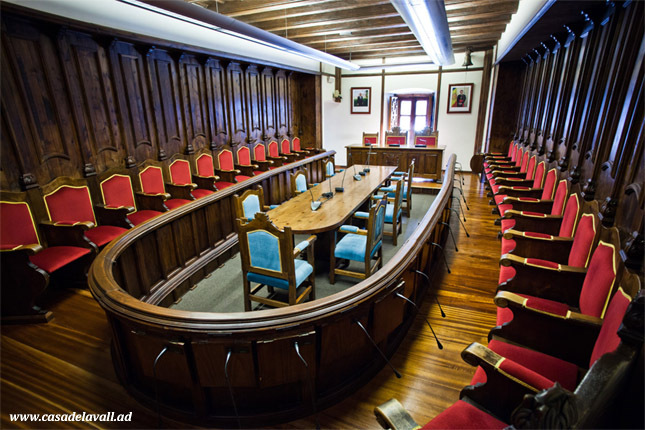 The parliament members are elected from each of the 7 provinces in Andorra. But who sits at the helm? A president? A king? A prime minister? 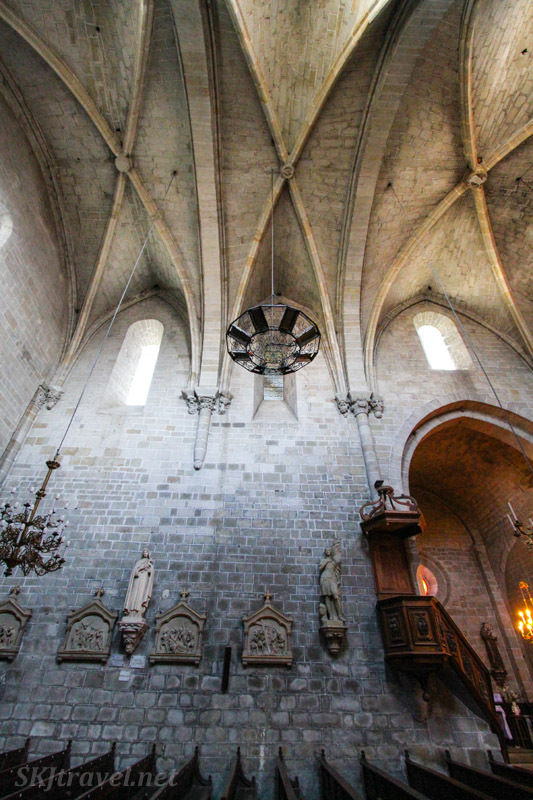 It’s kind of a surprise if you don’t already know the answer … Andorra is co-ruled by the President of France and the Bishop of Urgell, Spain – they are referred to as the “co-princes.” So it’s a government really based on cooperation all the way around. Here’s another nice little thing, a dedication to honesty rather than cunning and deceit among elected officials: important papers are kept in a wooden dresser with seven key holes, and the heads of each province must put in their key in order to unlock it. So if one province isn’t represented, the important documents can’t be accessed. Andorra doesn’t have its own army. 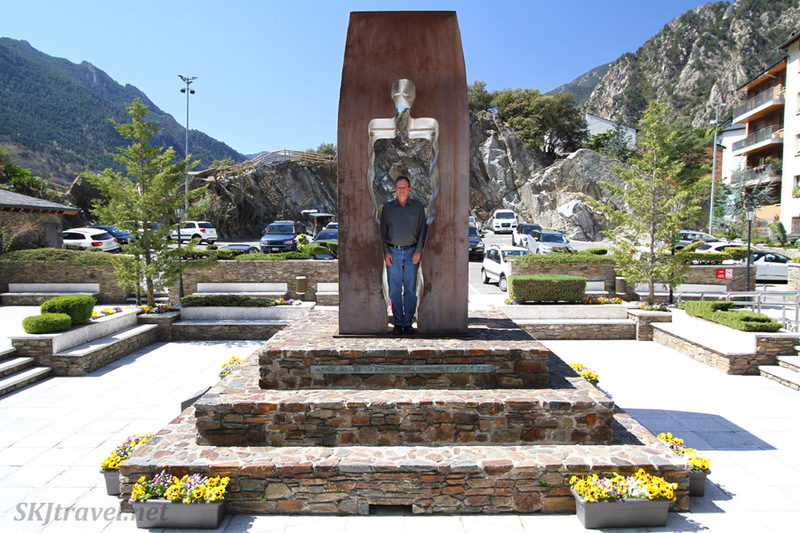 Until 1993 Andorra paid tribute to France and Spain in alternating years for military protection. In addition to cash, the tribute included cows and large loaves of bread. Probably at some point I’m guessing the bread was phased out. We were told that it was the law that every man own a gun since there was no national army. We subsequently asked two men about it … they both confirmed the law but one of them didn’t own a gun and the other did begrudgingly – they were both young men and really wanted nothing to do with the weaponry. 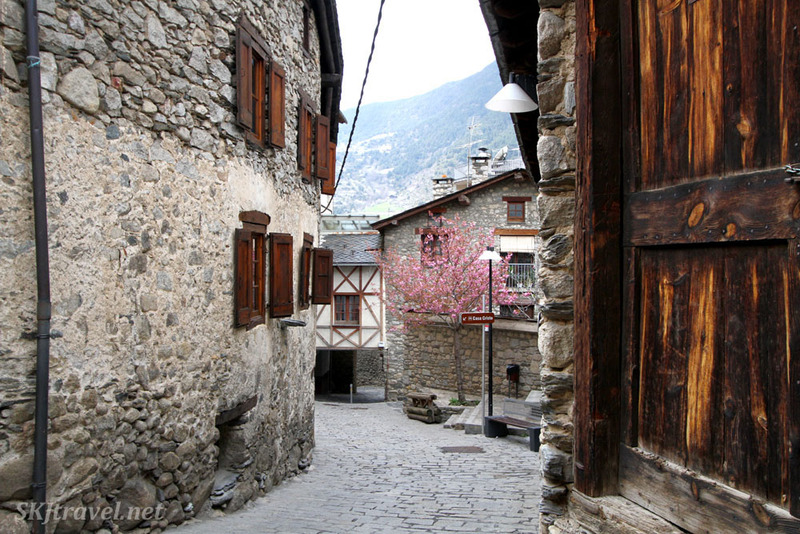 During World War II, Andorra hid and sheltered many Jews. One hotel in particular was pointed out to us as an establishment that housed a lot of refugees. So it was disappointing that we couldn’t take photos inside the parliament building or the two museum houses we visited, but they certainly tried to compensate for it with excellent guided tours, even though we always ended up having to kill time until we could be scheduled in. But that was good in its own way for forcing us to just chill and “hang out,” and be exploratory rather than always moving from here to there to see this and that. 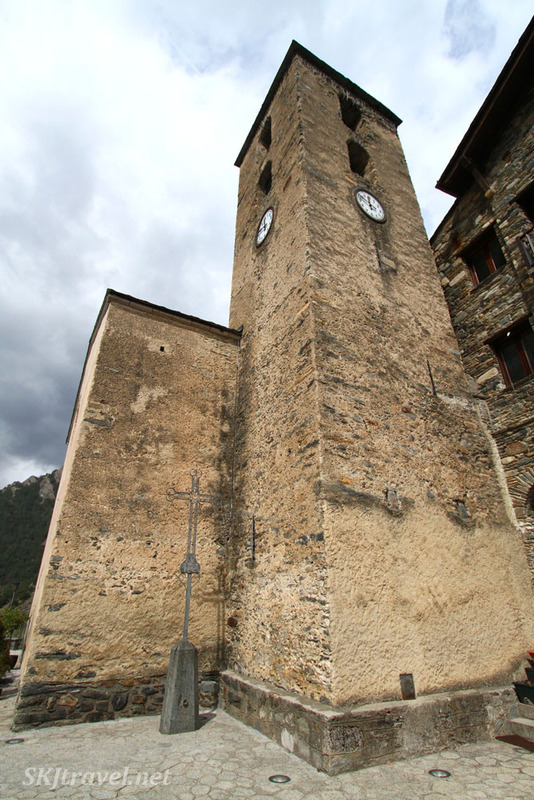 For example, while waiting for a tour in Ordino, we meandered and found this church and clock tower. Anyway, so much information was given to us I couldn’t even keep track of it all. 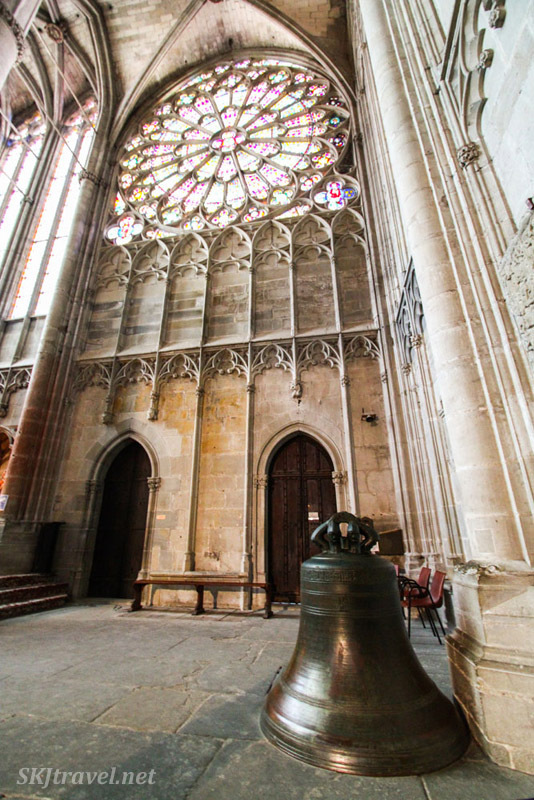 All of the buildings were so small, we couldn’t believe it when we saw how long the tours took … what could possibly take so long in such small spaces? I cynically suspected they would be padding their presentations with a bunch of boring minutiae about the furniture or the history of the owner’s second cousin’s wife. But as a person who often avoids guided tours, I must credit these as genuinely interesting (to me), and very well done by very knowledgeable people in very good English. And except for having one other guy with us in the parliament building, it was just me and Erik and the guide. 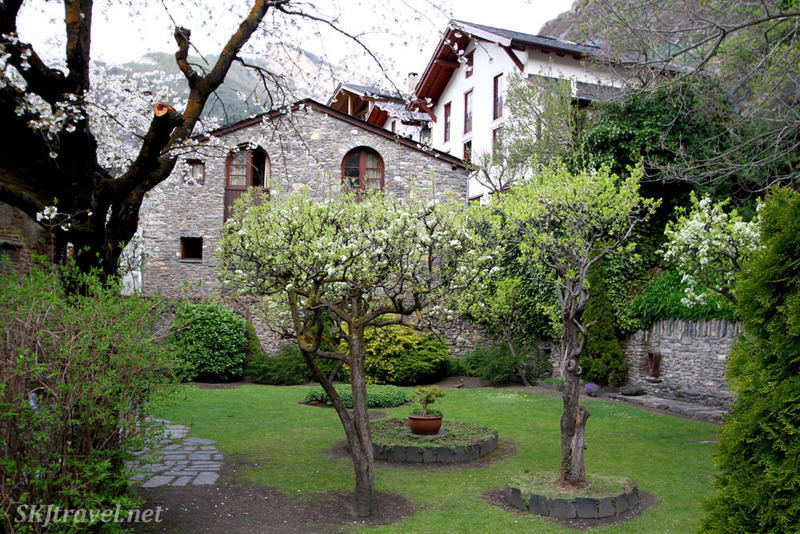 We visited two house museums -- one of a wealthy family (somewhat rare in the Andorran valleys, and typically acquiring their wealth from a once-thriving mining industry) and one of a peasant family. They complemented each other well, to learn the differences in how the elite and the typical poor farmer lived, as well as the things the houses and their owners had in common. 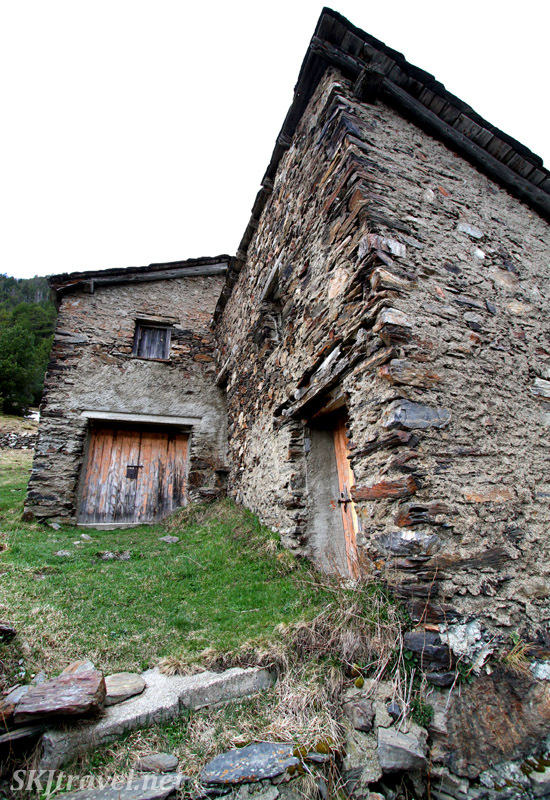 Take for example in the “common” category … In the (not too distant) past, in almost all houses in Andorra, wealthy and poor alike, even including the parliamentary house, the first room when you came in the front door was for livestock. The animals provided warmth for the house and also were kept safe. In the parliament house, the members kept their horses there when in session. 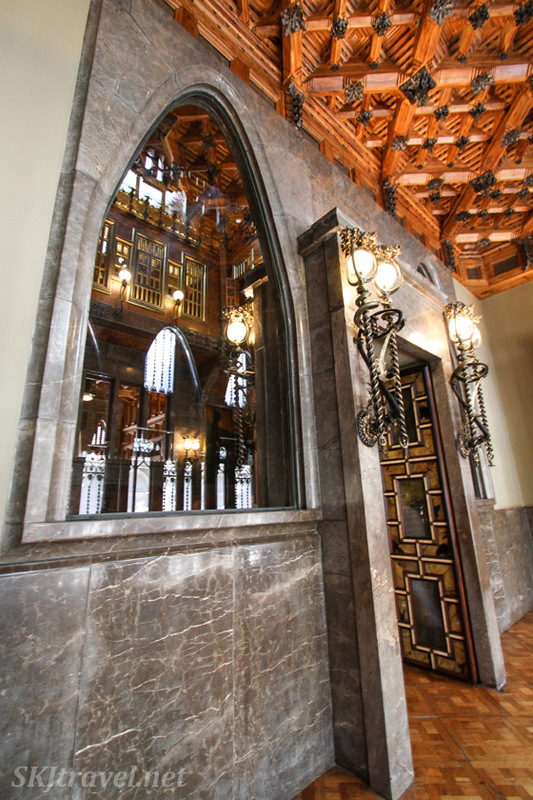 I love the idea that you enter the capital building in the capital city and have to work your way through a bunch of horses (and presumably horse manure) to reach the courtroom and the parliament chamber. Another interior feature common in all houses was what you could call “Murphy tables,” after the Murphy bed concept -- the benches in front of the kitchen fire would fold out into tables. This way the kitchen could be kept small and warm, with the table taking up space only while eating. 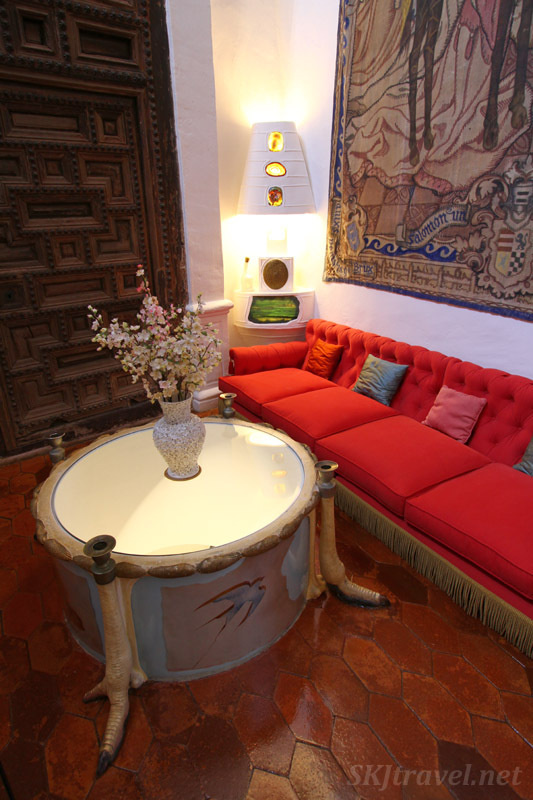 The family of fortune left their home in the 1940s and sold the furniture and interior contents along with the building. But the family member who grew up there and donated almost all the toys on display in the children’s room comes to visit sometimes, and the only thing she asks to have back is a tiny little painted wooden doll of a black baby. Our guide confessed she’s tempted to take it from the display cabinet and give it to the lady to make her happy … it was hers, after all. One of the family members became a dentist and taxidermist, among other professions. His dentistry room was upstairs in the house attic, sporting a horrifically stark, simple chair … a torture chair, I dare say. His hours were mostly in the evening, when farmers had put livestock in for the night and could afford the time to have a tooth pulled. And, to be honest, if his inconsistent taxidermy skills were at all indicative of his dental skills, I would be wild with fear to sit in that chair. 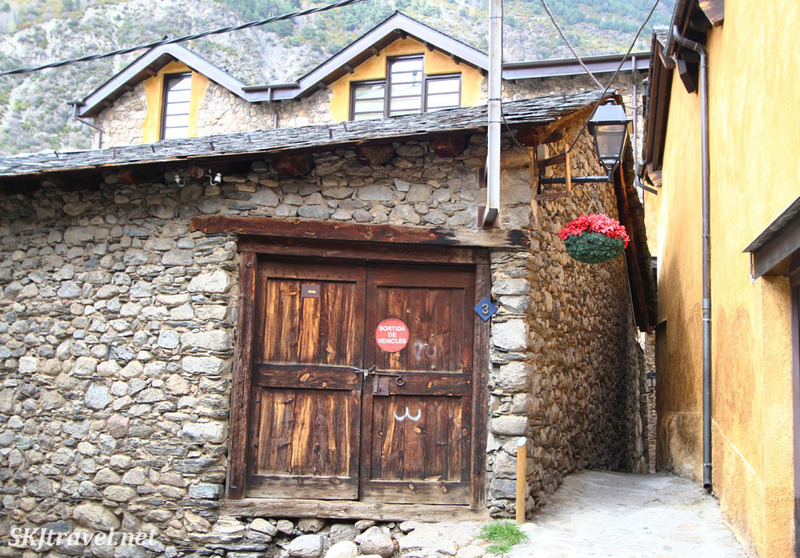 Here is the quaint street along which the peasant family museum lies, called the Casa Cristo Ethnographic Museum. We had to wait for the guide to show up and then get our (excellent) private tour. 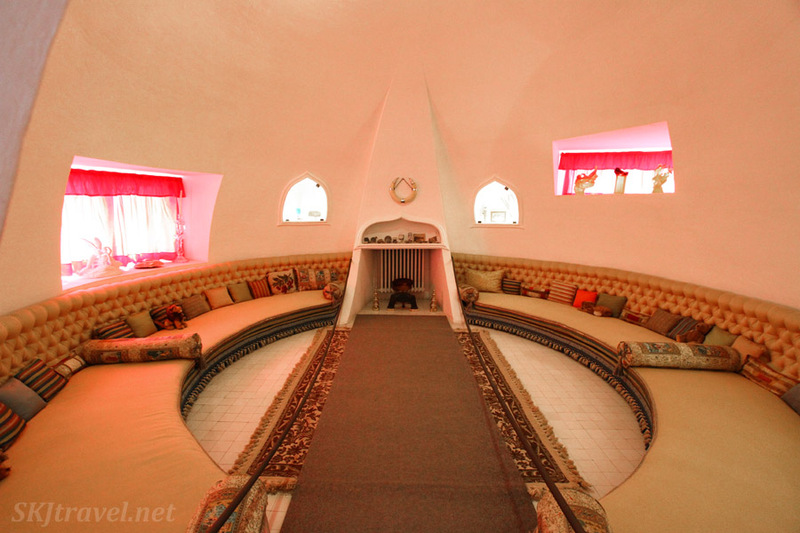 The family who owned this house also left in the 1940s and also sold the furniture and interior contents. In this typical farmer’s house, rather than a spooky dental office, the attic was used as a place to dry fruits and herbs on top of hay, and dry animal skins on racks, and keep grains up high out of the way of mice. 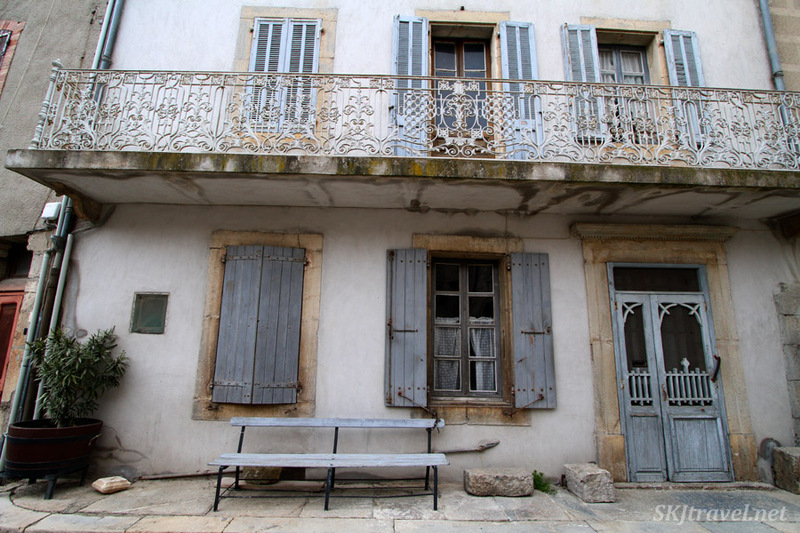 According to the guide, people have taken an interest in purchasing historic houses in the last 10 years; before that they would say, “oh, that’s old junk” and tear it down. 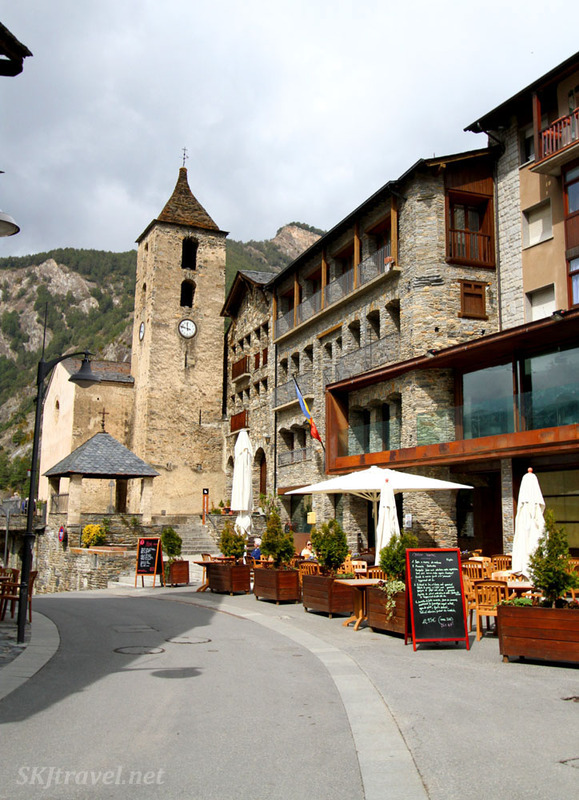 Andorra is relatively new to the “modern” scene. It seems every society goes through this. The older people are the ones calling it junk, just their old stuff. 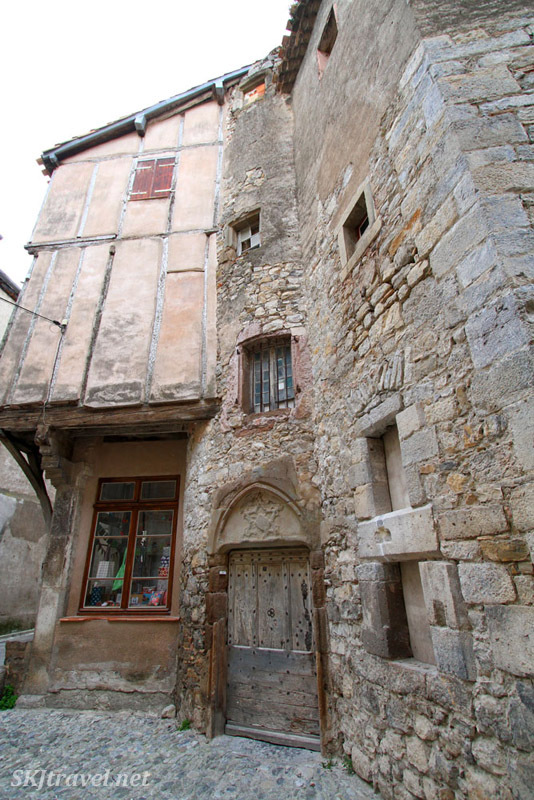 The lady who sold the peasant house came by once to visit and was like, “meh.” No reverence for it being her past. 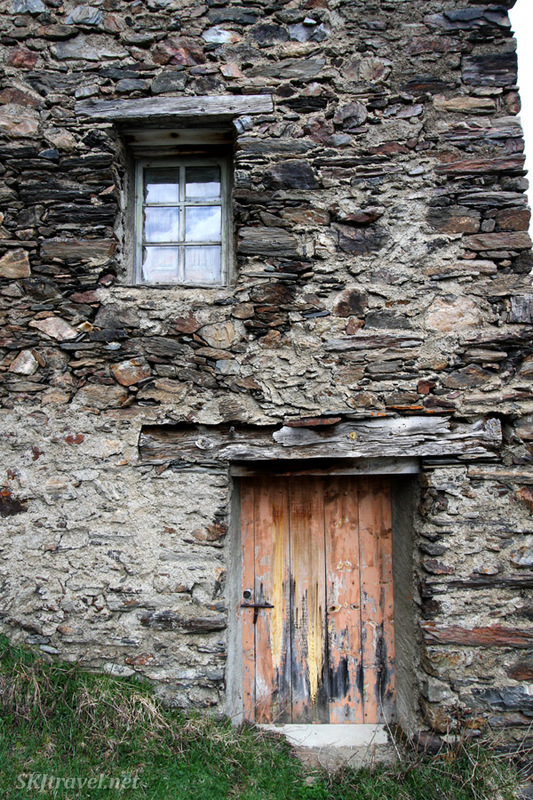 Everything the guide pointed out, most having been sold with the house, was made by the peasant family themselves … the furniture and tools and blankets, everything … as Andorra didn’t really have any importing relations. For such a tiny country, it turns out I’ve had quite a lot to say! 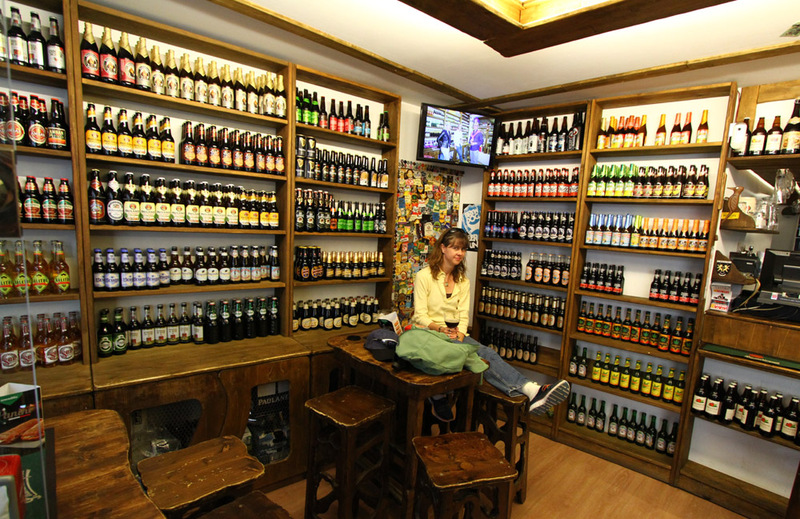 I leave you with this … if you follow me at all you would be surprised if I did not mention the beer selection! 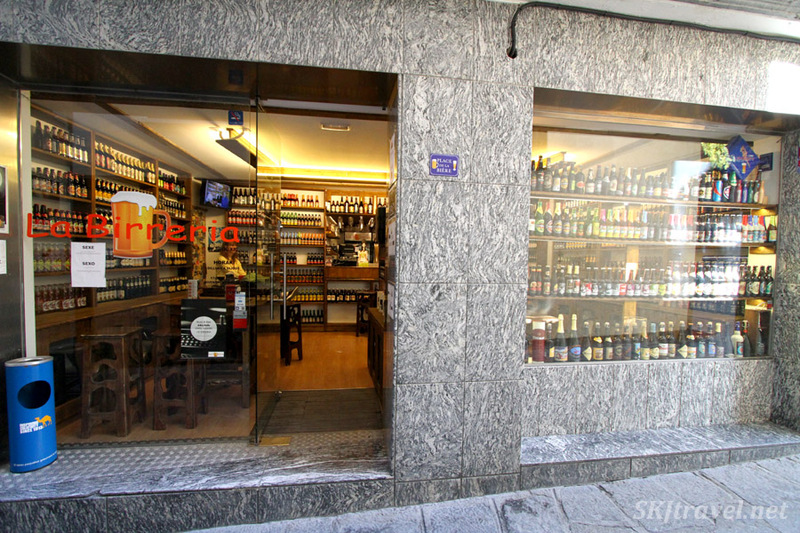 So here’s how we discovered this house of beers from all over the world, including two selections from breweries in my very own ‘hood in Colorado ... this will surprise you guys (not) -- I suffered an injury! I twisted my ankle while walking down some stony steps near the parliament house and fell. You can see the scene of the crime in the very back, where the railing is along the ridge. And notice the peculiar organic component inside this lovely metal sculpture. My new camera hit the ground and fortunately Erik reacted how I would have wished and saved the camera before me. Haha. So it was OK. I was a bit bruised and very upset at twisting my ankle with another week of walking planned on our sightseeing itinerary. So Erik helped me hobble to the nearest pub/restaurant, we asked the proprietor for a bag of ice and I sat there for several hours under ice and drinking some beer. Erik being the chatty fellow that he is, chatted up the proprietor and soon learned he owned this other beer house, which was a store as well as a bar. He said it opened at 5:00, so at 5:00 we hobbled over there (not far away). And in the meantime, Erik had found a pharmacy and bought me an Ace bandage for my ankle. Due to the immediate icing, I recovered quite well within a couple days. Oddly, we decided to go back to the "birreria" several days later. It was fun that the proprietor remembered us and asked after my ankle. 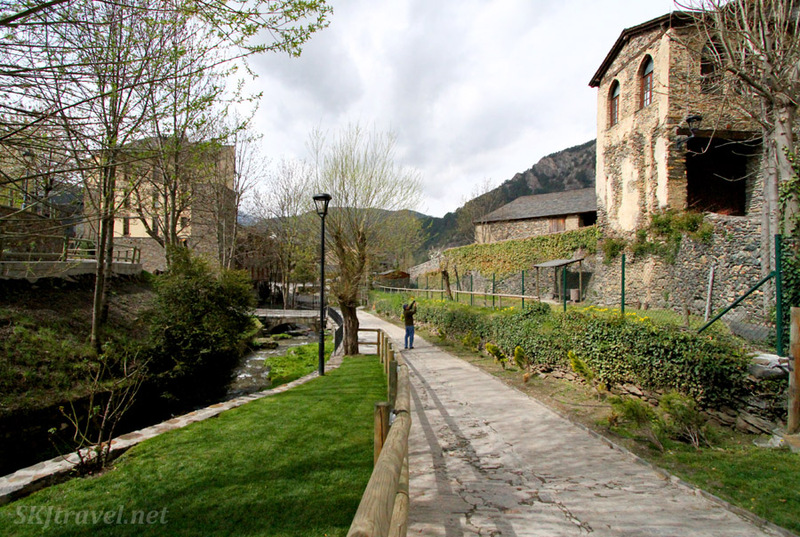 And so dear readers, I leave you with a glimpse of Andorra and recommend its beautiful Pyrenees landscape to anyone. 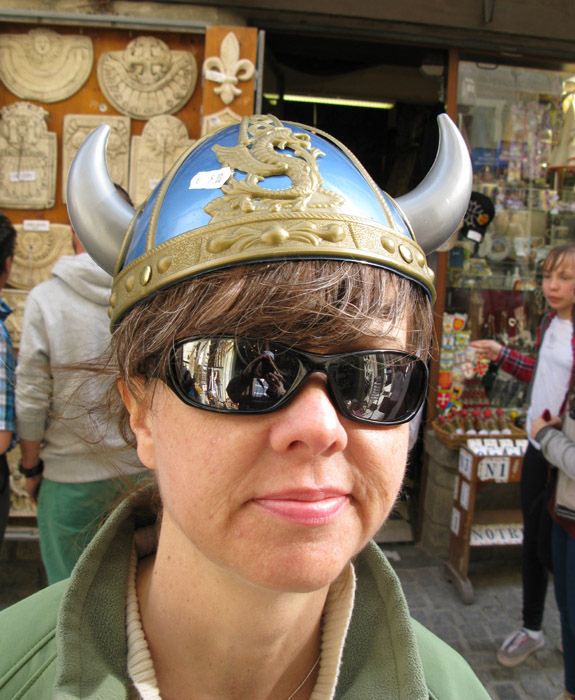 If I get the mojo, I’ll tell you about some day trips into the neighboring countries of France and Spain. 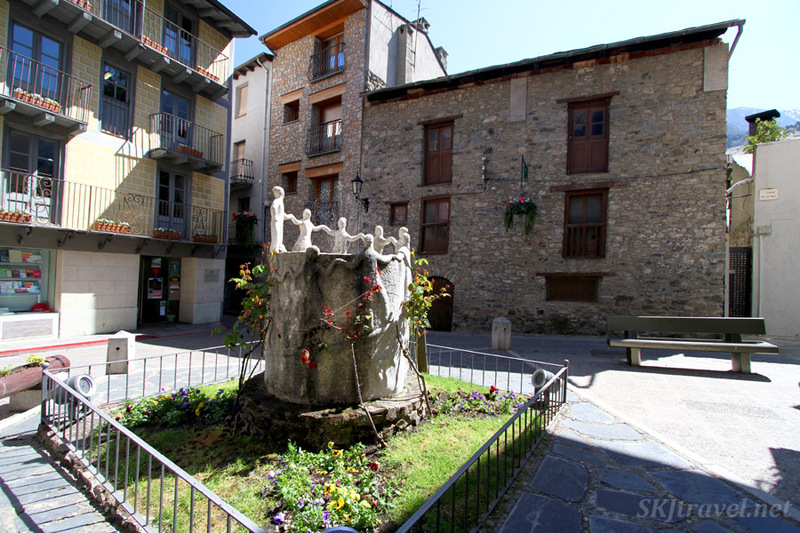 Here's a sweet little fountain in Andorra la Vella. This year (2015) found me landing by plane in Barcelona, Spain, again. It was my 5th birthday abroad and an appropriate mini-anniversary since Barcelona was where I spent my 1st declared “Birthday Abroad.” The declaration means that from that birthday on, I resolved to ignore this ignominious and malevolent annual documentation of my age by traveling to interesting far-away lands, thereby distracting me from having to acknowledge my steadily advancing age. 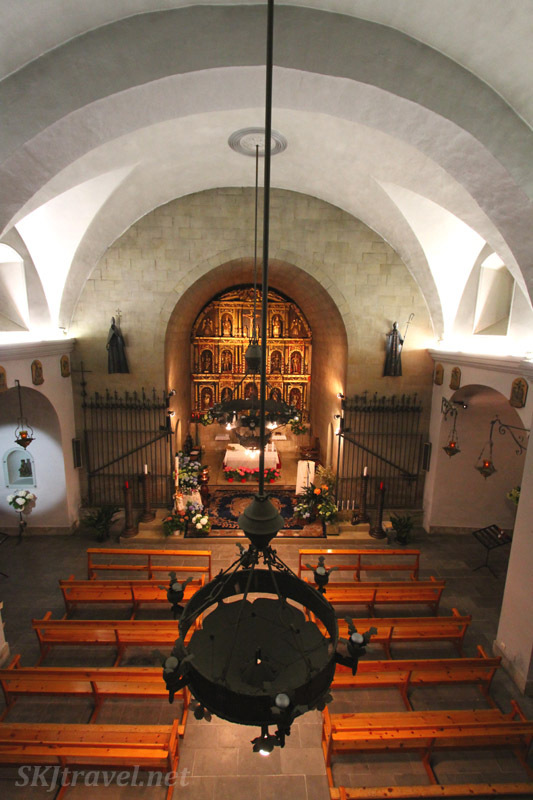 Last time I spent a whole week in Barcelona itself, with one day-trip to Figueres. 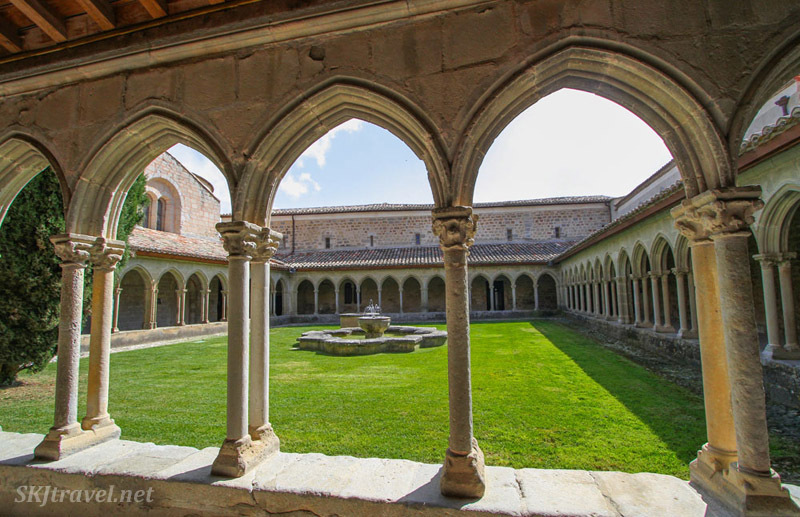 This year, Erik and I rented a car and drove straight out of Barcelona to other locations in Spain, Andorra and France, and returned to Barcelona for just one day before flying back home. The title of this post, "The Masters Revisited," is in reference to a post I made from our earlier trip. 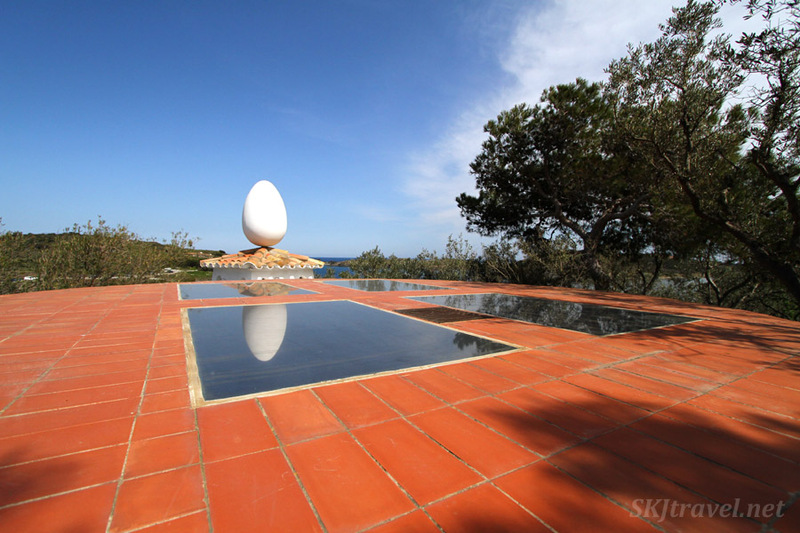 During this year’s trip we completed the “Dali Triangle.” In 2011 we visited the Dali Theater Museum in Figueres … one of the points on the “triangle,” being his most famous immersive creation and museum. 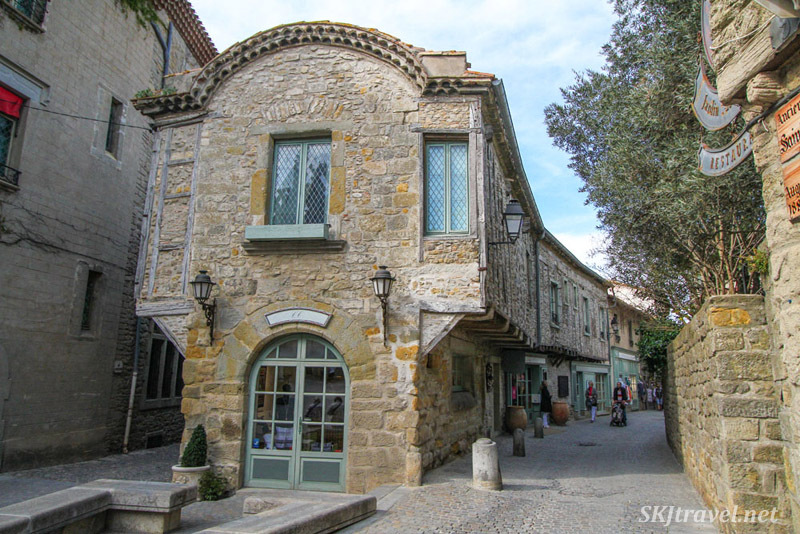 I outlined our time there in my post, “Museums of the Masters.” The other two triangle points, northeast of Barcelona, we accessed this year from Cadaques. But first, by pure luck, we stumbled across Dali’s imagination grounds. 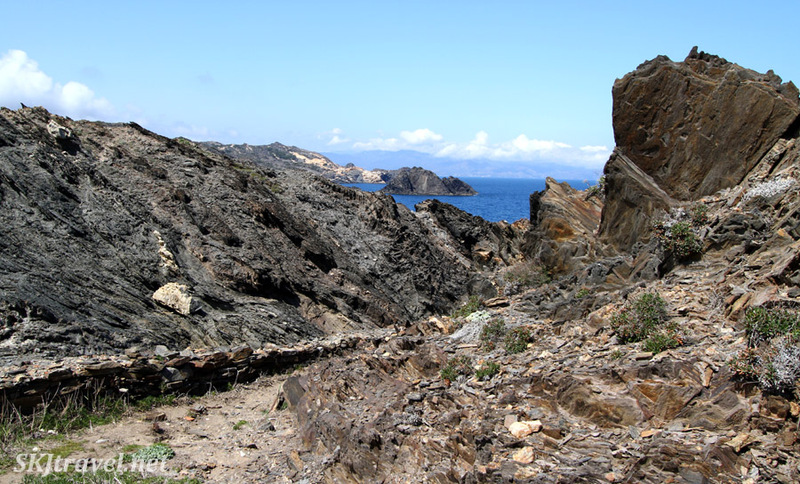 That is to say, the coastline that inspired much of his visual thought and ideas – Cap de Creus. 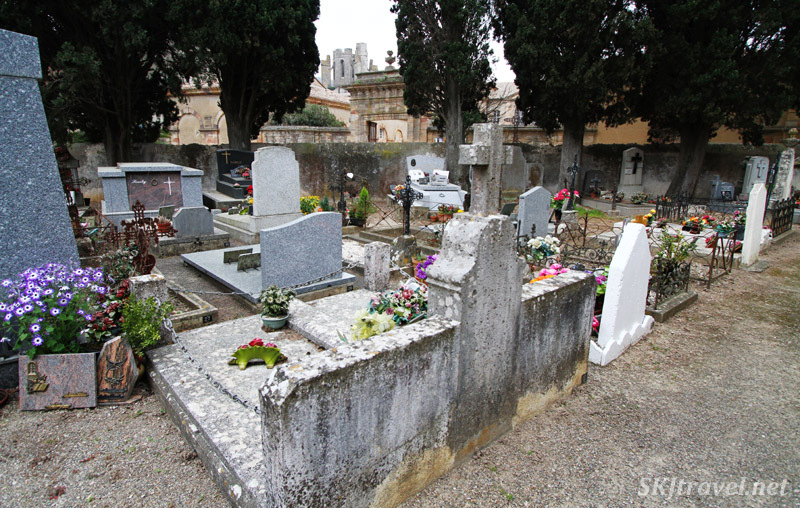 We had time to kill in the morning before our ticketed time to tour Portlligat, his home for over 50 years, (must take guided tour to see the inside of the home). I saw on our map there was a lighthouse on the Cap, and that’s really what we were driving to. 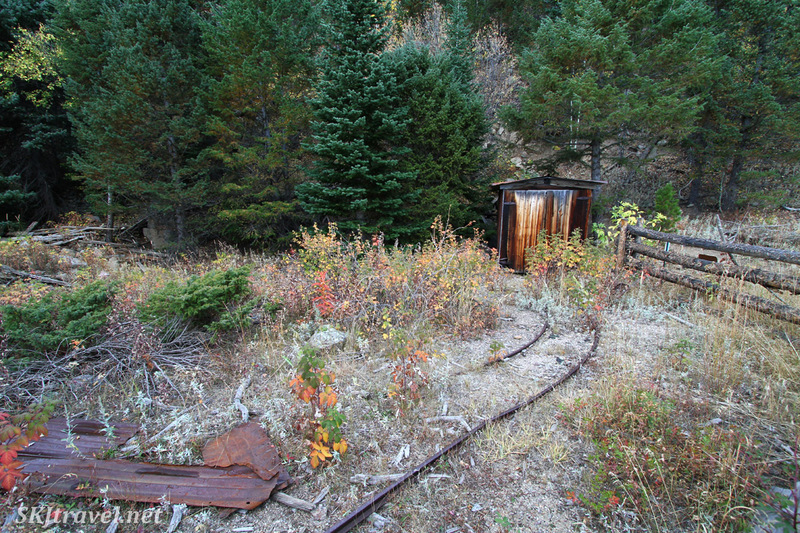 I happened to notice a pull-out along the road where a number of cars were parked and there was a trailhead sign. I suggested we check out whatever was there. 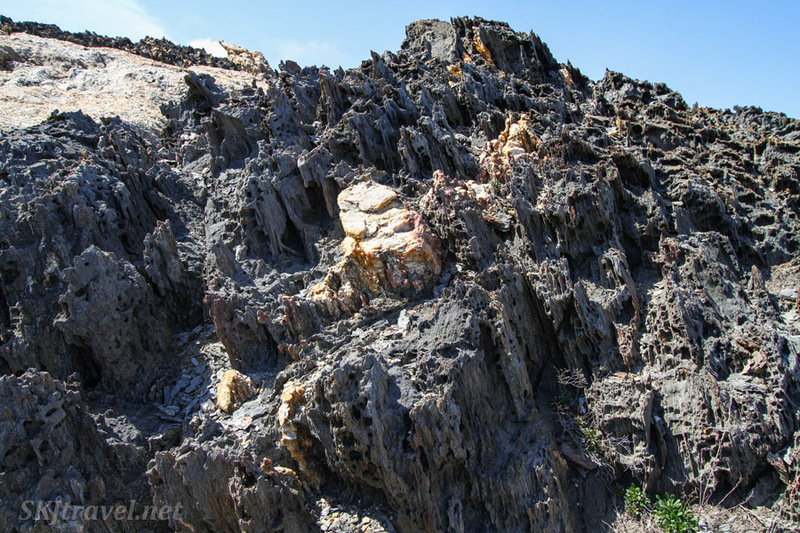 And so we stumbled onto this stretch of seaside whimsy, where the rock fashions itself into shapes that can be interpreted like clouds, and the eroded volcanic rock produces fields of strange abstract shapes and textures. 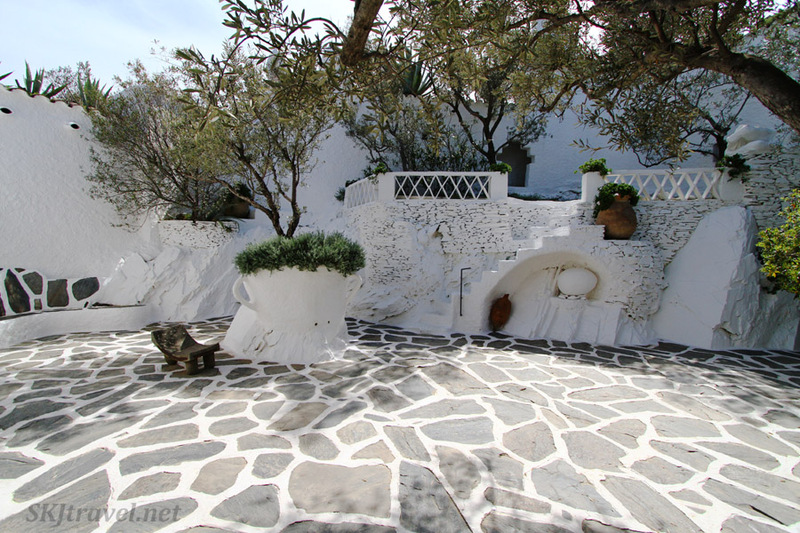 You can really see some of Dali’s iconic elements of his paintings when you look closely at the rocks. It was very cool and quite an epiphany. Decades ago, some … shall we call him a moron … purchased some of the land and built a Club Med resort there, desecrating Dali’s organic muse. 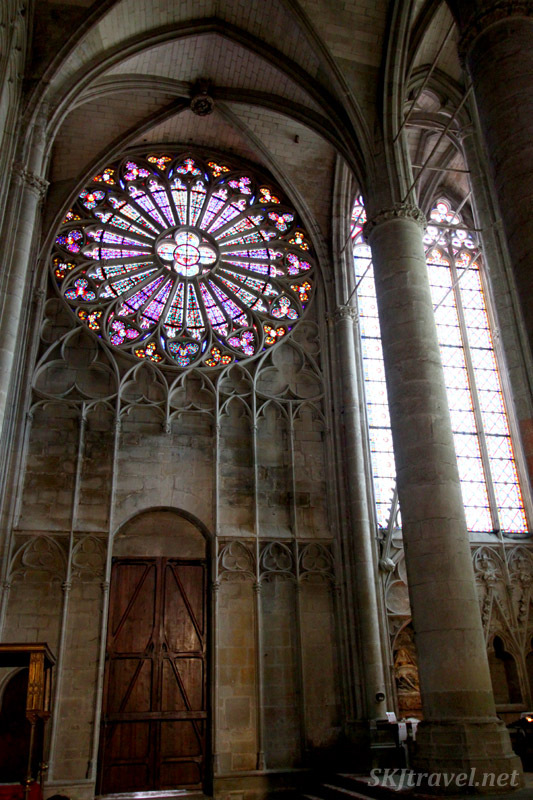 But about 10 years ago it closed down, and in a heroic effort by locals, was completely, utterly dismantled. Everything torn down and carted away to restore the natural shore lands. Impressive and a testament to the local love of Dali to so faithfully resurrect his beloved coast. Here’s a look at some of the rooms, filled with things bizarre, interesting, pretty, disturbing, and a list of other adjectives. 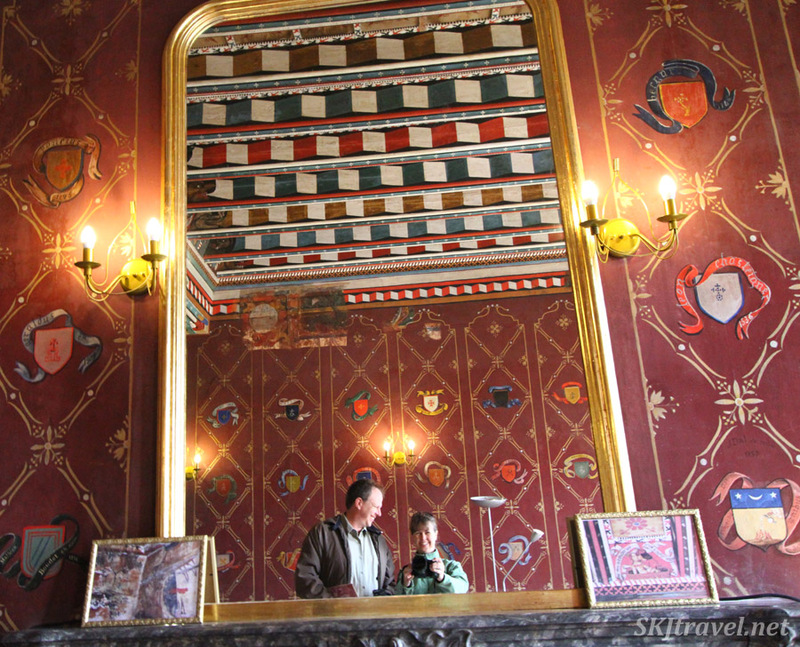 Above all, one could never be bored in these rooms … so much to look at and contemplate. Even the sparsely furnished rooms have their own unique level of contemplation. In this photo, I’m looking up at a clear plastic floor in which the cut-out man is lying face-down on, looking into the room below him. This really amused me. And here, as promised, a variety of eggs sitting around the outside of the buildings and nestled into courtyards and gardens. 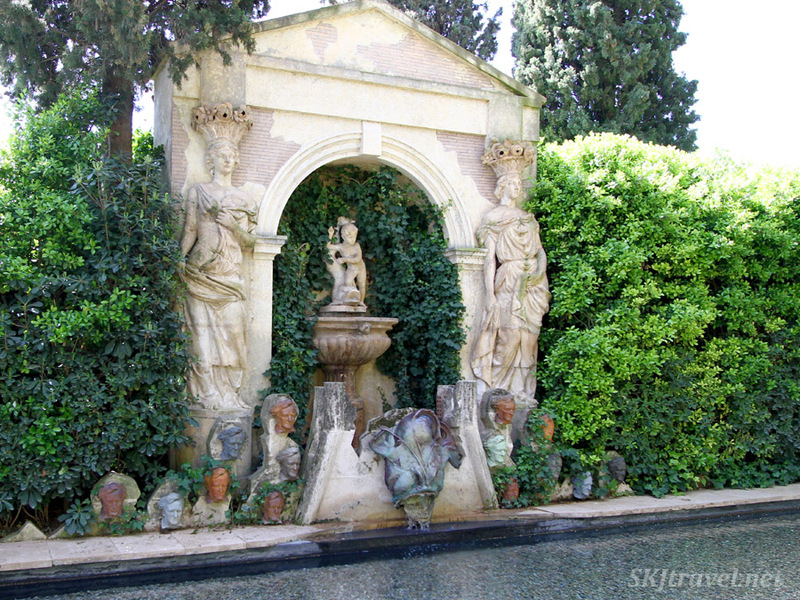 Do you see the Michelin man next to the pool? There was another one nearby sitting in a rocking chair. 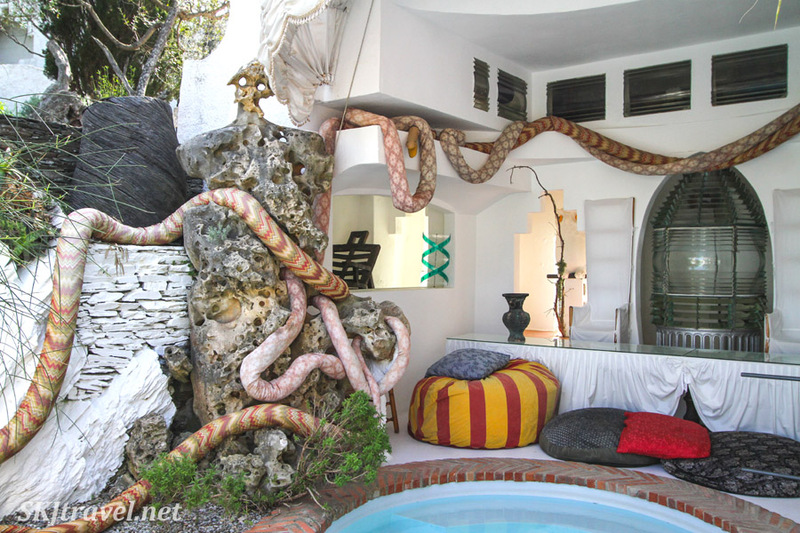 I really loved the tangle of fabric snakes winding (well, snaking) around the pool, and the sitting nook at the end of it. I first walked by this guy on the ground, and Erik was standing on a platform above it. He said to me, “Can you see what that is?” I replied a bunch of bricks or something. He told me to come up to where he was. Looking down, you can see it’s the figure of a man lying down. From ground level, it just looks like a random line of rocks in the yard. Iconic Dali, of course, seeing different things depending on the angle of view. Dali was a lover of cats. (hurray) And there were several wandering around the courtyard where they sell a small selection of concessions. 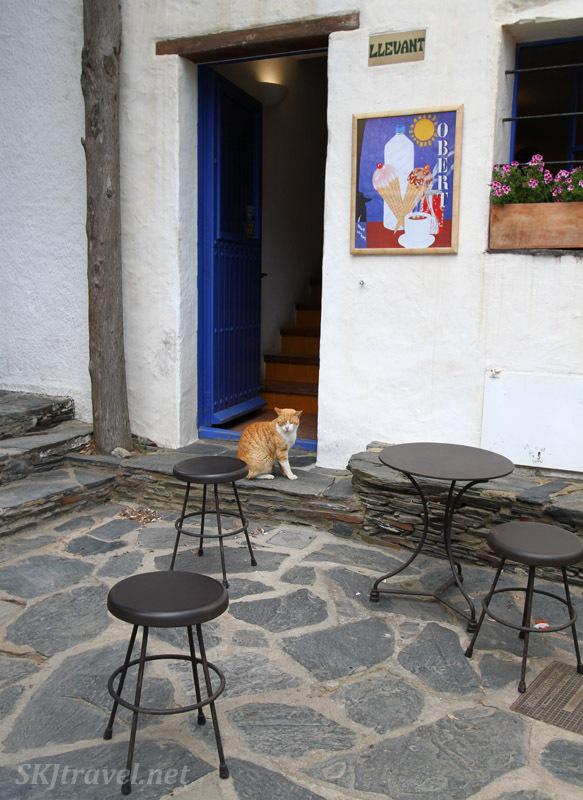 We would see many, many cats in nearby Cadaques. 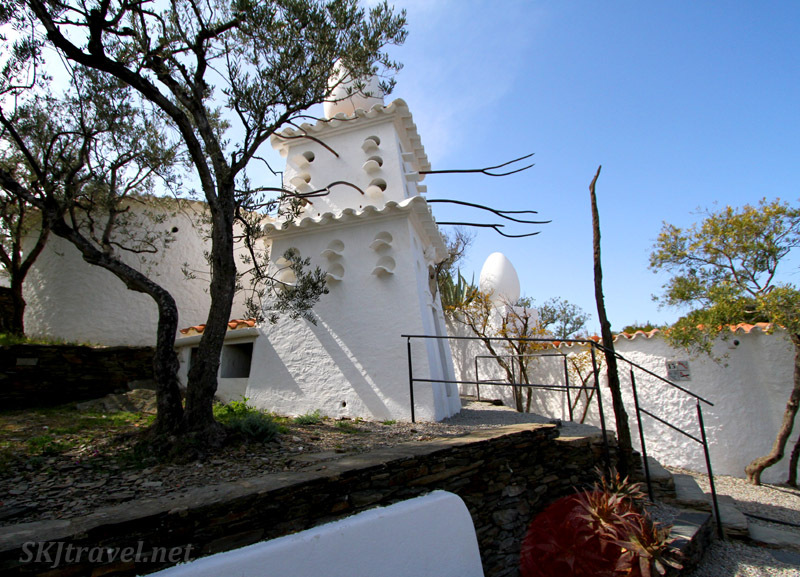 And the third point on the Dali triangle, the Gala Dali Castle in Pubol. 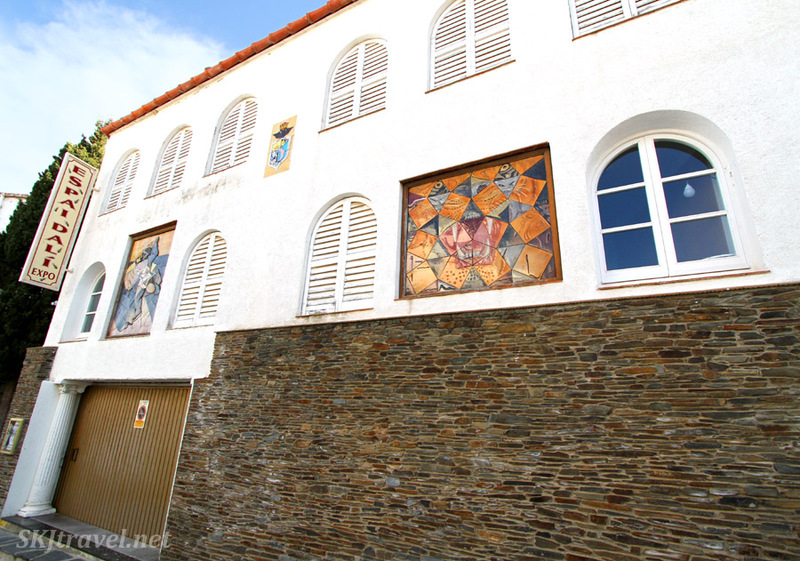 Pubol is a small town and the cobblestone streets around the museum are devoted to its promotion, with souvenir stalls and paintings on the buildings. The painting here is one of my very favorites of Dali’s … I took a picture of it at full size (which is huge ... much taller than I am) in the Figueres theater museum and posted it back in 2011. 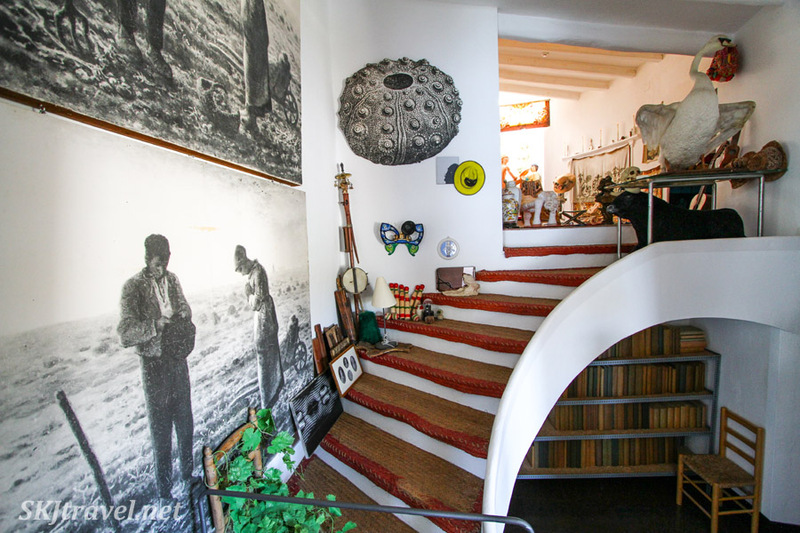 Dali purchased the small castle for his wife, Gala, “to create an oasis of rest and refuge.” When she died, he made her mausoleum in the basement … a room heartbreakingly bare for a creation of the typically excessive Dali – simply the tomb and four animal statues gathered at the far end. 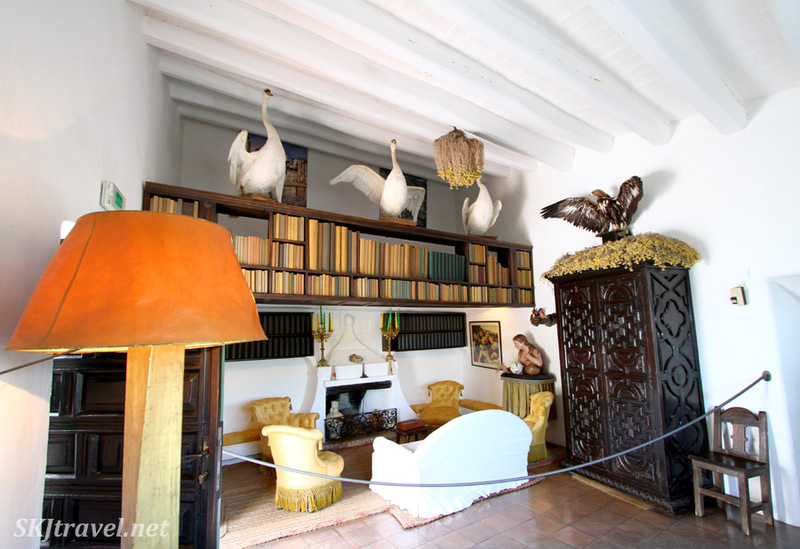 After her death, he lived in the castle himself until his health became extremely poor and his friends moved him to live at the theater museum in Figueres. The whole castle, in fact, felt very somber and sad. Dali always claimed that Gala was his muse, and it seems like it was genuinely true. 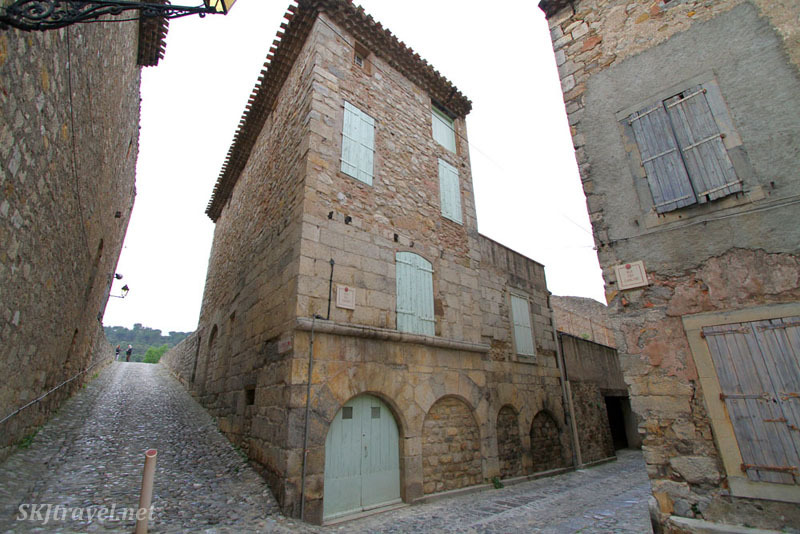 Living alone, his surroundings were spare, lacking that lustrous creativity of Figueres and Portlligat. His artistic flamboyance was perhaps merely the expression of his love for her. 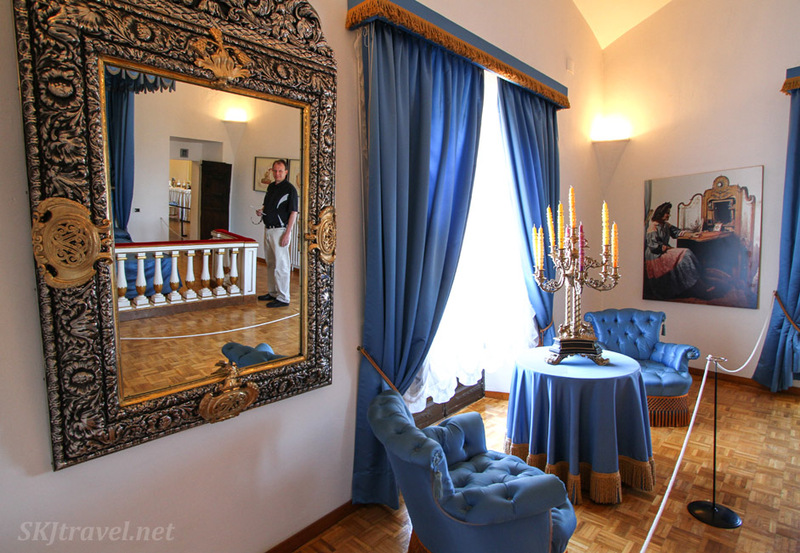 Mysteriously referred to as “the blue room,” Dali slept here. 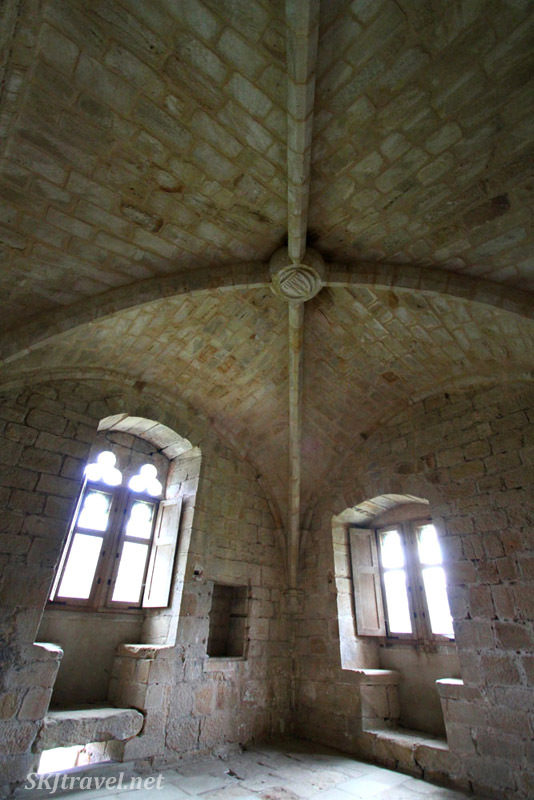 It was the event of this room catching on fire that prompted his friends to move him to Figueres. Can you spot the thing that is not like the other things? 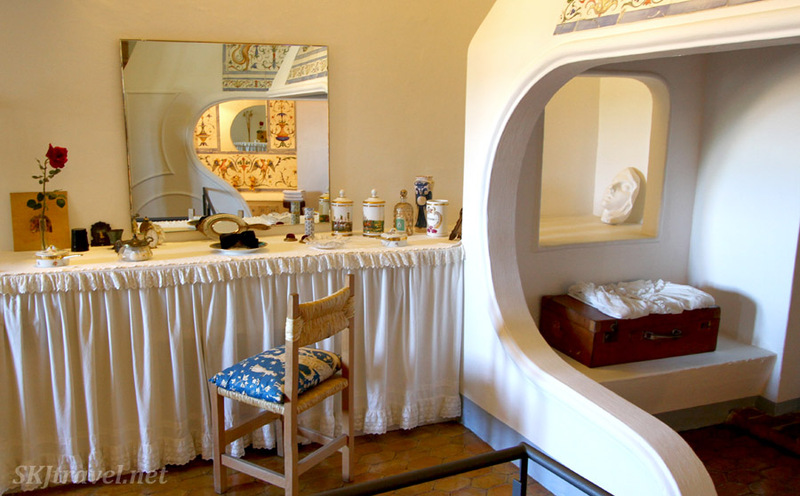 This was Gala’s private bathroom … on the right you can see the edge of the fireplace. I thought that feature was pretty neat – a little nook with a fireplace in it and a bench at either end of the nook to sit by it and warm one’s self. 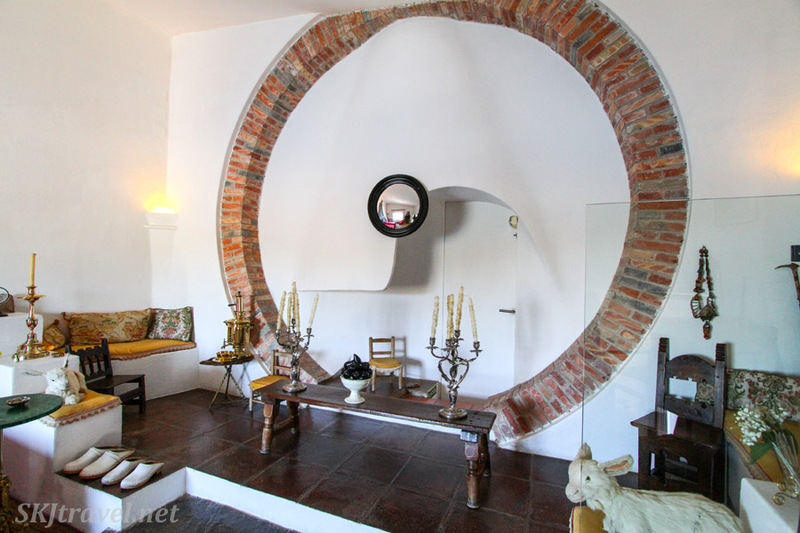 I also like the succession of curves you can see in the mirror, of the fireplace and the opposite wall reflected. 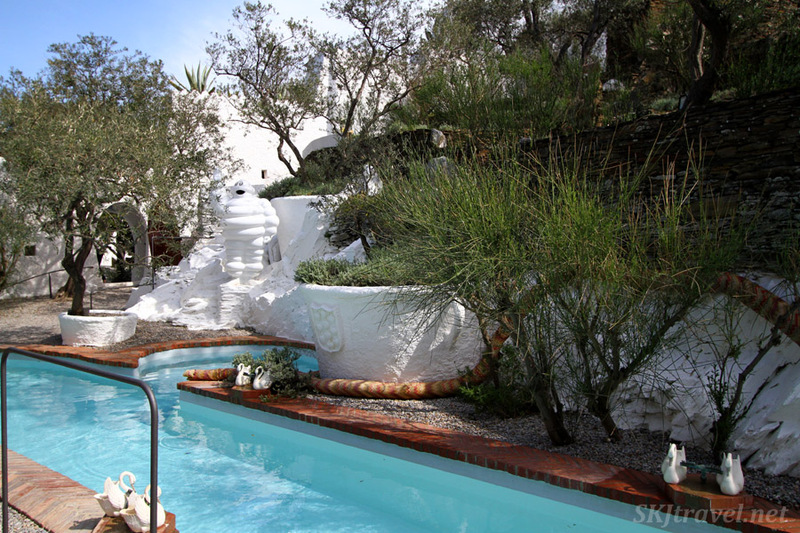 And here are the small gardens and pool at Pubol. 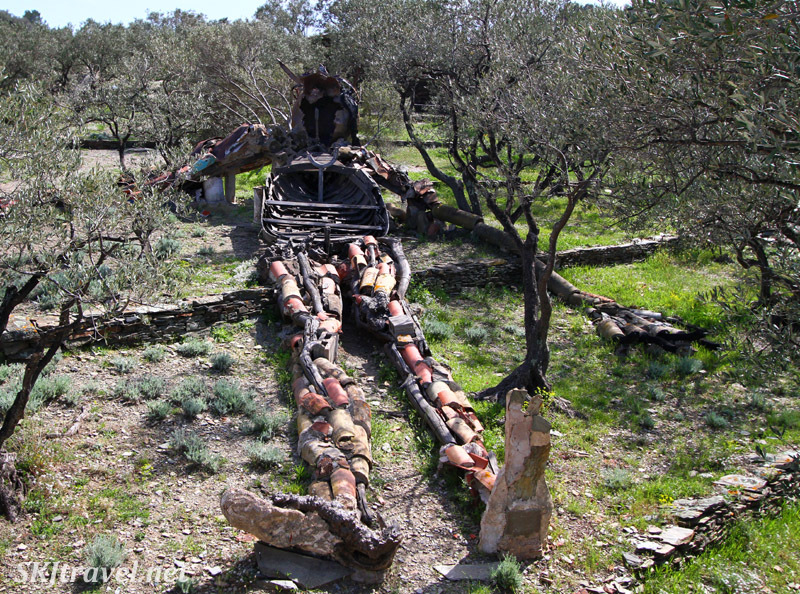 Compare to the fantastical setting at Portlligat with snakes and Michelin men. 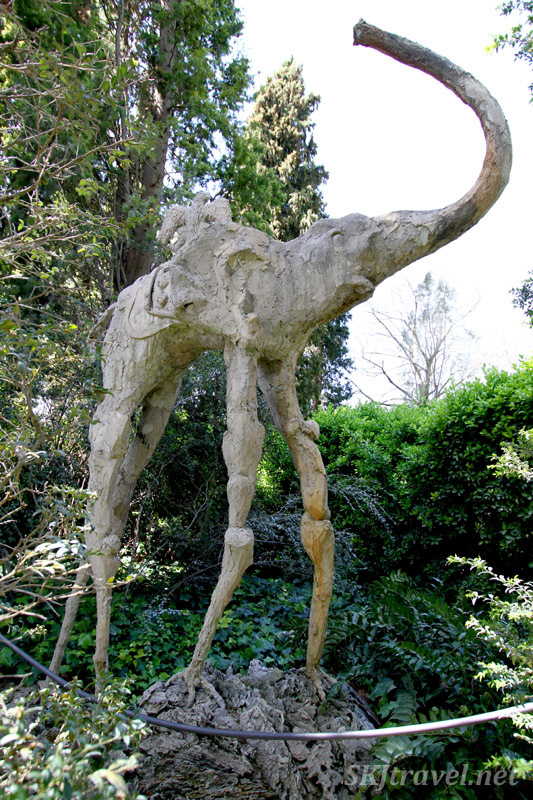 The elephant, though, there are several of these statues in a small hedge garden at the castle. I really like these elephants, and posted a photo of this recurring Dali image from the jewelry gallery at the Figueres theater museum from our visit there. 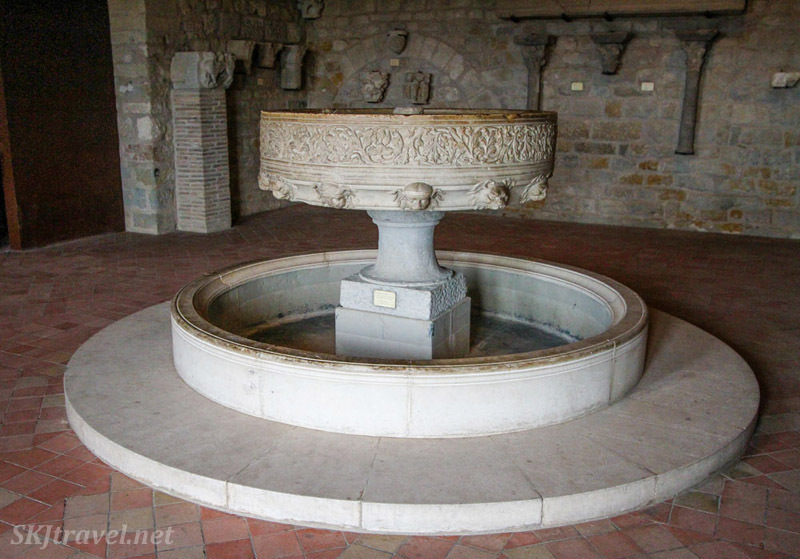 And now … though this post is getting rather lengthy (… to complete the parallel to my original "Museums of the Masters" post from 2011) I present some photos from another Gaudi museum we visited during our one day back in Barcelona. 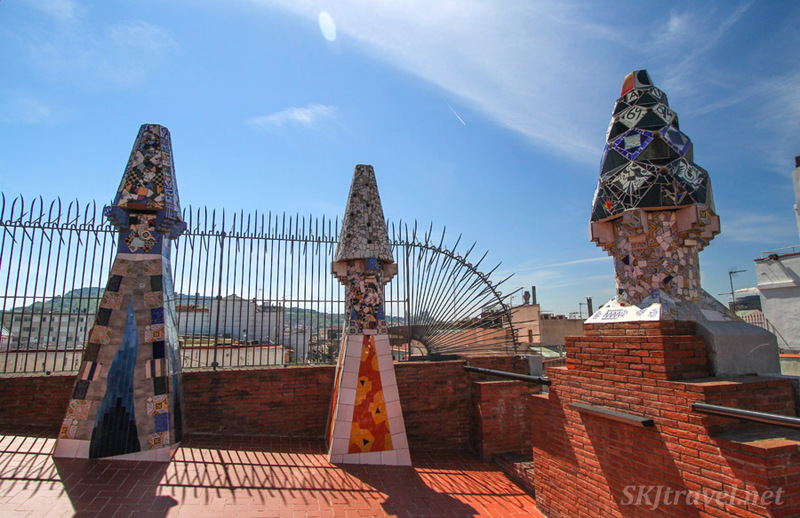 We were quite excited to discover there was another museum here, having visited the Sagrada Familia, Parc Guell, the Batllo and the Pedrera last time. 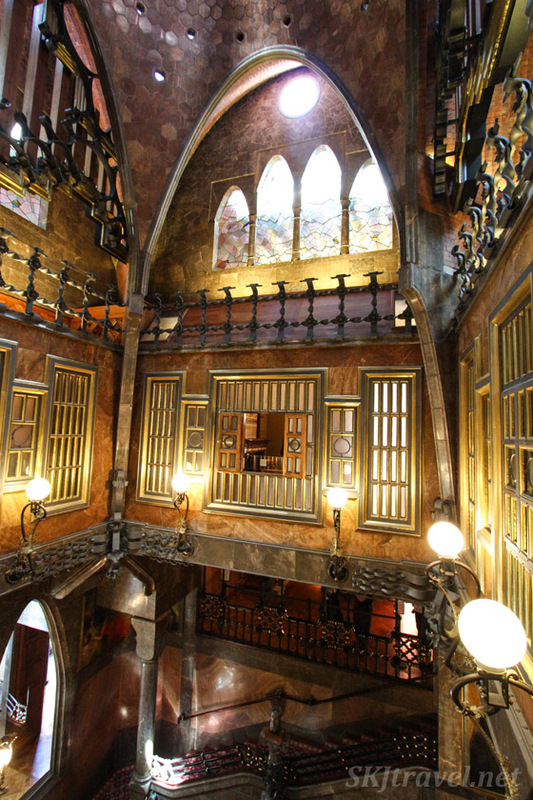 We stumbled across the Palau Guell because it was right down the street from our hotel, just a couple blocks from the Ramblas. Stumbling across things is always a bit more exciting than visiting something already on an itinerary. The “palace” was begun in 1886 and finished in 1890. Like all of Gaudi’s architectural works, it seems to me much more modern than that. 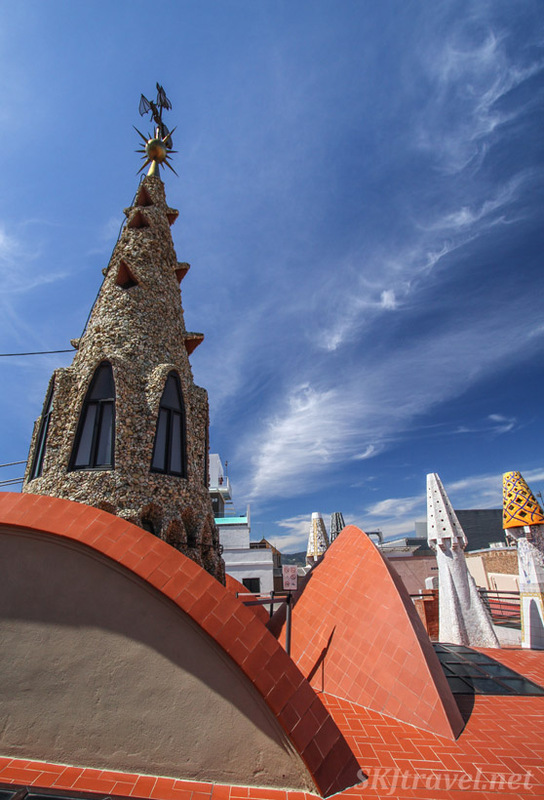 According to the brochure (yes, I started picking them up again), "It is the only example of domestic architecture that Gaudi completed and that has not undergone significant alteration." 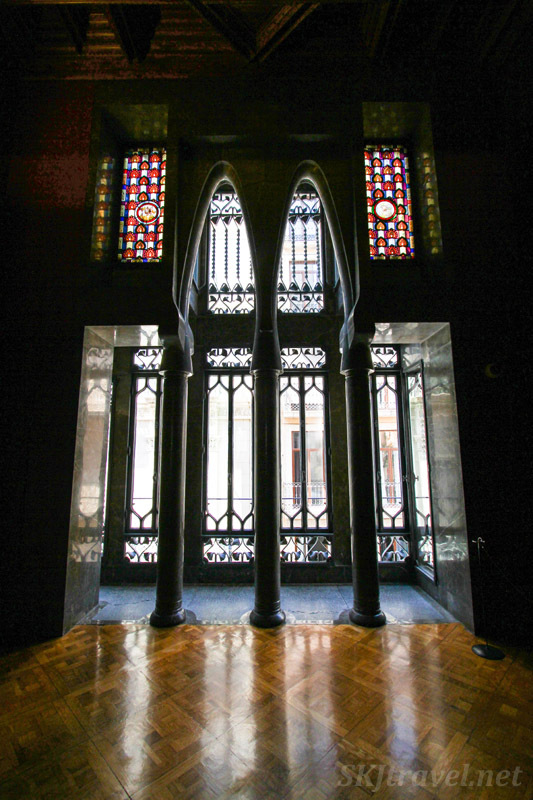 I really appreciated my wide-angle lens here at Palau Guell to capture some of the interior settings. 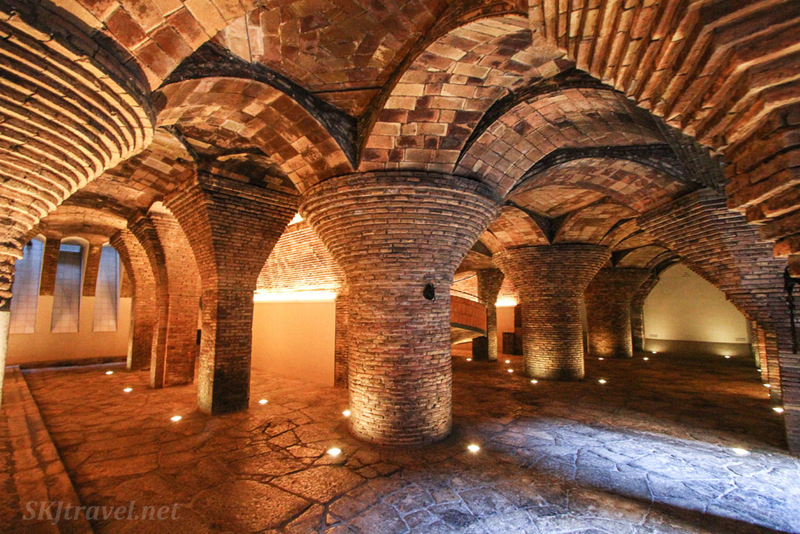 The first is inside underground caverns that were used as stables. Inside this large atrium-like room shown in the first photo below, was an impressive organ which regaled the throngs of visitors at regular intervals with a song that reverberated throughout this room and around the many-leveled house. I didn’t realize, actually, how many levels there were until I walked down the stairs all the way from the roof to the ground level! 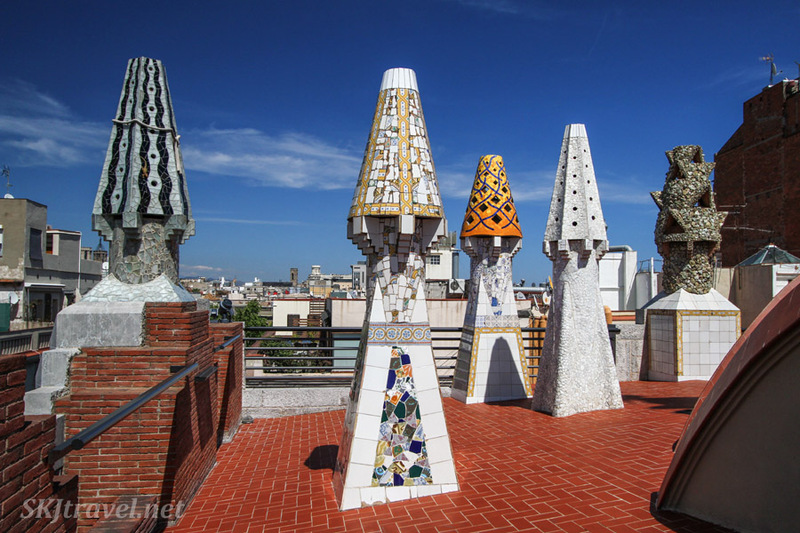 And now, what I think is the crown jewel of features Gaudi designed into the homes he was commissioned for – the rooftop. These are always magical places with fairy cones and sculptures. And it’s amusing to me that these imaginative rooftops look down onto the most ordinary of courtyards … in contrast they seem almost appallingly plain ... apartment buildings with laundry drying on the balconies. 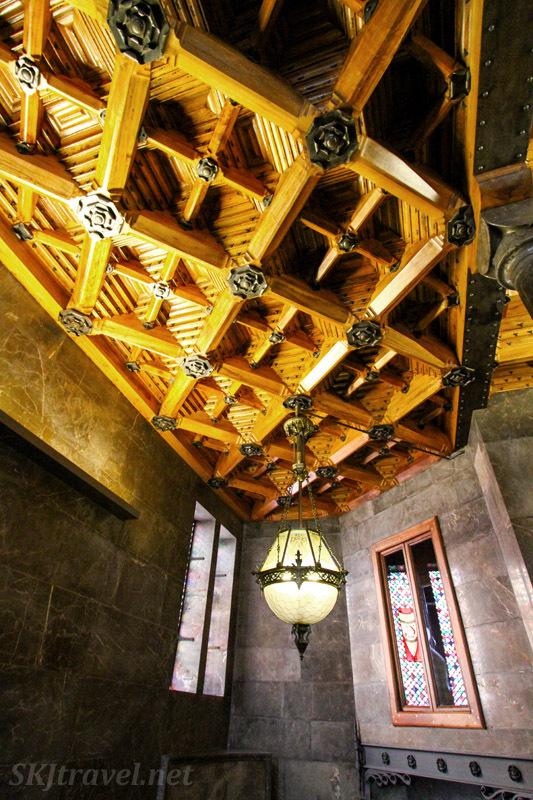 To think that just above their heads lies such an opulence of imagination and creativity. 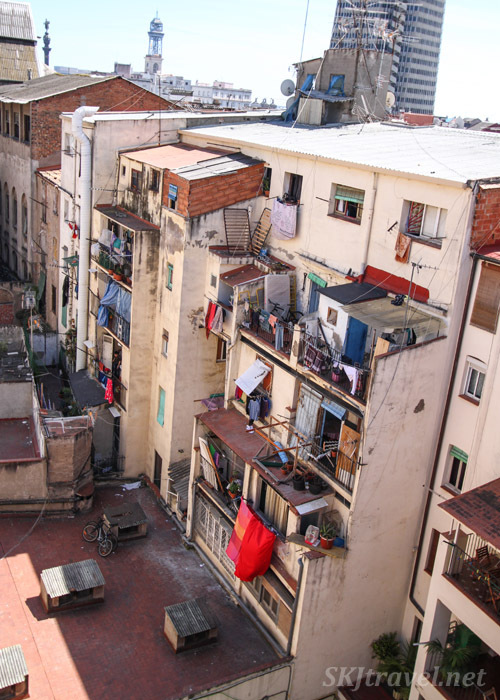 I do wonder, though, if the blessed inhabitants of the Gaudi-designed homes utilized their magical rooftops for such mundane tasks as drying laundry. 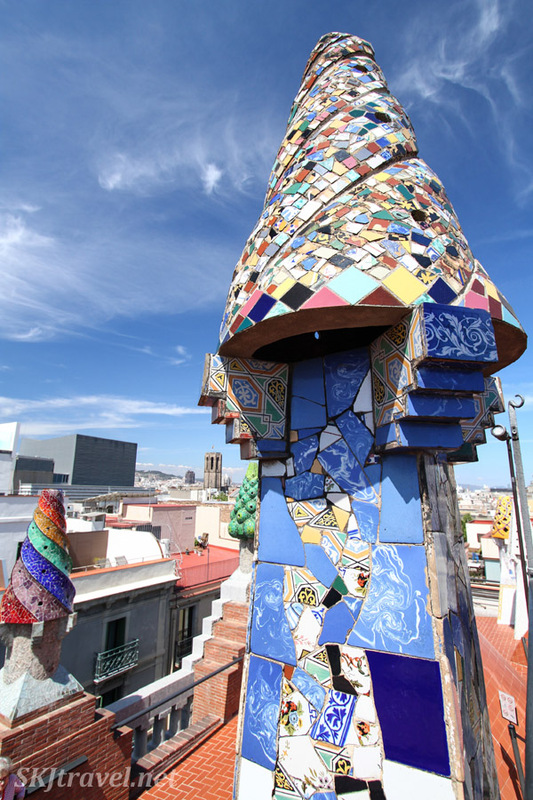 OK, my dear viewers, I leave you here … having glimpsed some more Gaudi and completed the Dali Triangle.